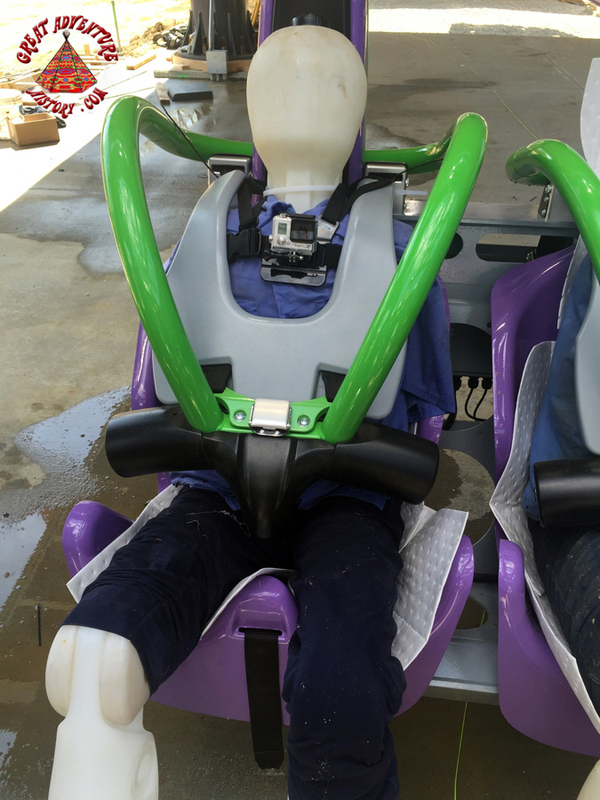 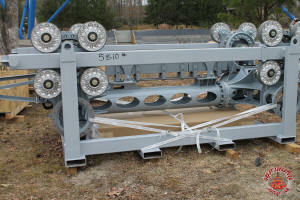 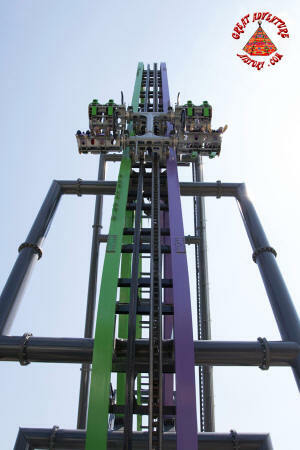 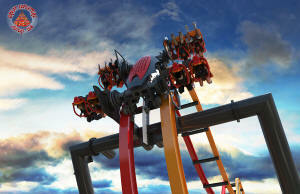 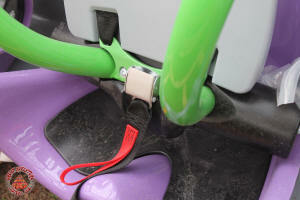 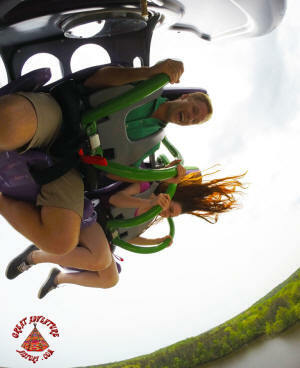 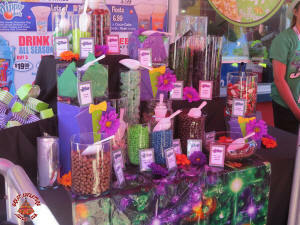 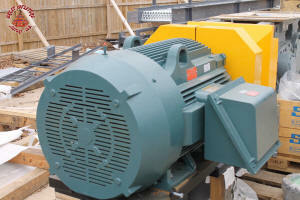 The amusement industry has constantly been innovating, coming up with the next "big thing" in new ride trends. Roller coasters have been a huge part of this, with designers and manufacturers trying to create new concepts that offer new thrills. 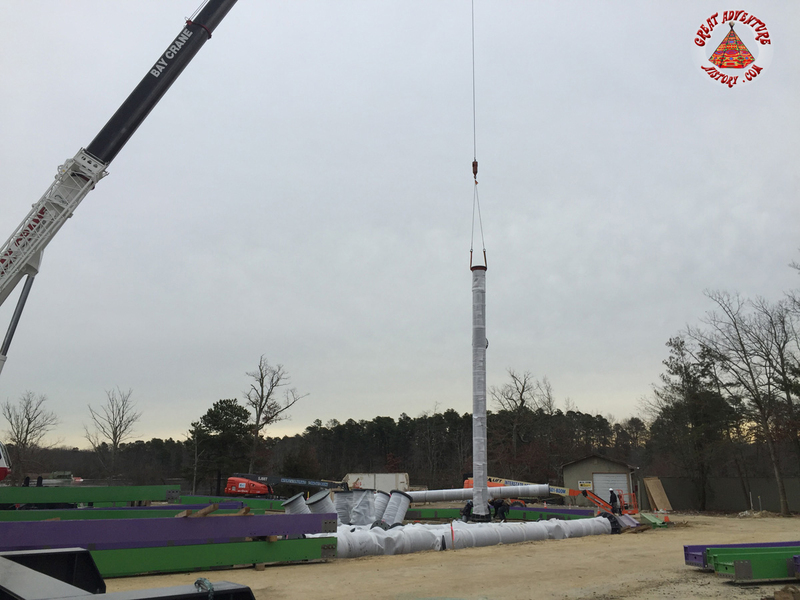 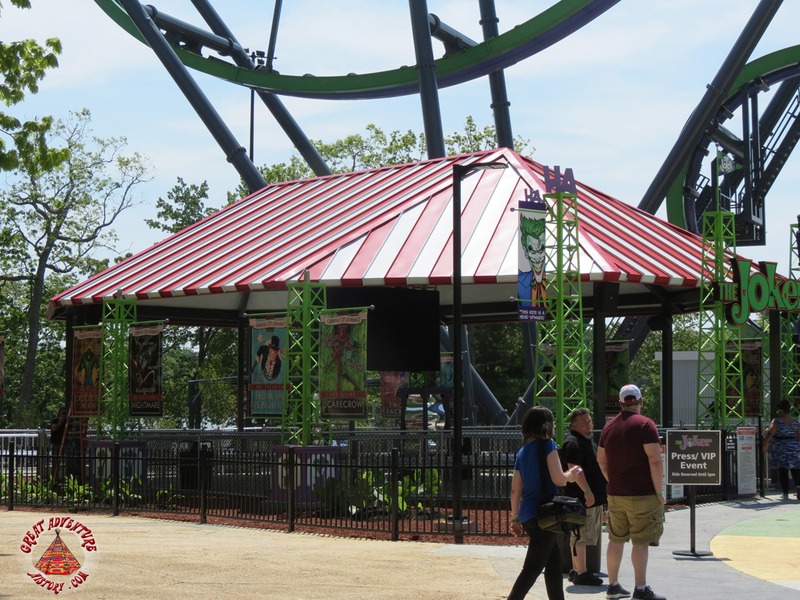 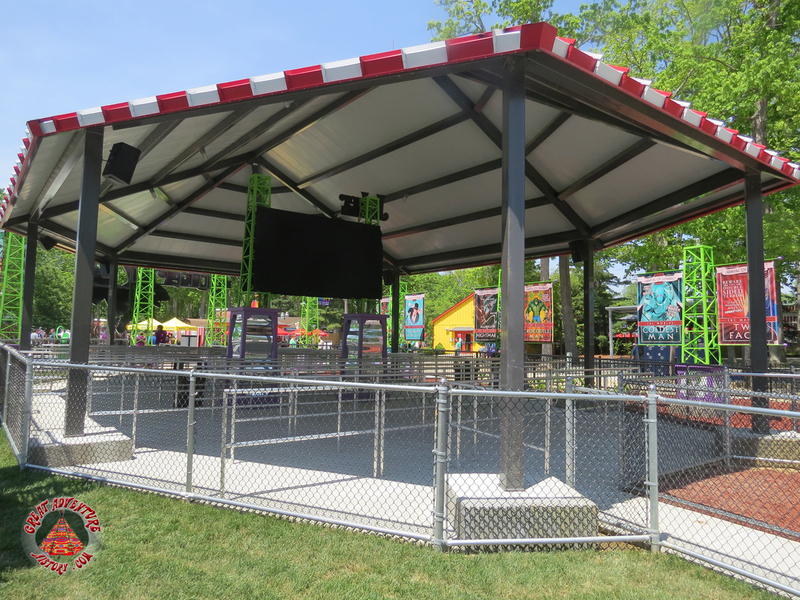 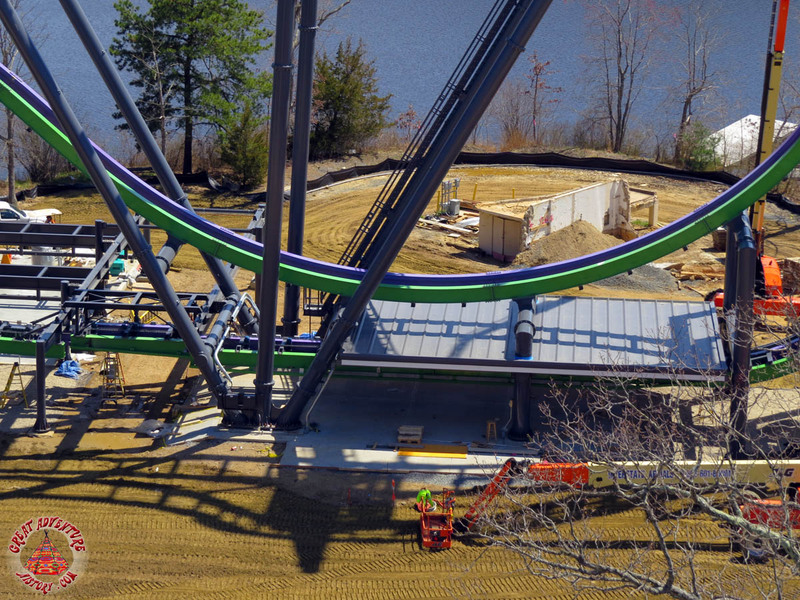 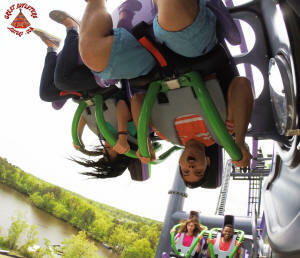 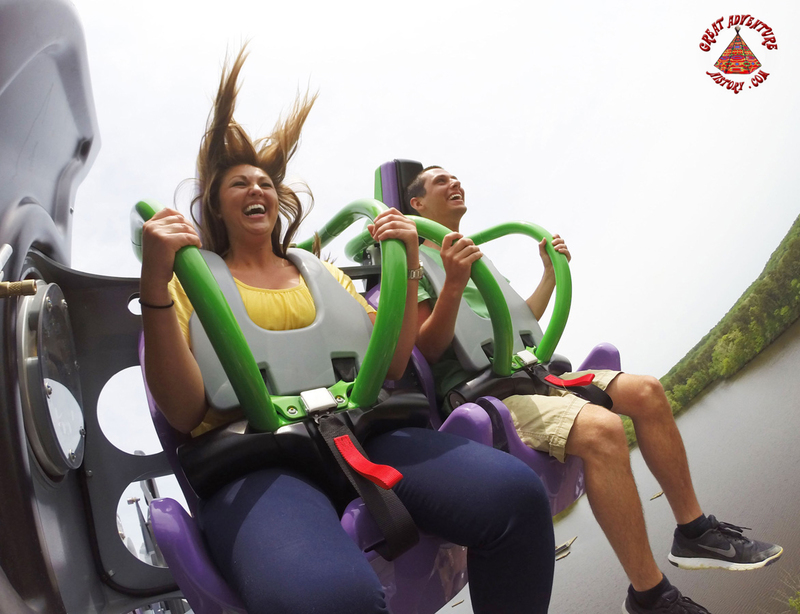 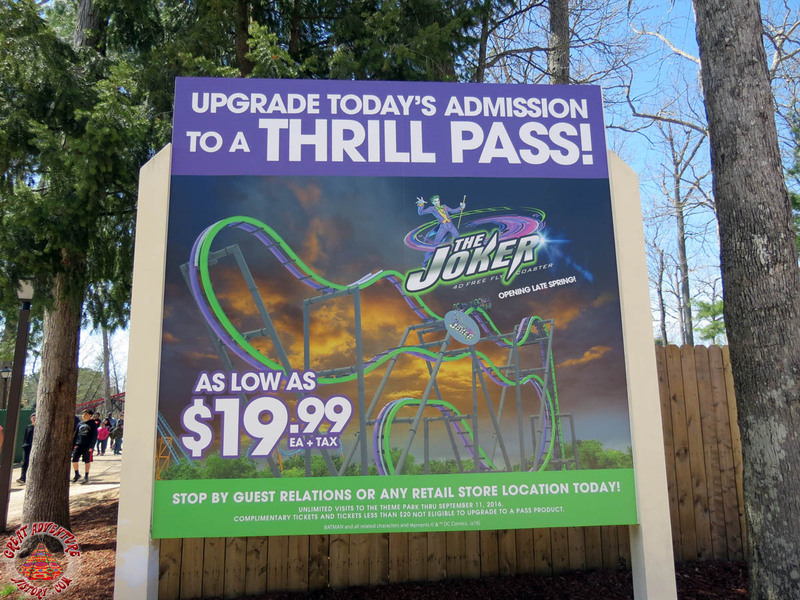 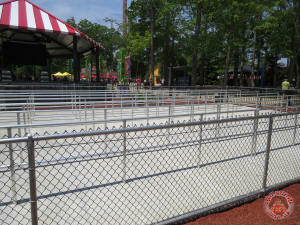 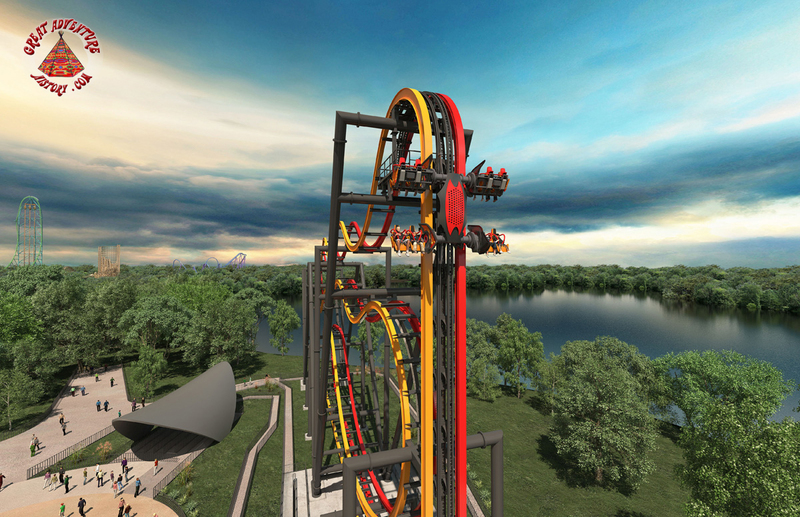 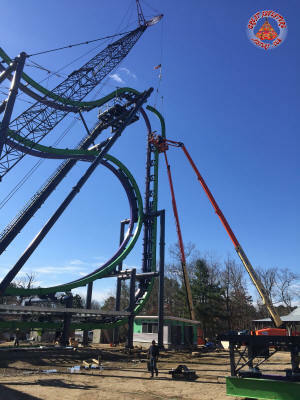 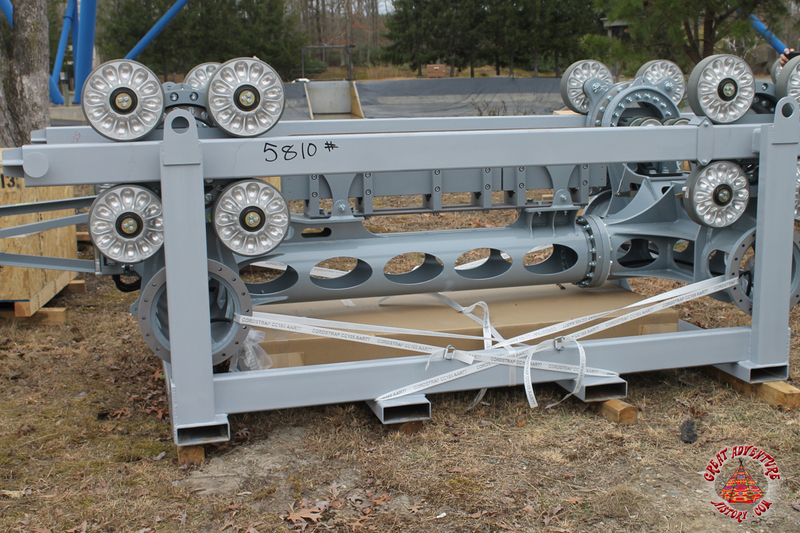 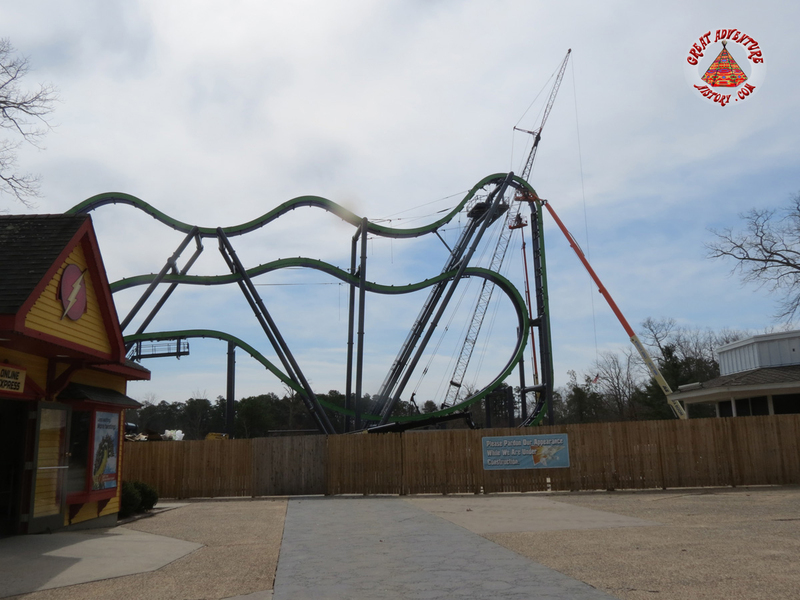 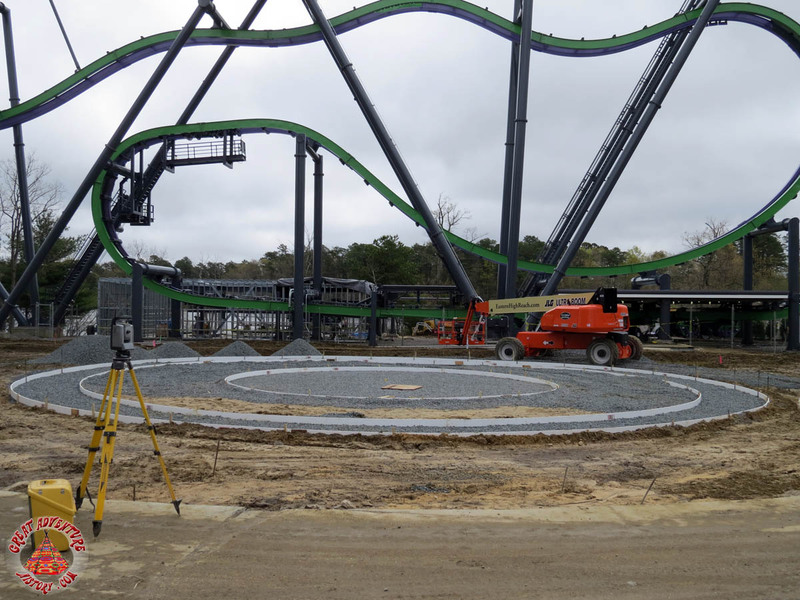 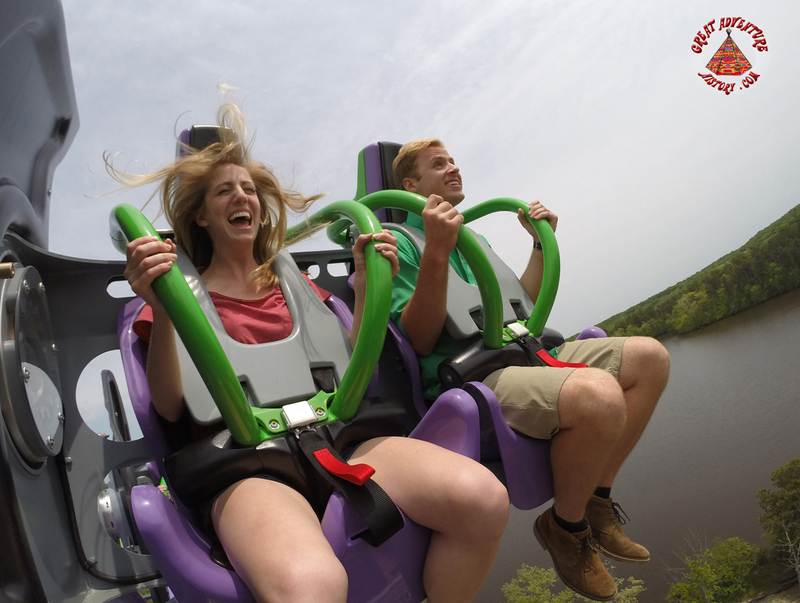 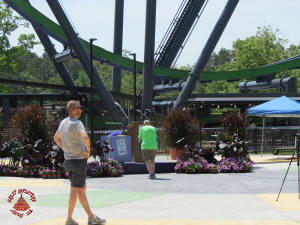 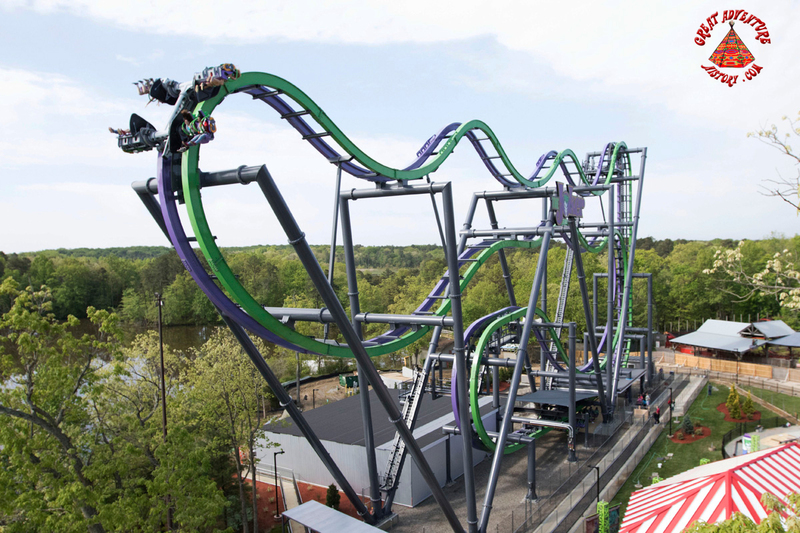 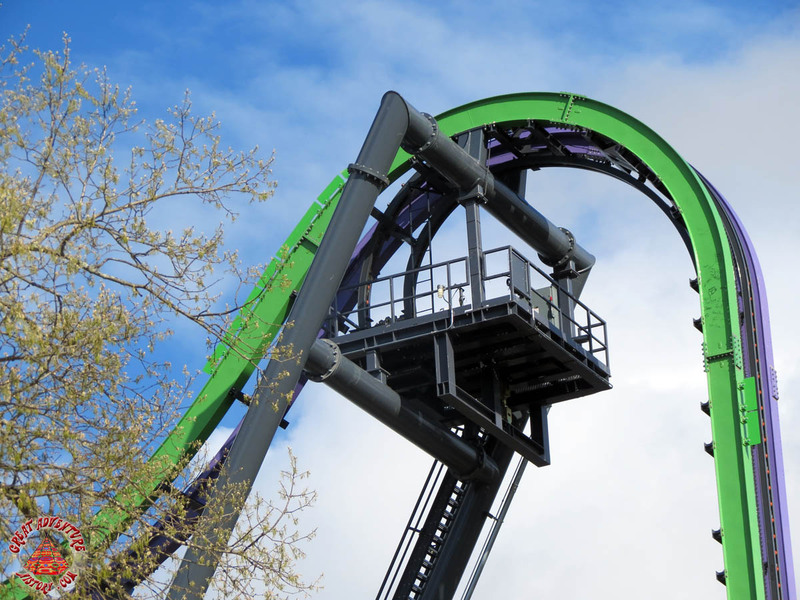 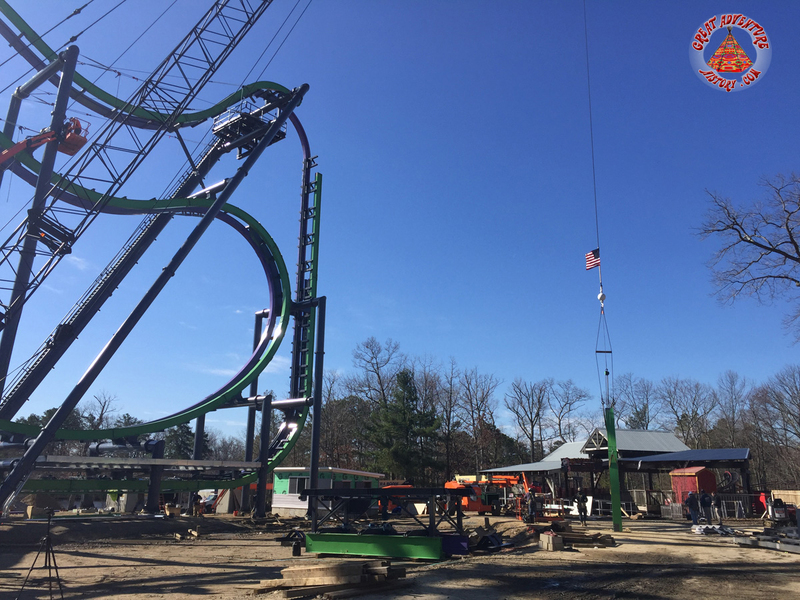 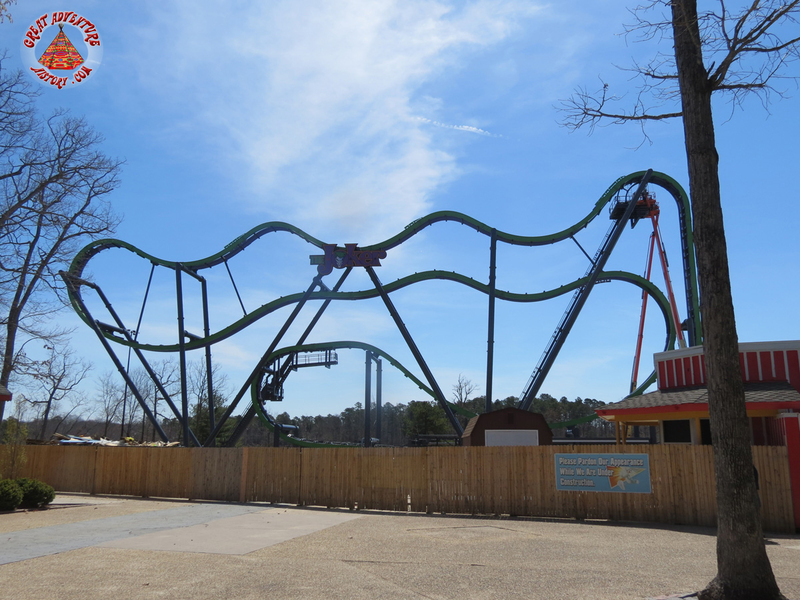 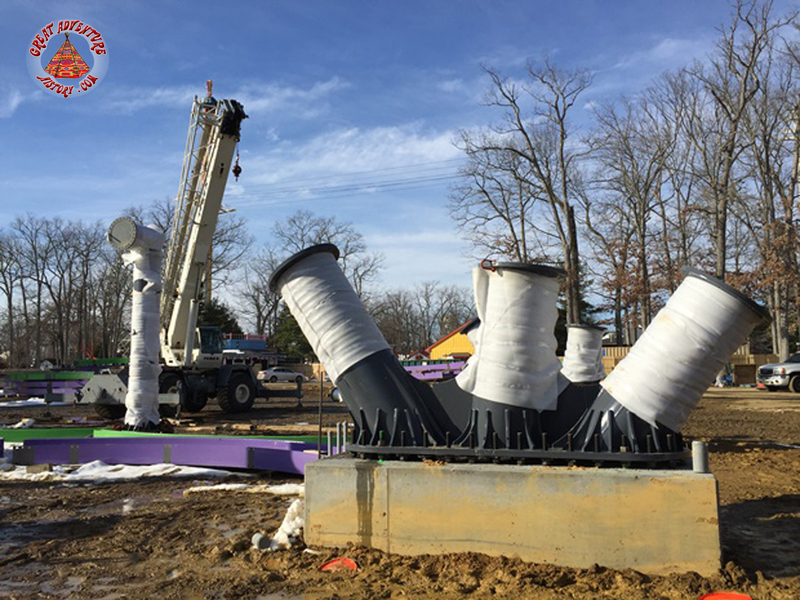 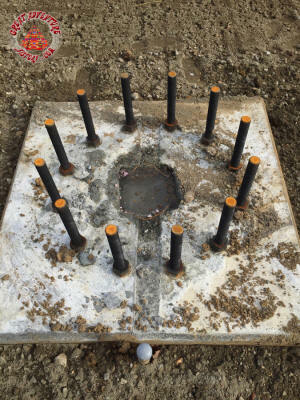 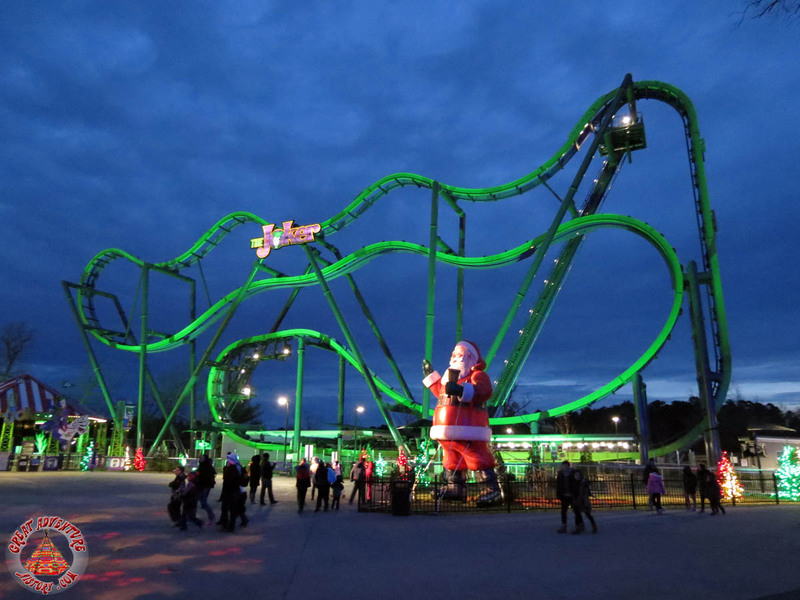 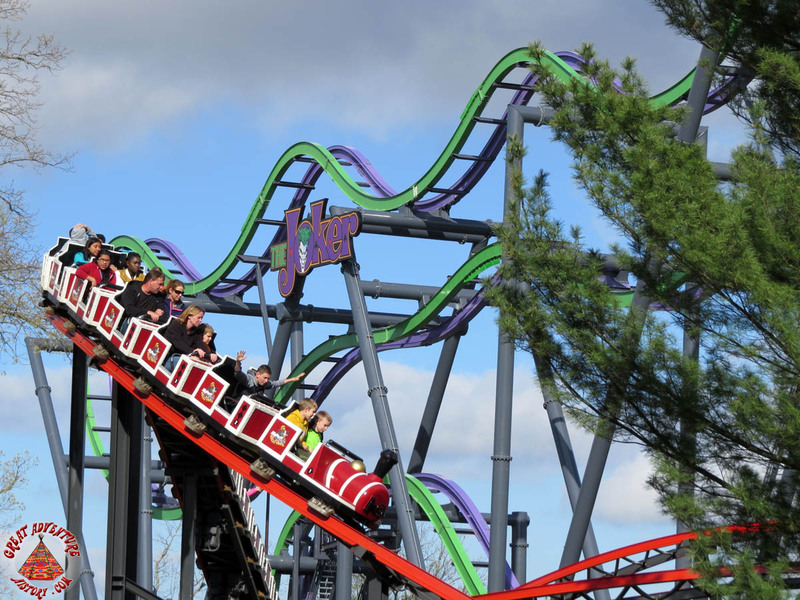 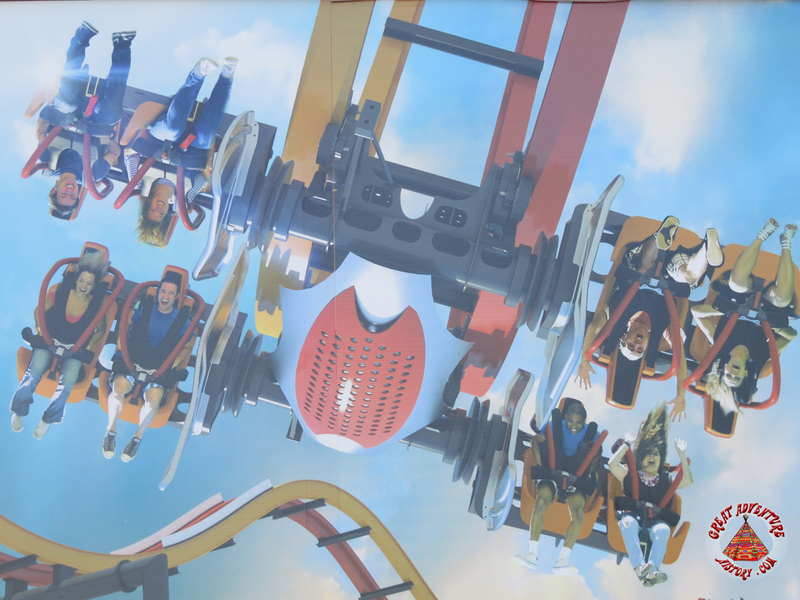 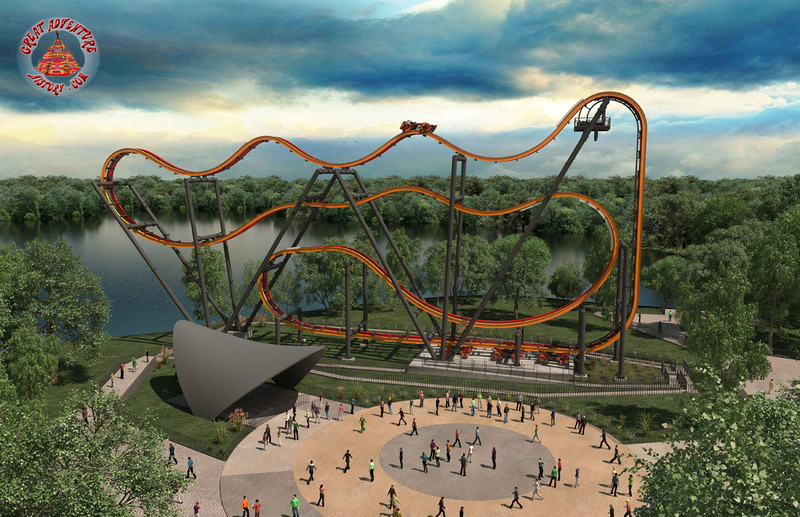 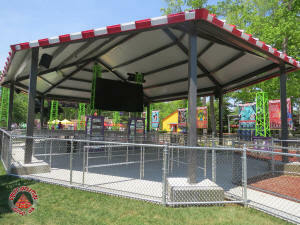 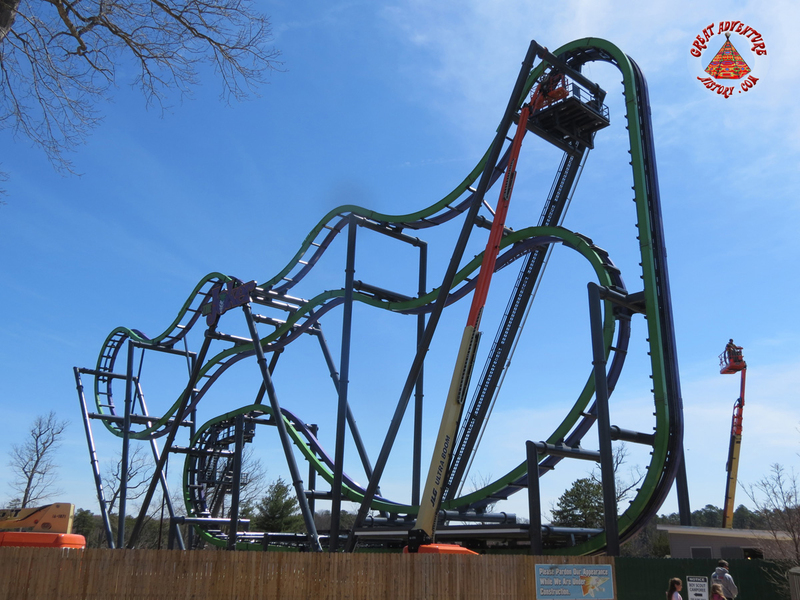 When an exciting new concept can be developed that excites guests, is cost effective, and uses a minimal amount of space, it becomes a trend in the industry, like the Free Fly Coaster built by S&S found at Six Flags parks nationwide. 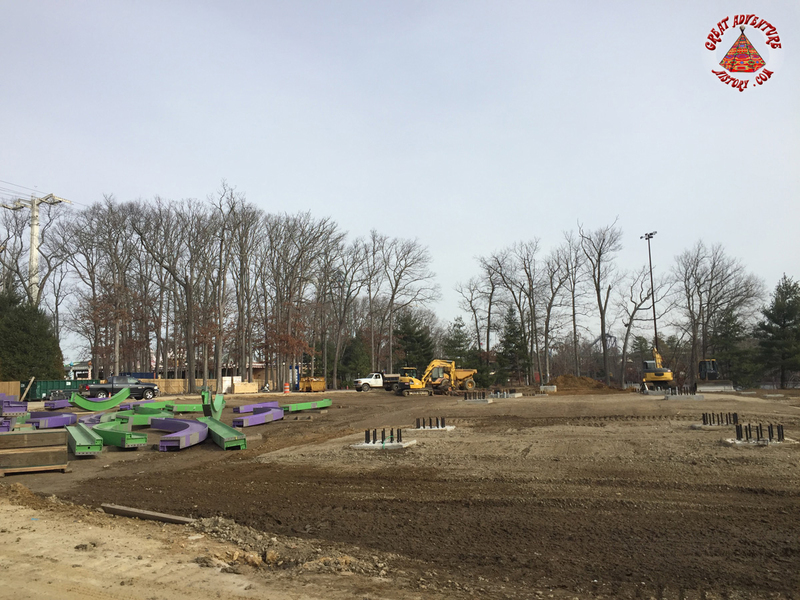 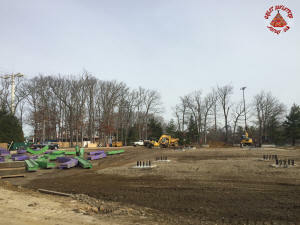 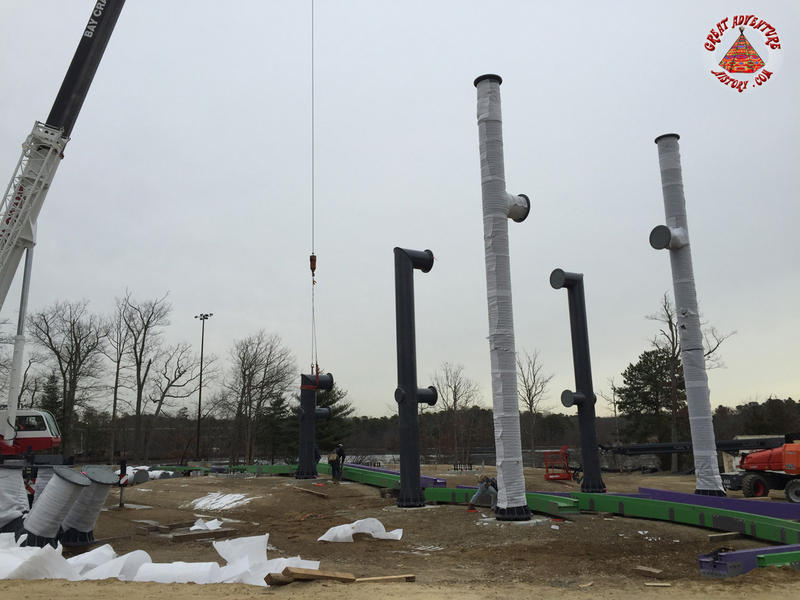 In August 2015, demolition of Great Adventure's long-standing Aqua Stadium commenced and it soon became apparent that whatever was being added for 2016 would take up residence alongside the park's Great Lake. 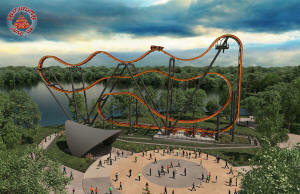 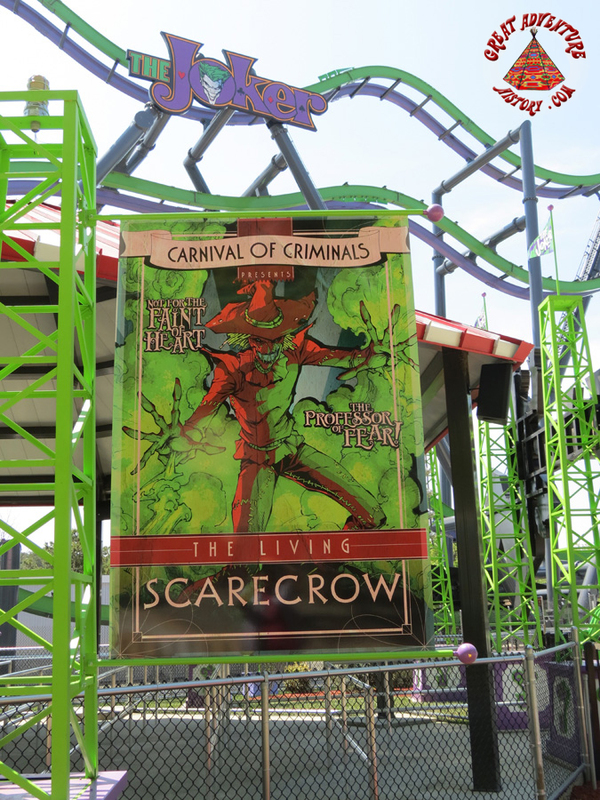 Just before Labor Day 2015, Six Flags made its annual announcement of all the new attractions coming to the chain's parks. 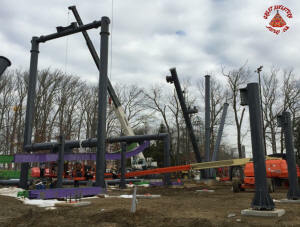 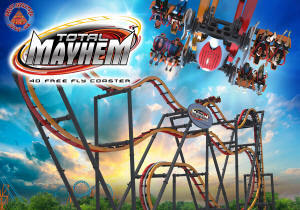 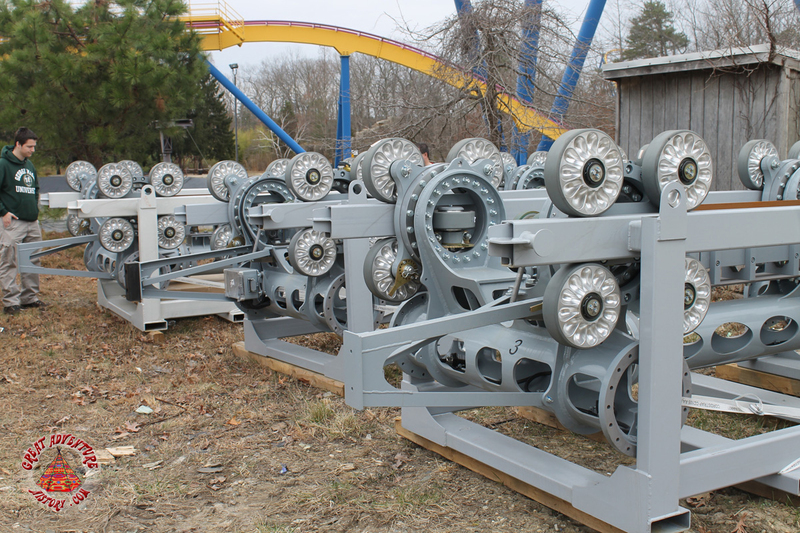 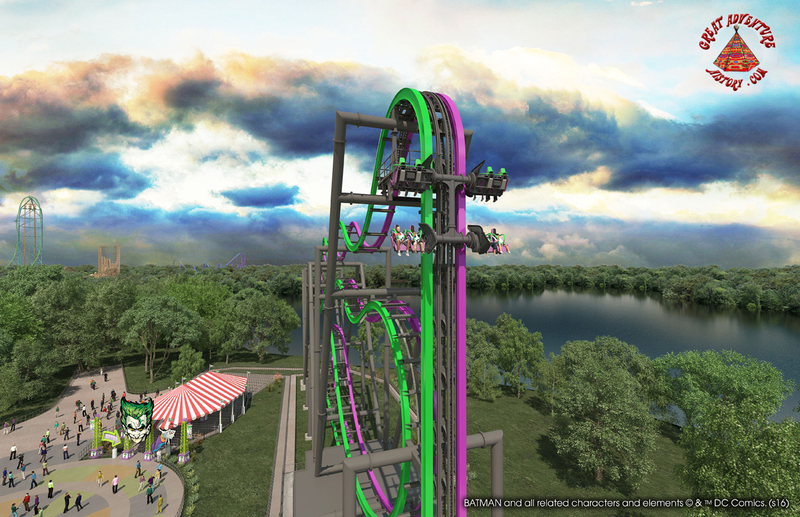 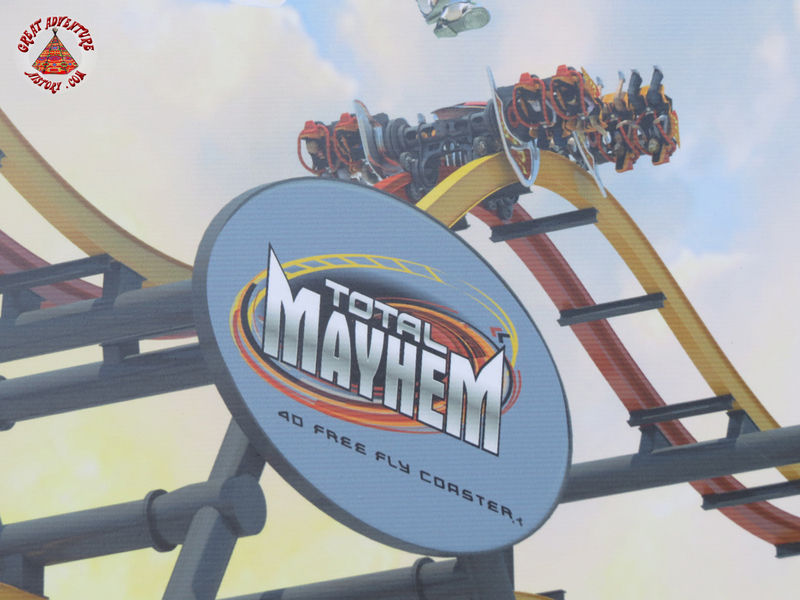 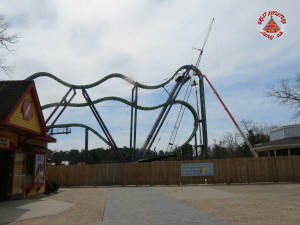 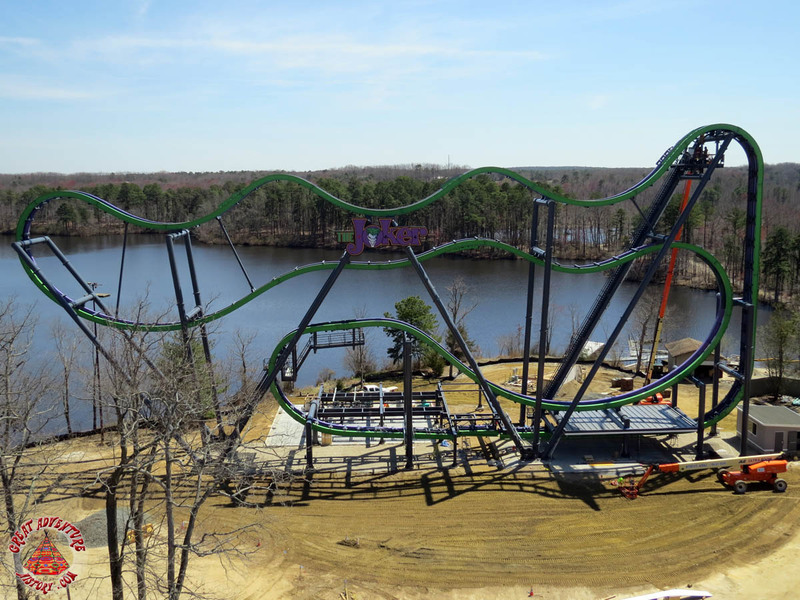 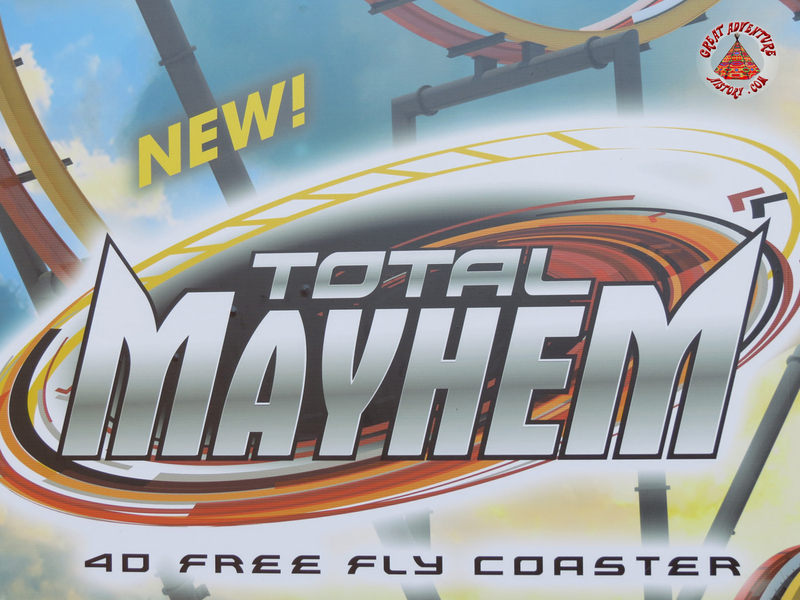 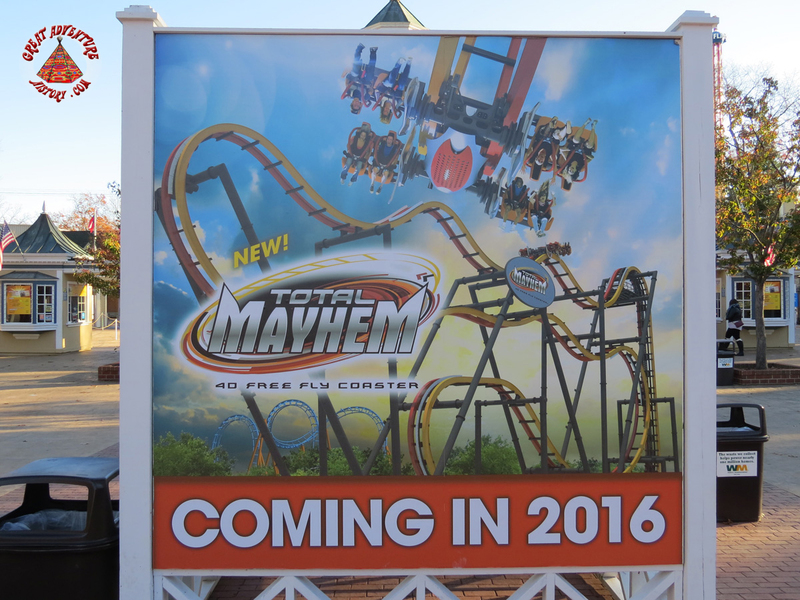 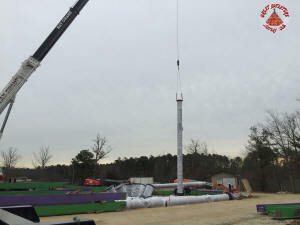 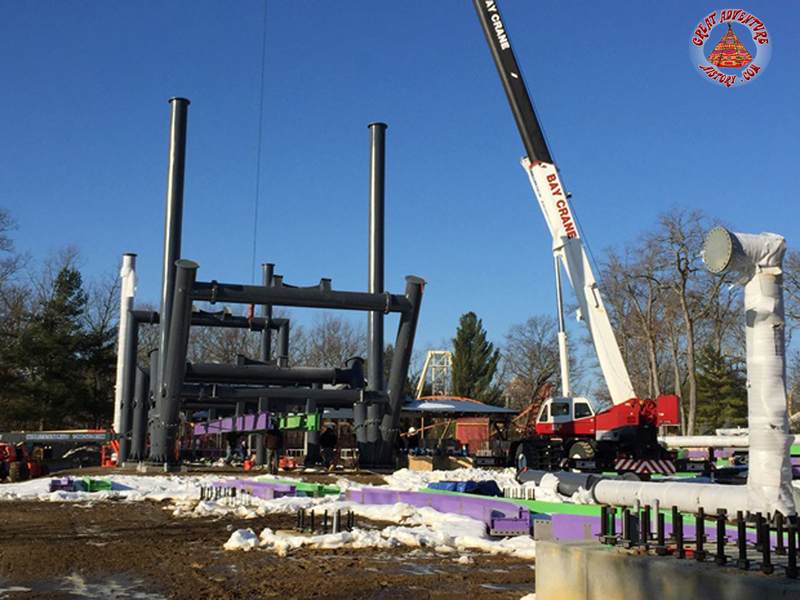 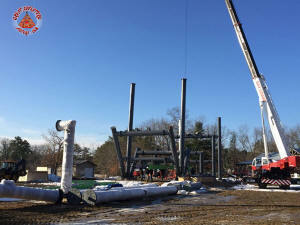 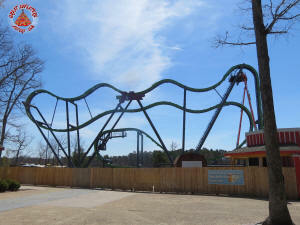 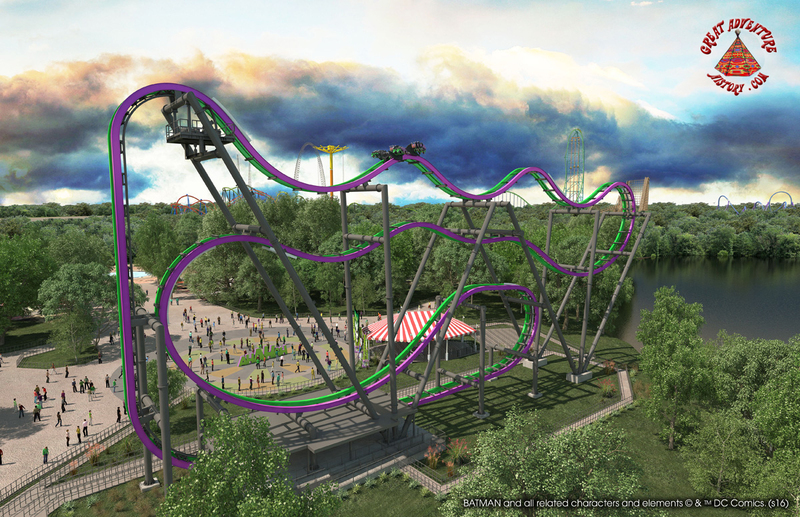 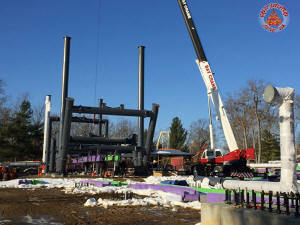 After much anticipation, it was soon known that Six Flags Great Adventure would be receiving a new S&S 4-D Free Fly Coaster called "Total Mayhem". 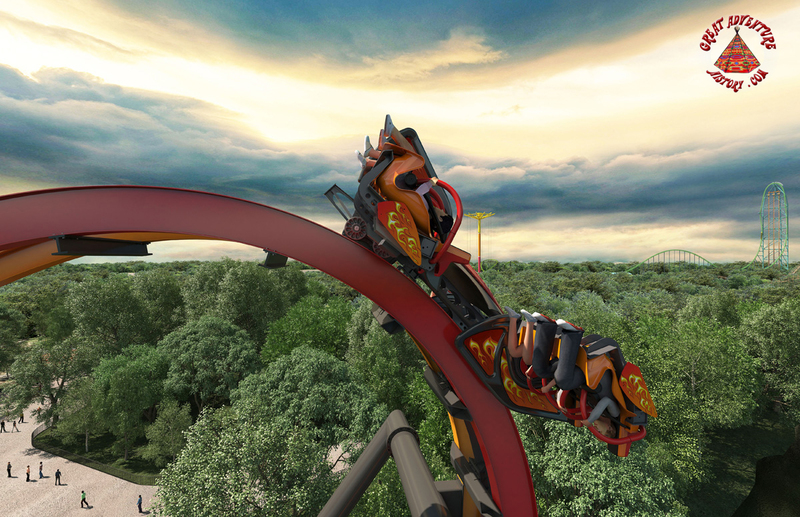 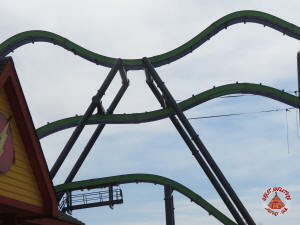 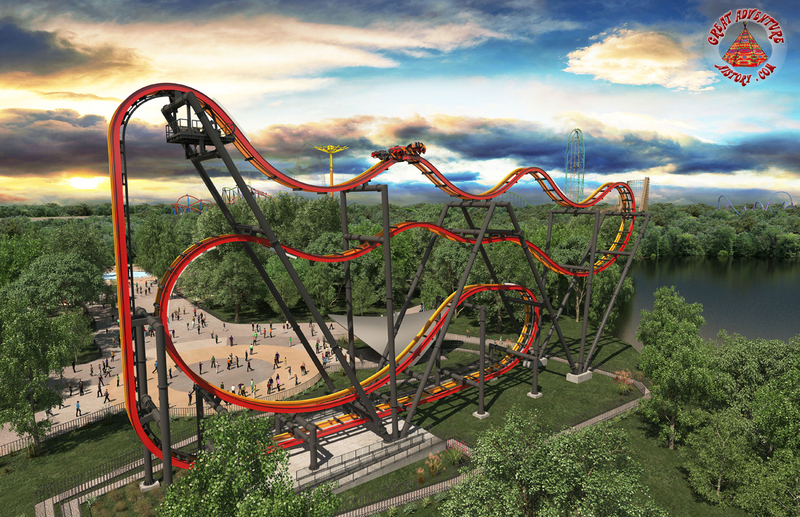 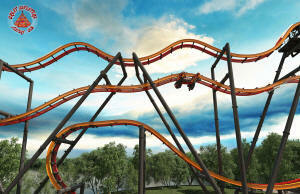 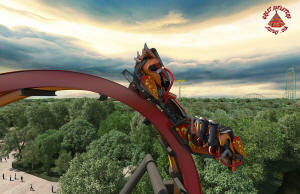 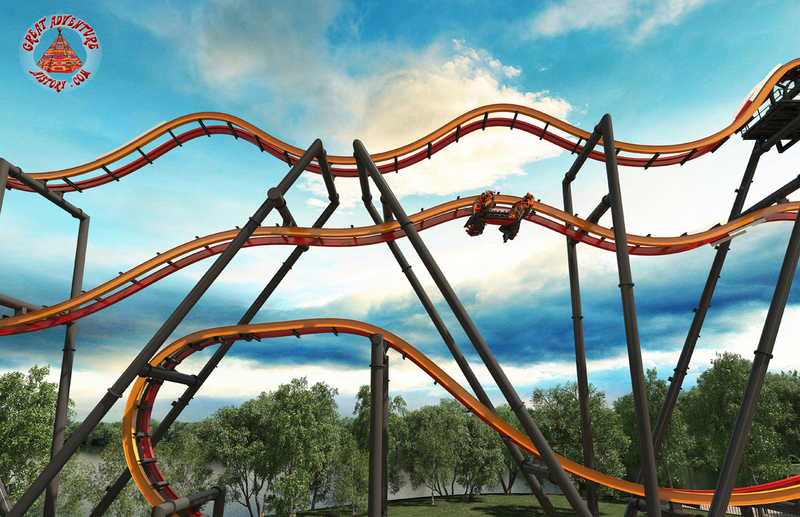 The coaster, which was identical to Batman The Ride added to Six Flags Fiesta Texas in 2016, was to be painted with a red and orange rail combination with black supports. 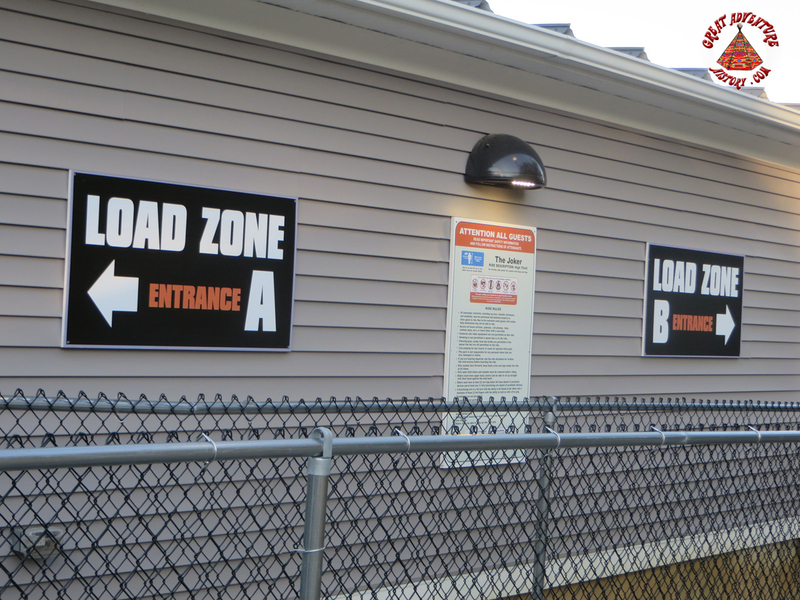 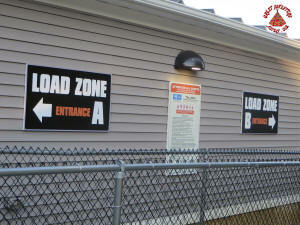 With a rather generic look for the ride vehicles and a plain black canvas covering the queue, the real excitement promised to be in the ride experience itself. By late January 2016, another announcement was made that Total Mayhem would instead be called The Joker. 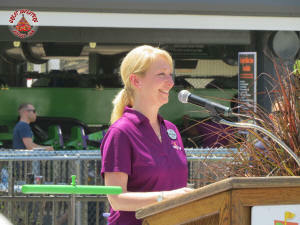 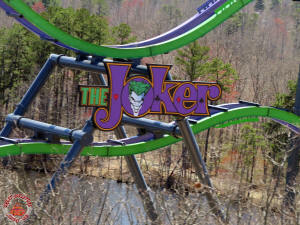 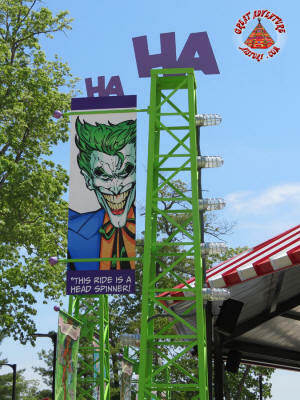 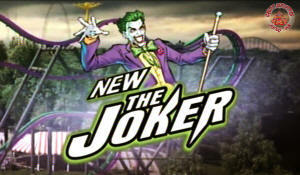 The news release proclaimed that the Joker was plotting to take over the ride and "wreak total mayhem" on the new coaster. 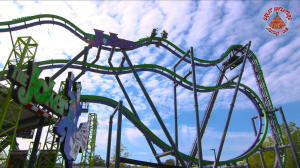 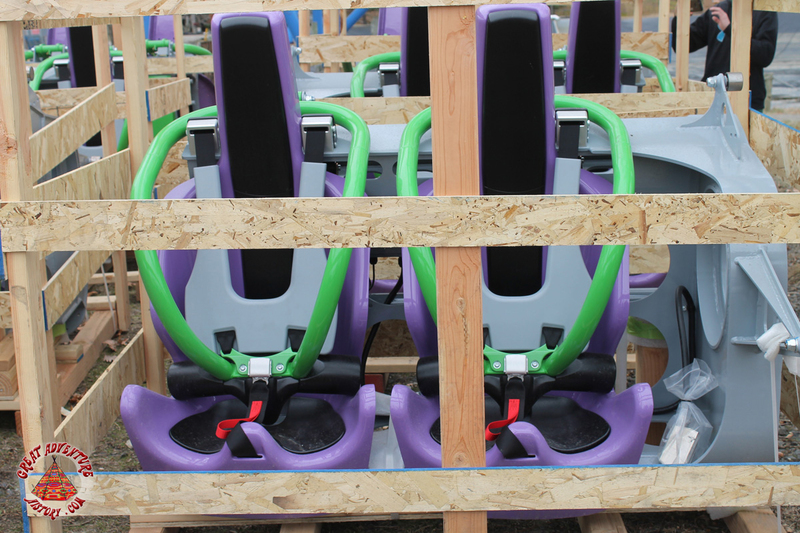 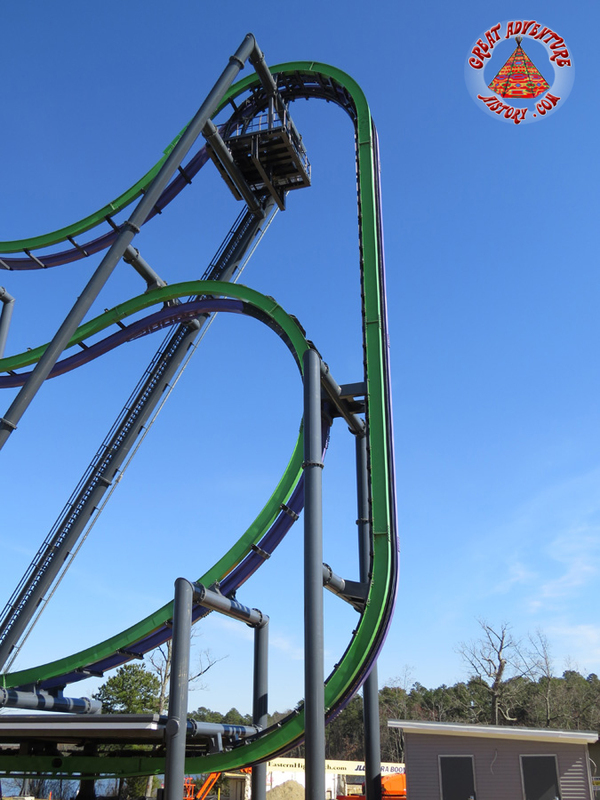 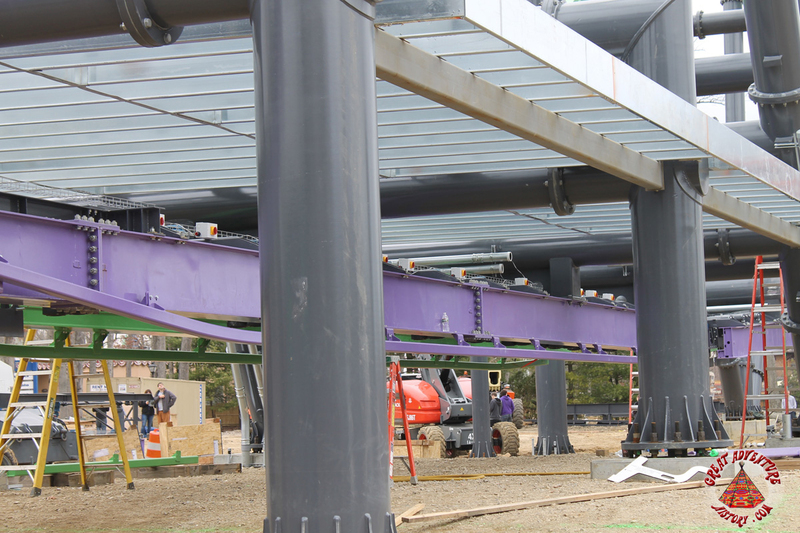 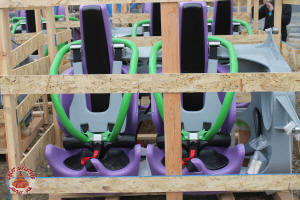 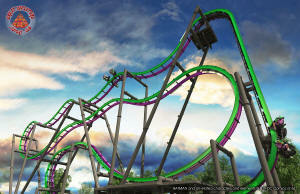 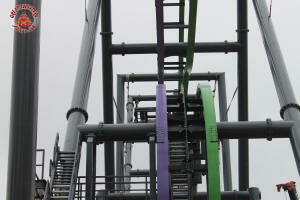 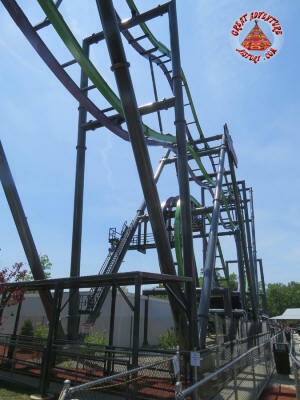 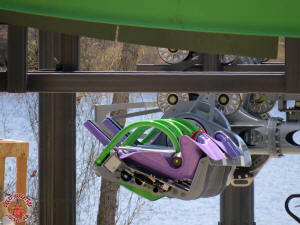 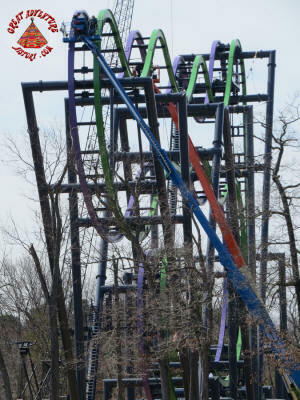 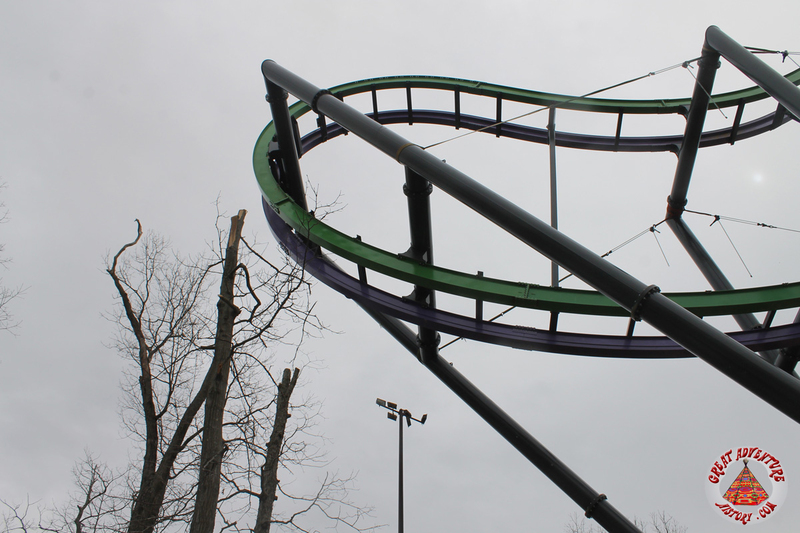 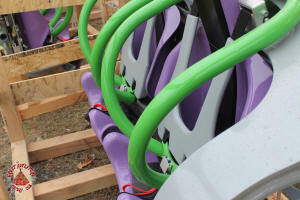 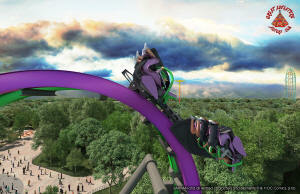 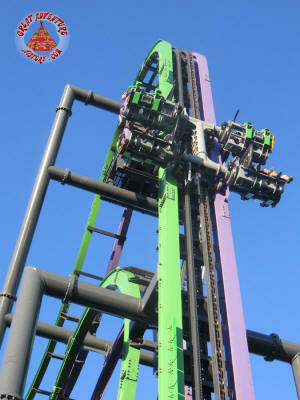 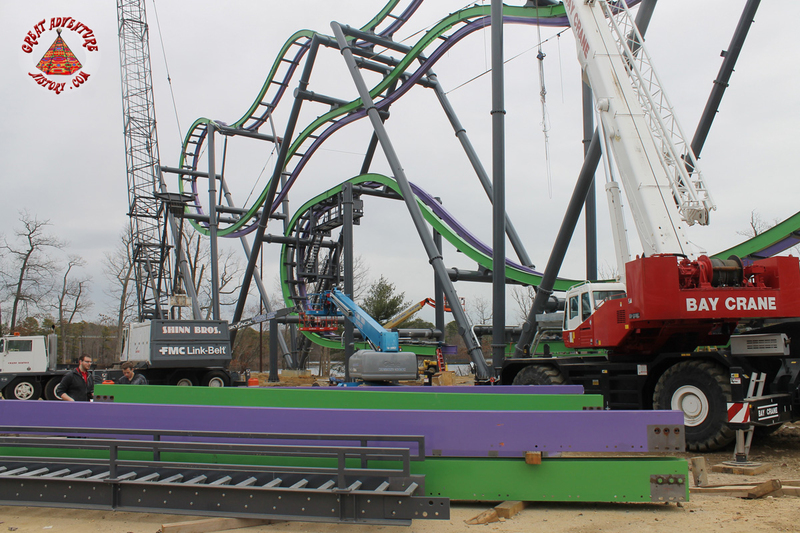 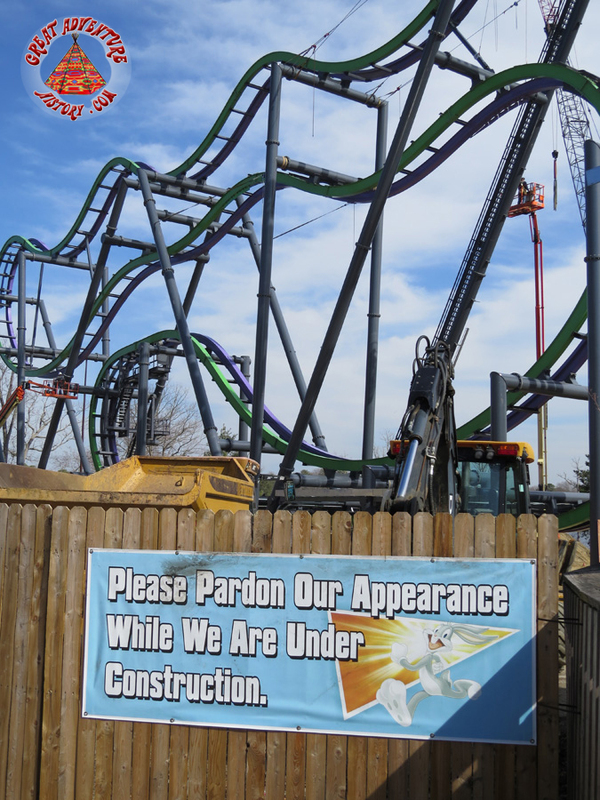 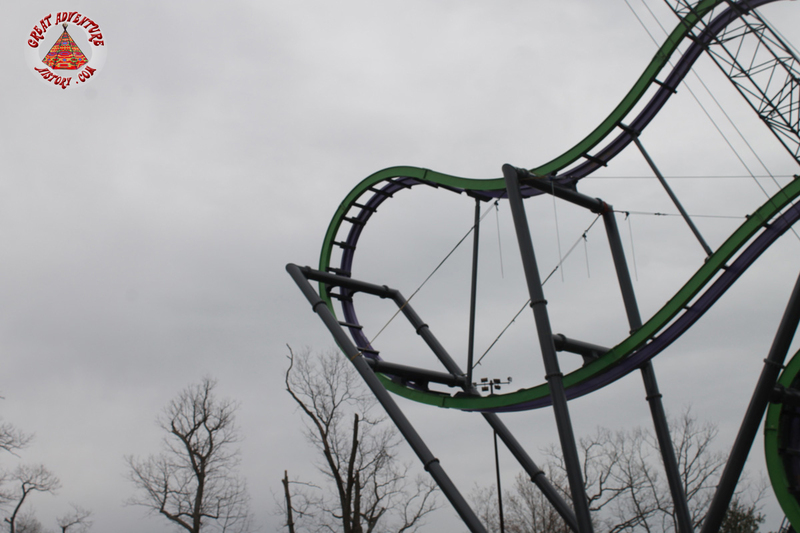 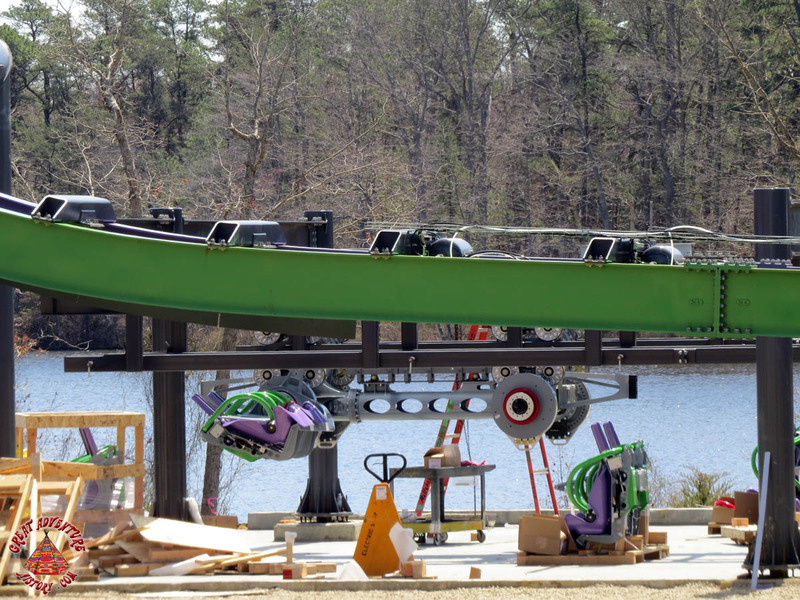 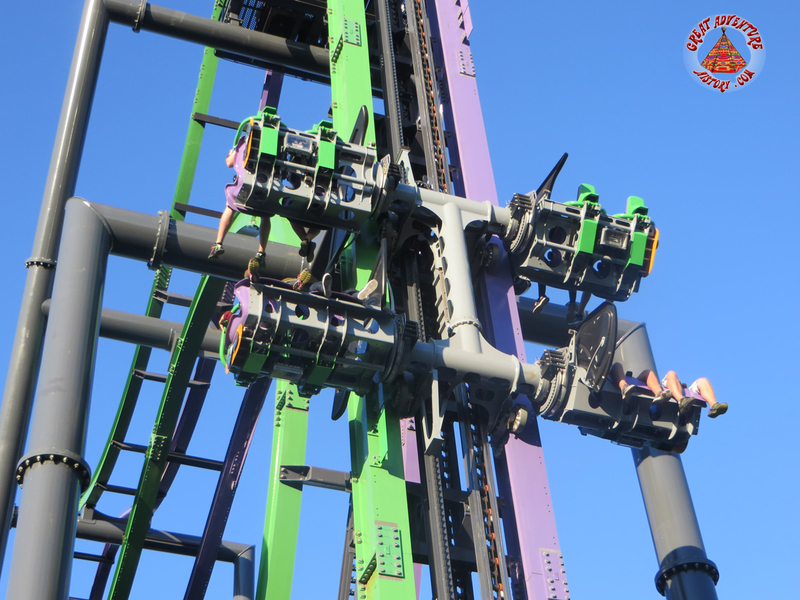 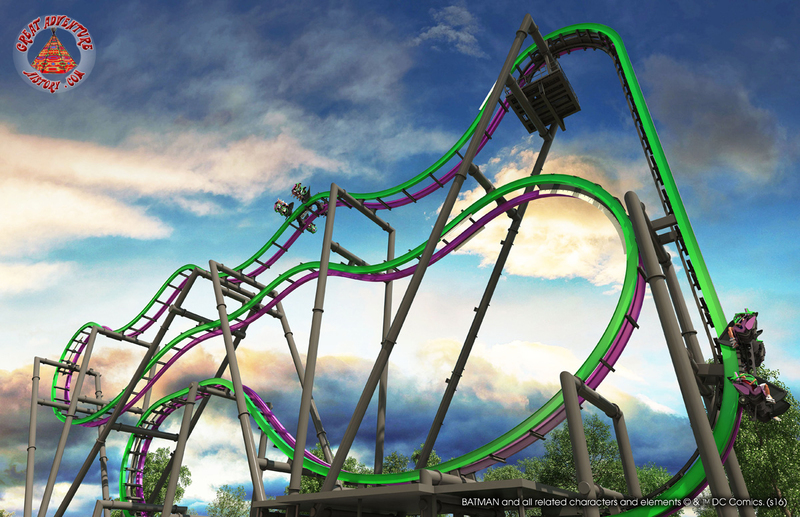 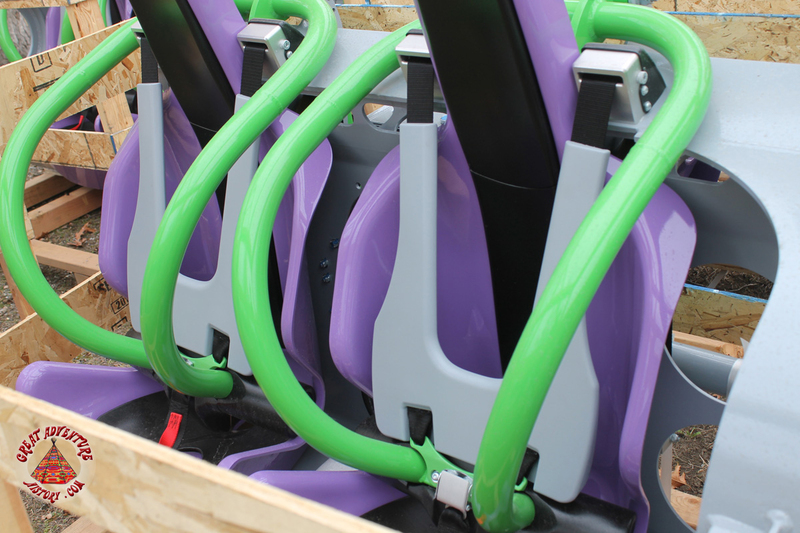 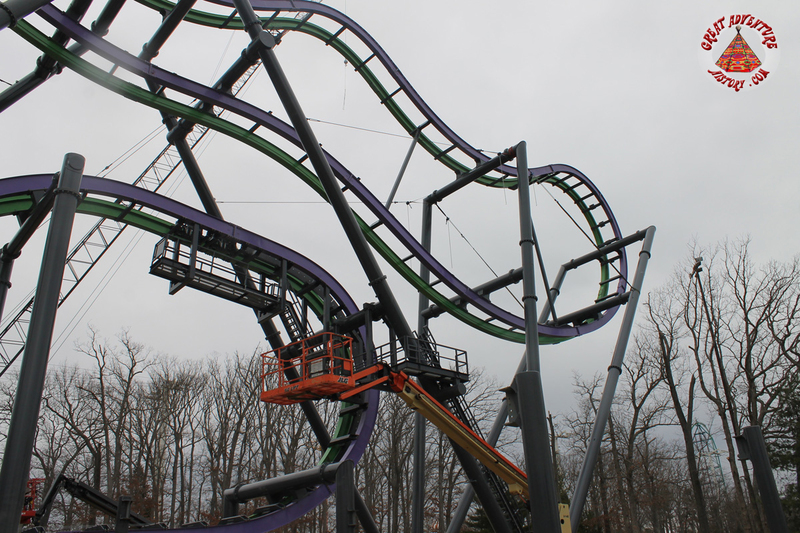 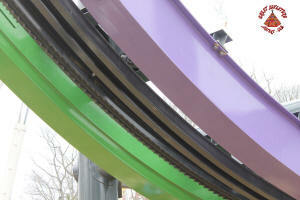 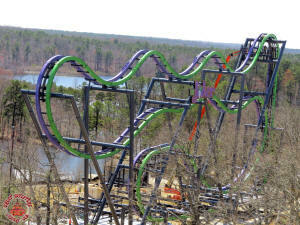 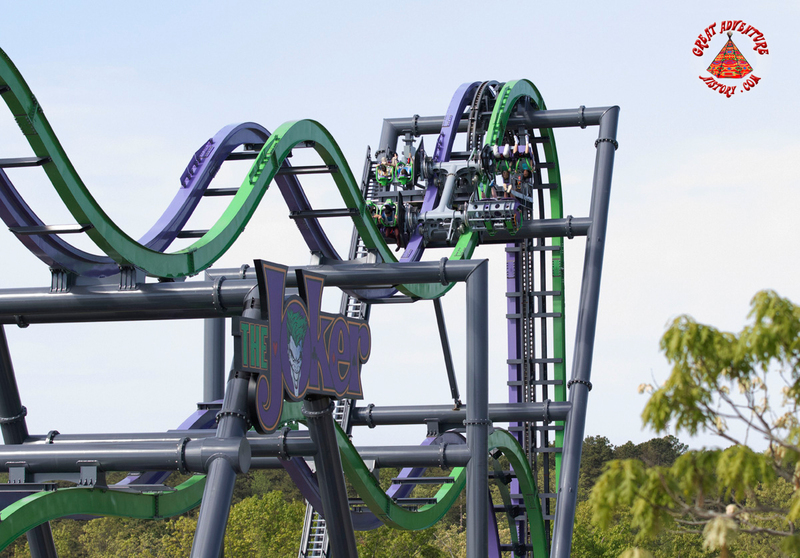 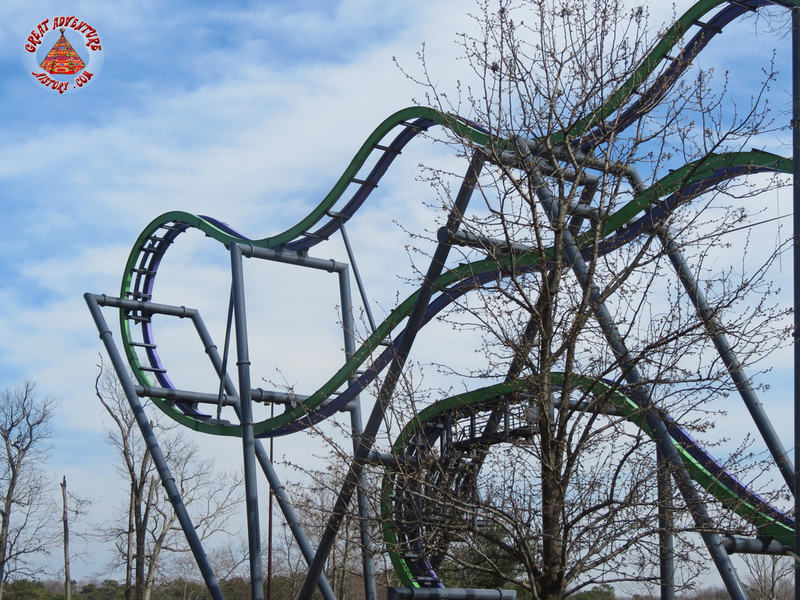 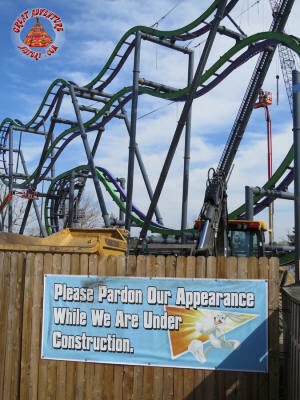 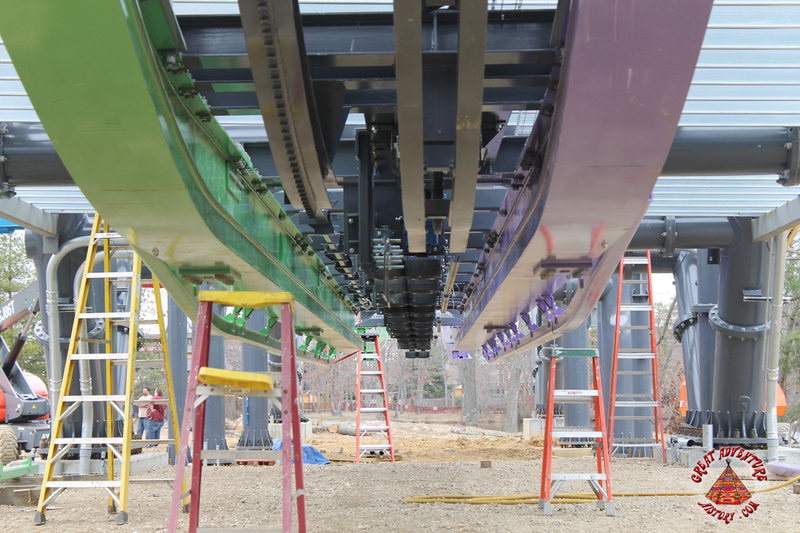 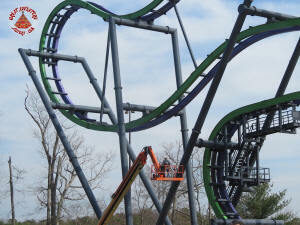 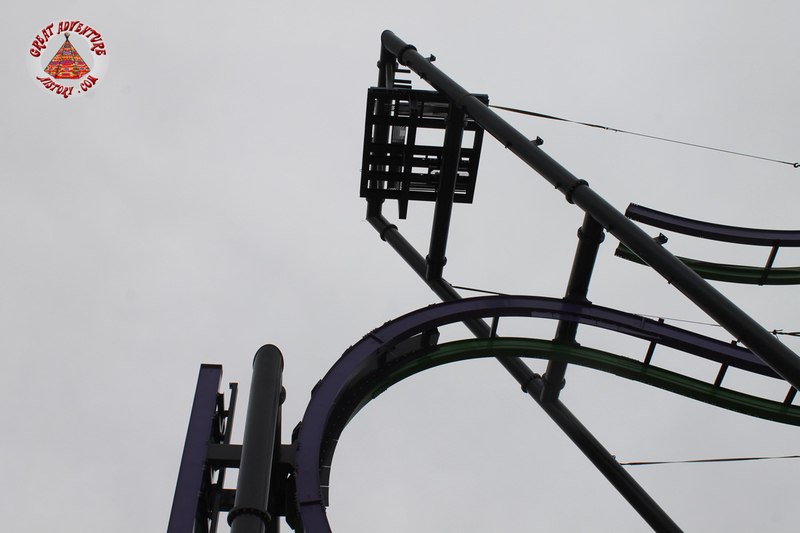 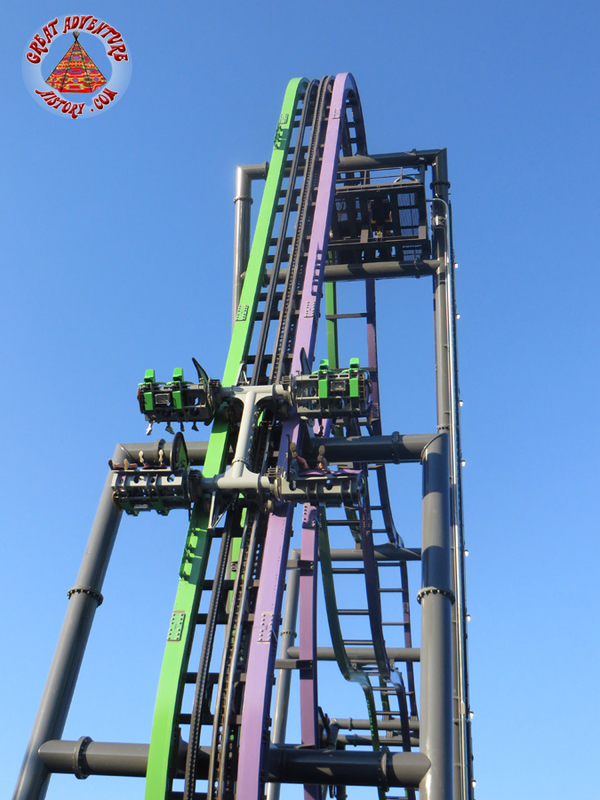 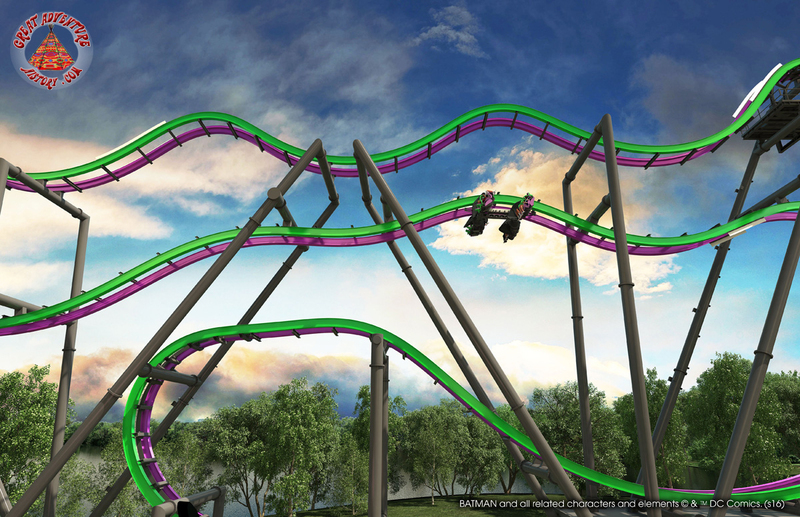 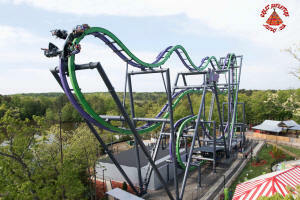 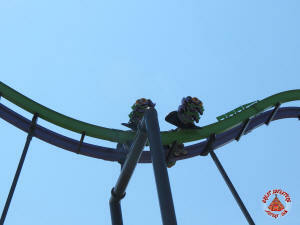 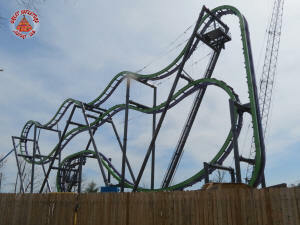 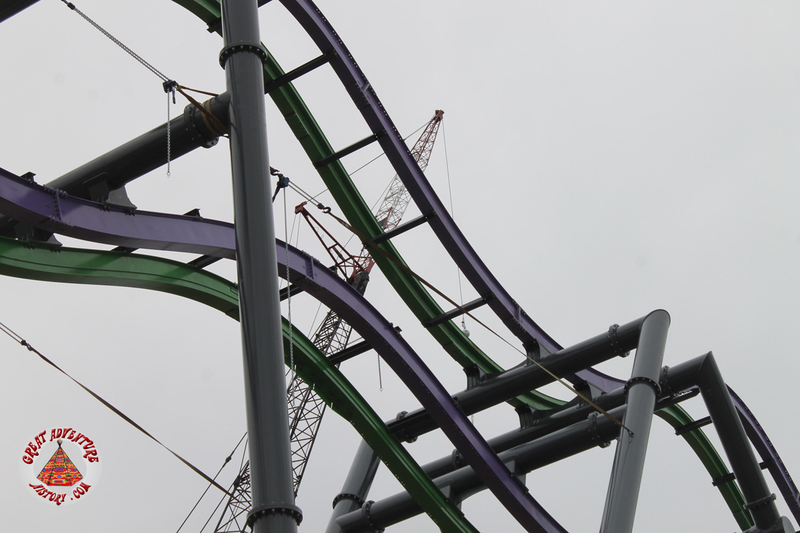 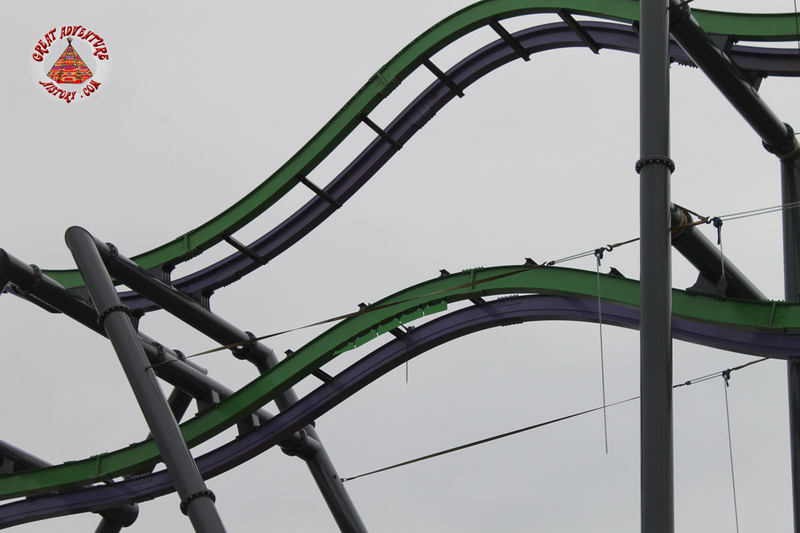 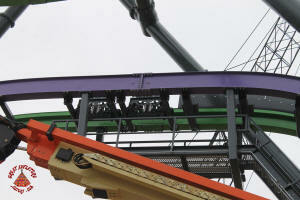 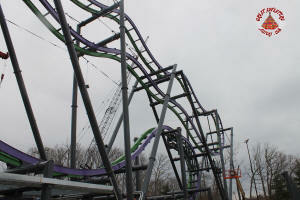 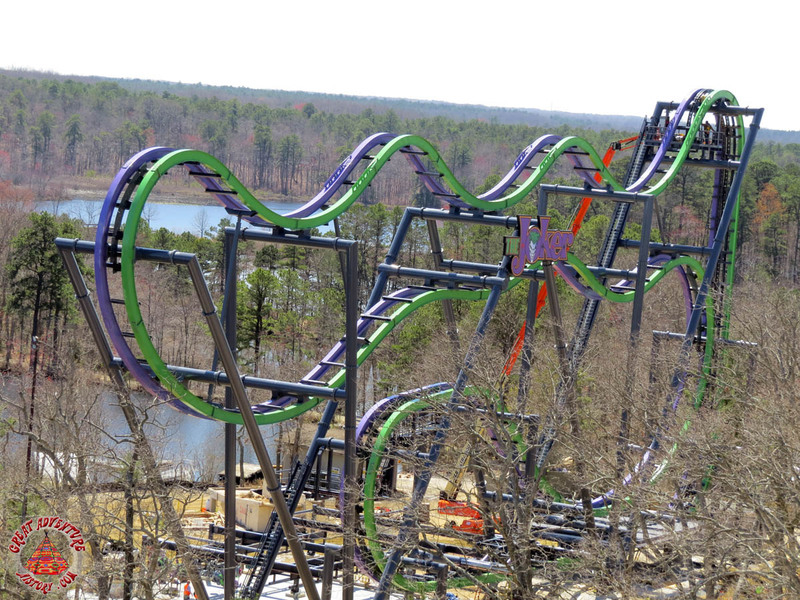 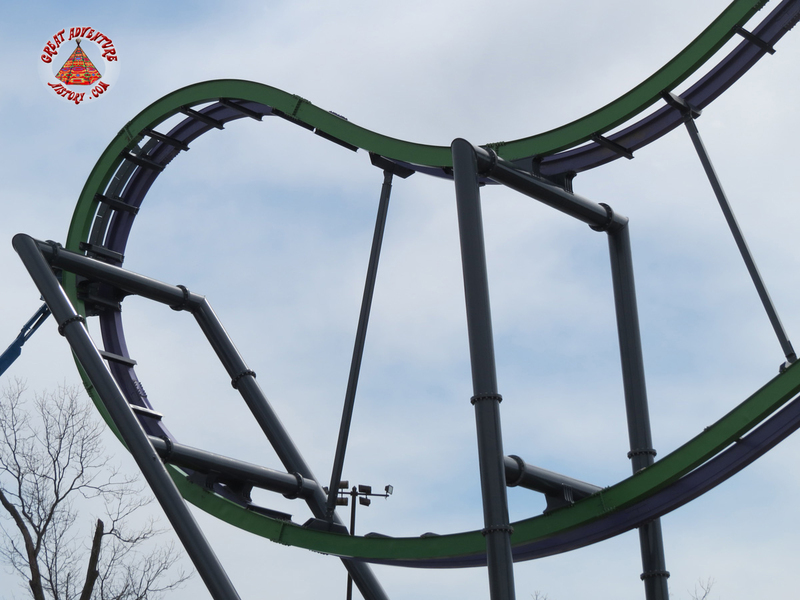 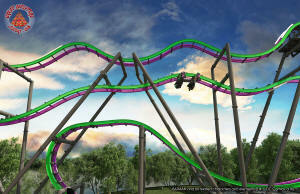 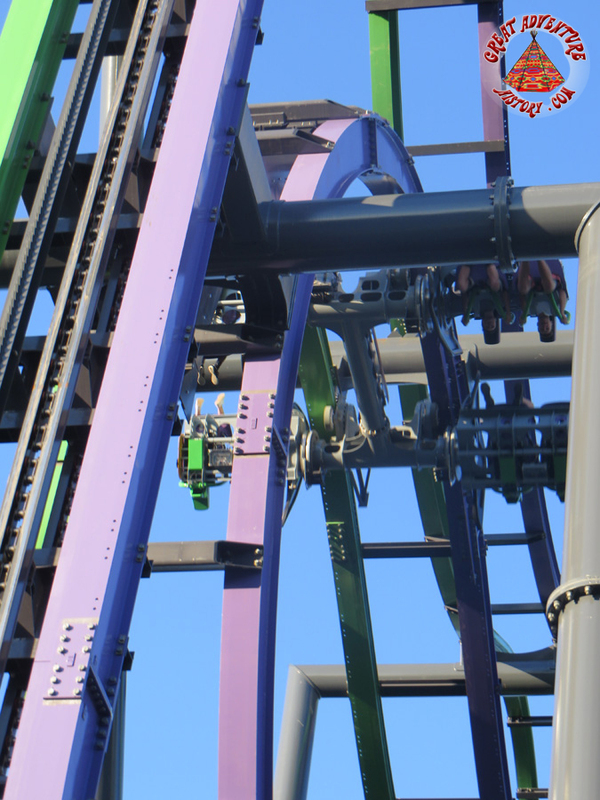 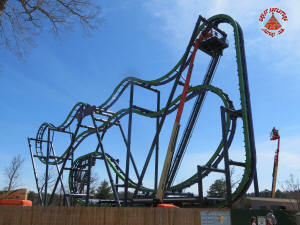 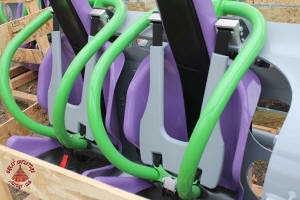 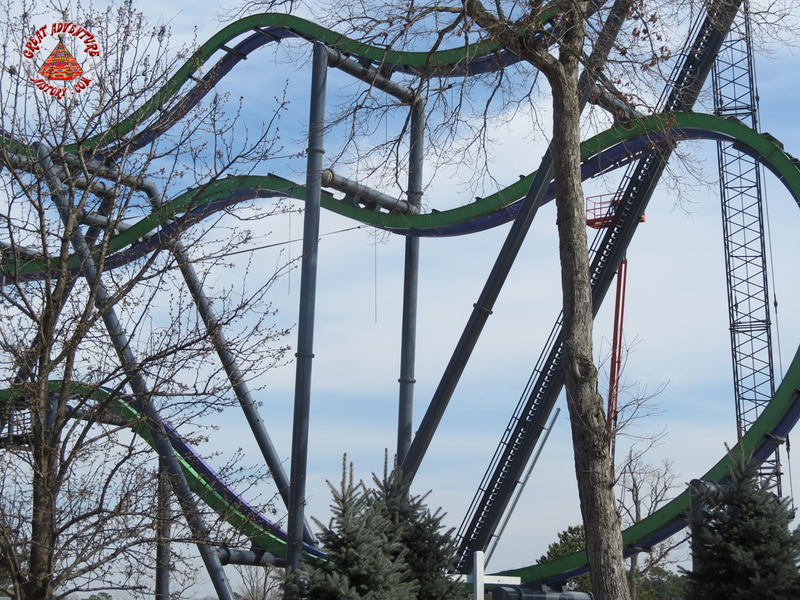 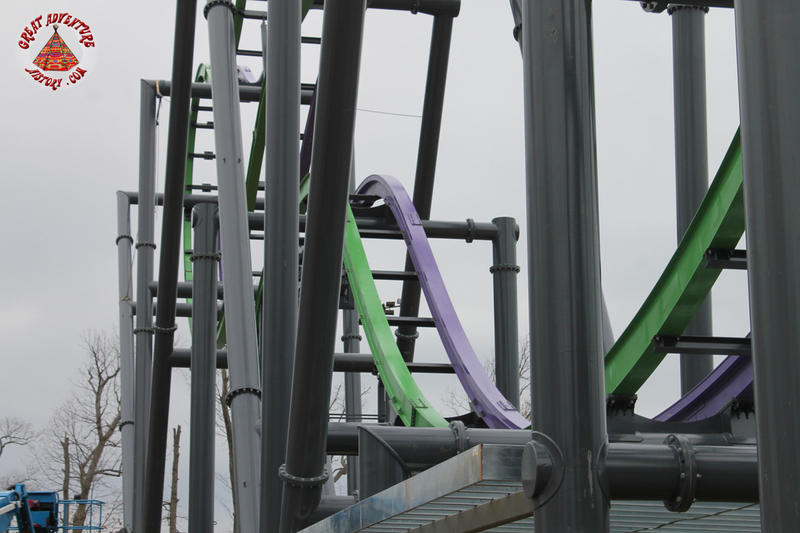 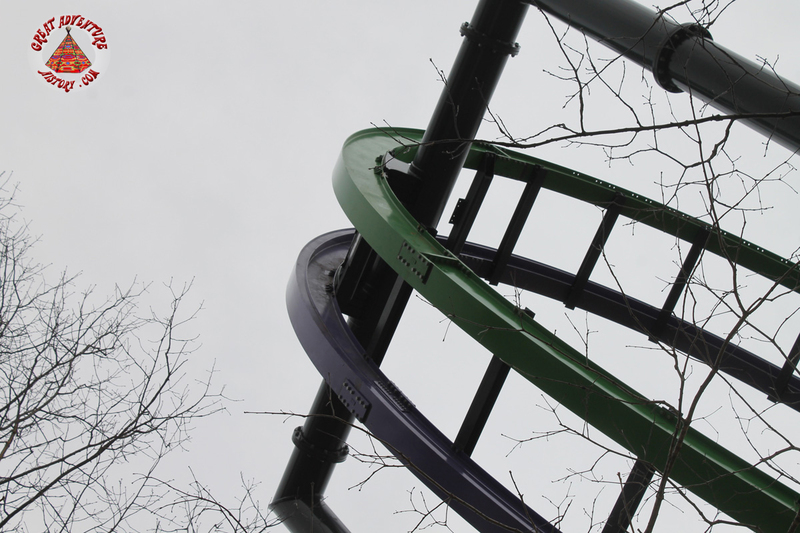 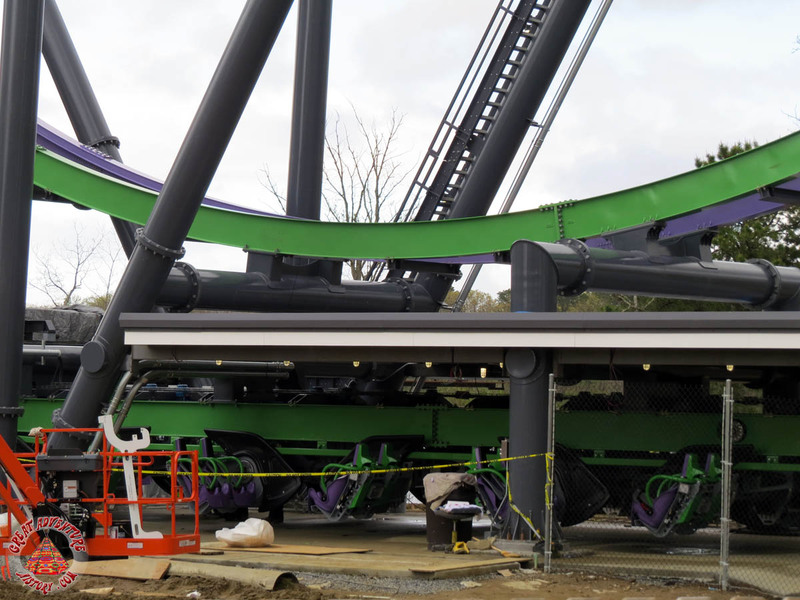 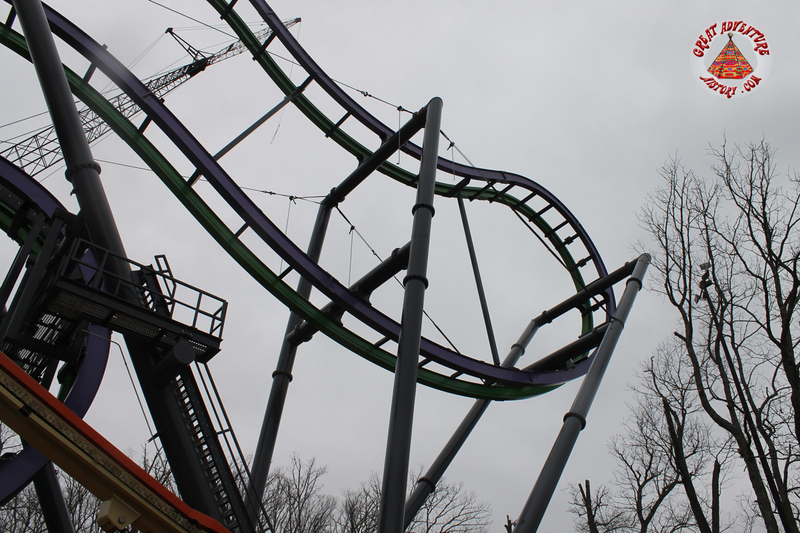 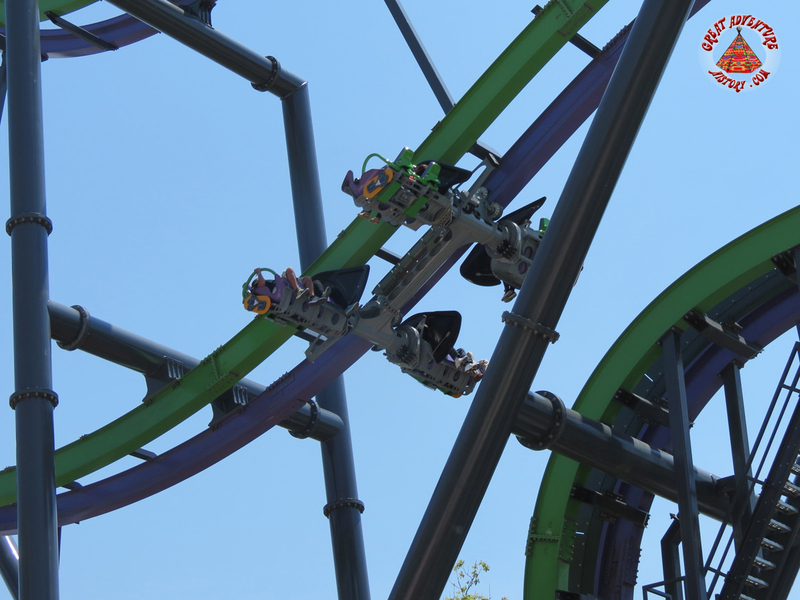 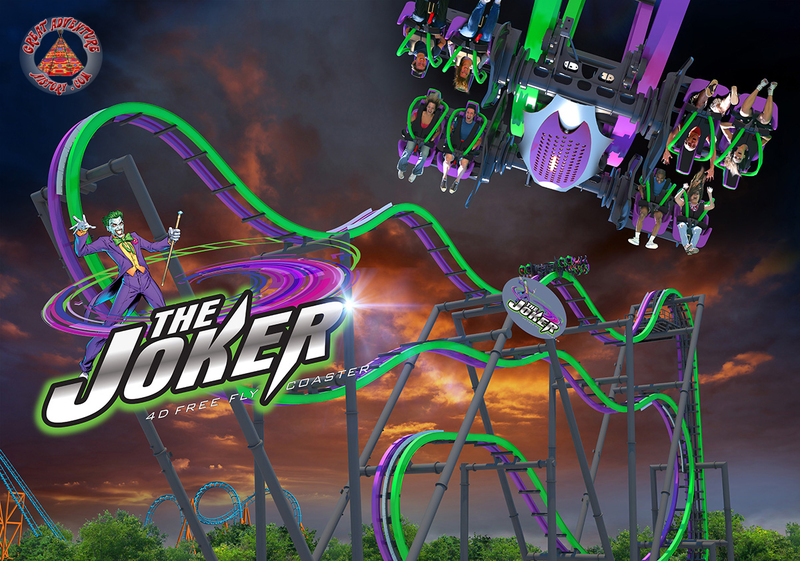 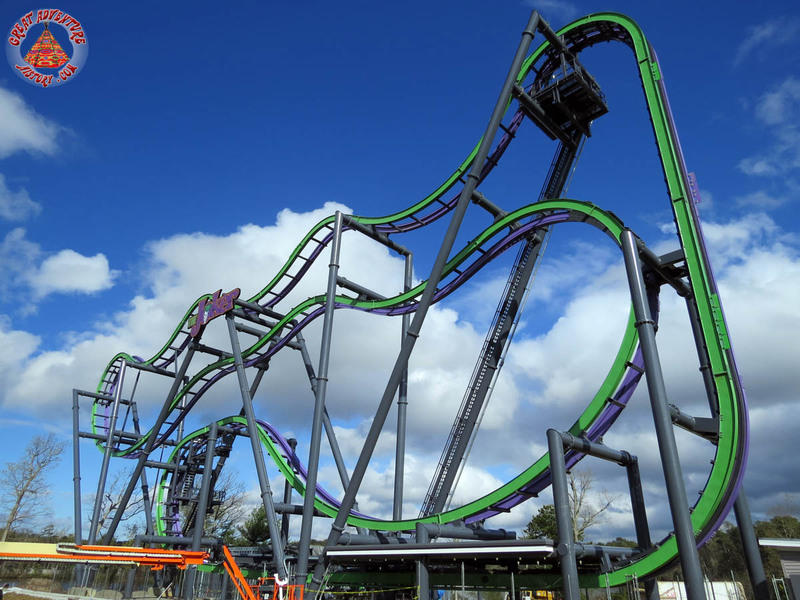 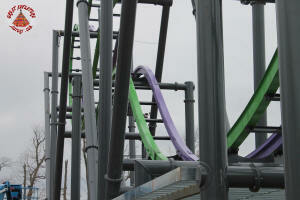 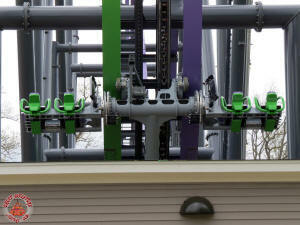 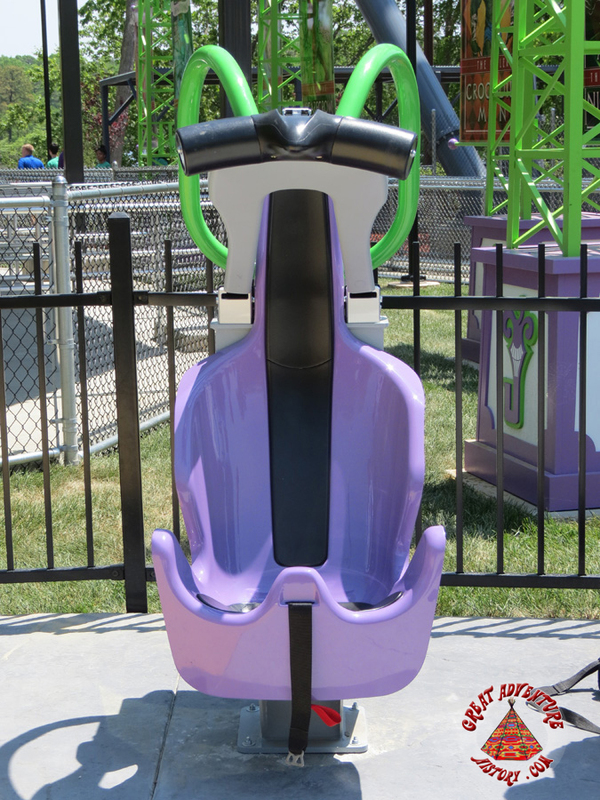 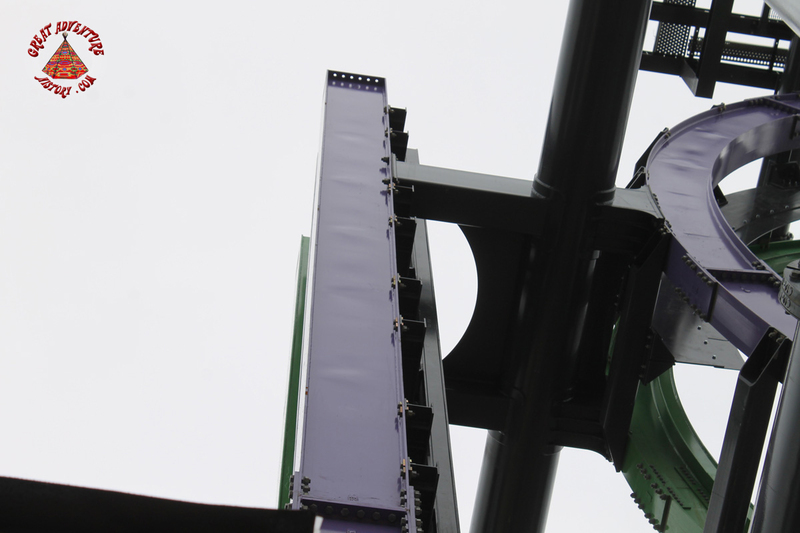 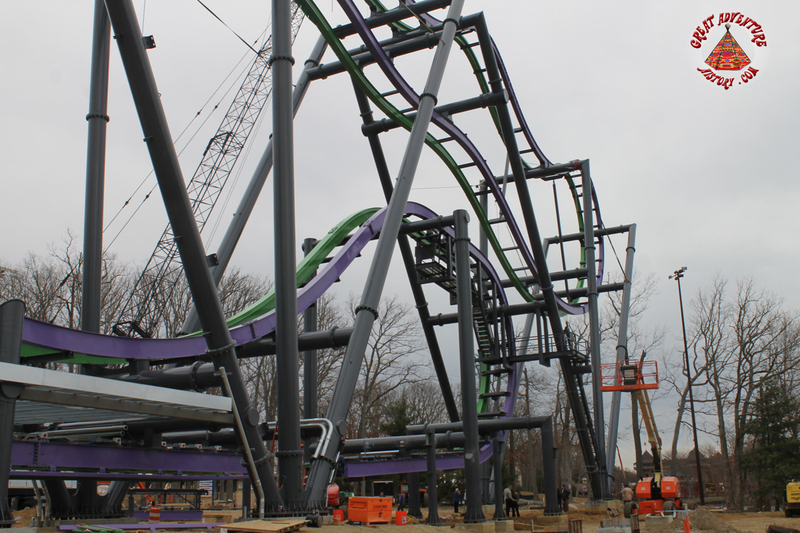 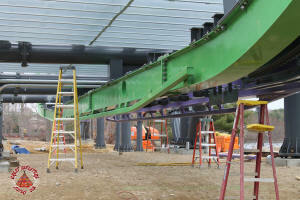 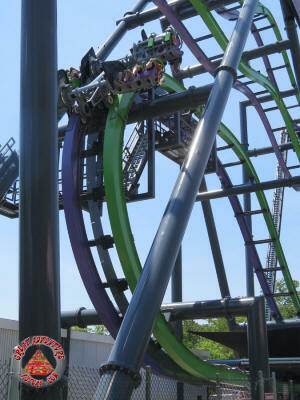 The Joker was re-imagined with a green and purple color scheme (the Joker's signature colors) for the rails along with blackish supports. 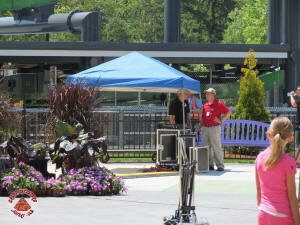 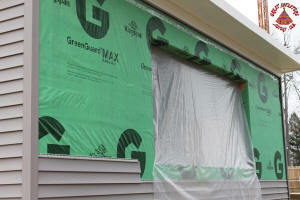 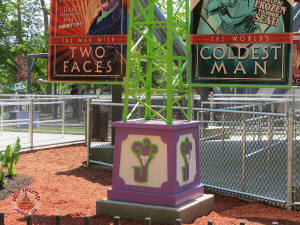 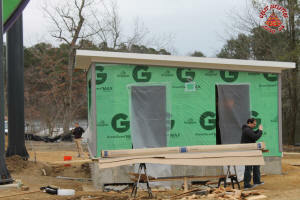 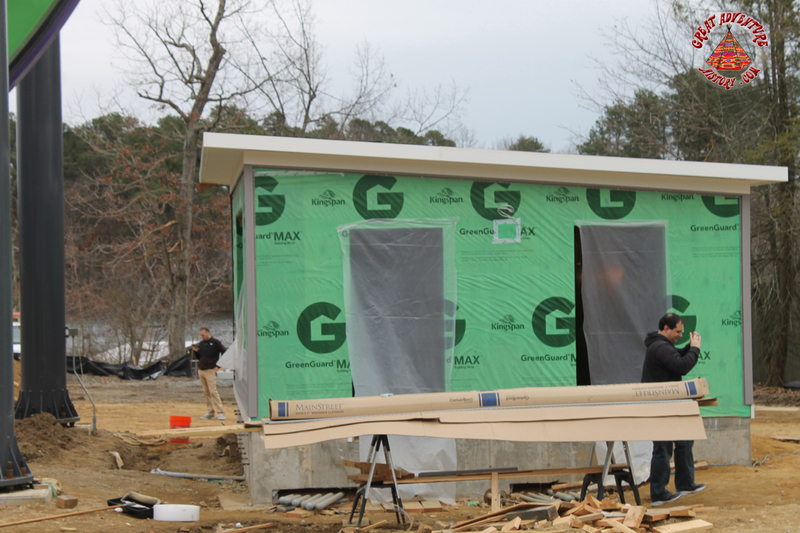 Along with the new colors came some new theme elements for the queue house and surrounding area. 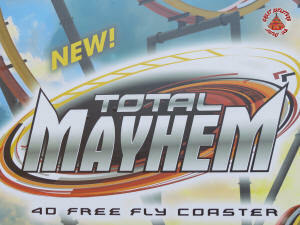 The subtle and not so subtle differences went a long way to elevate the coaster from generic to iconic. 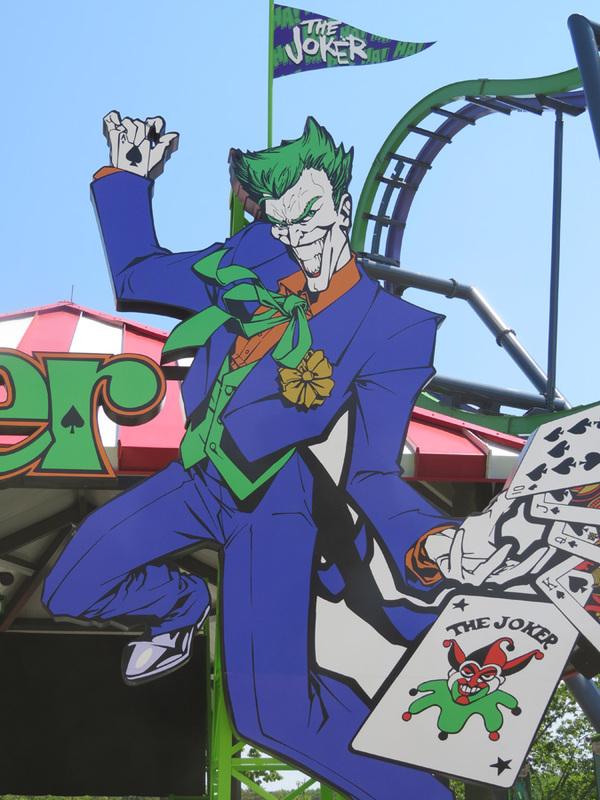 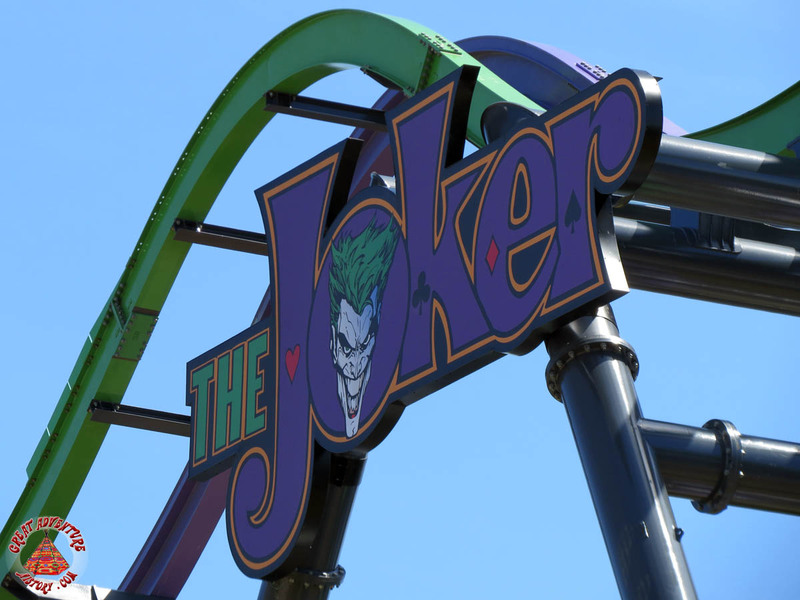 The Joker would join other DC characters that at the time hosted rides around the park including Batman, The Dark Knight, Superman, Green Lantern, and Bizarro. 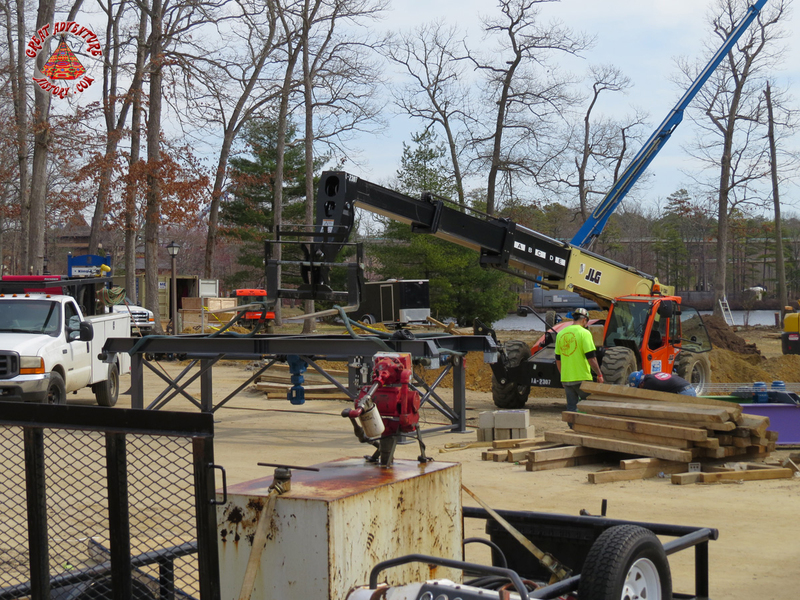 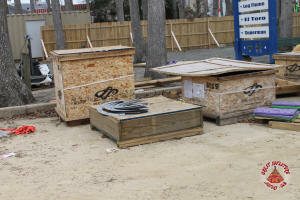 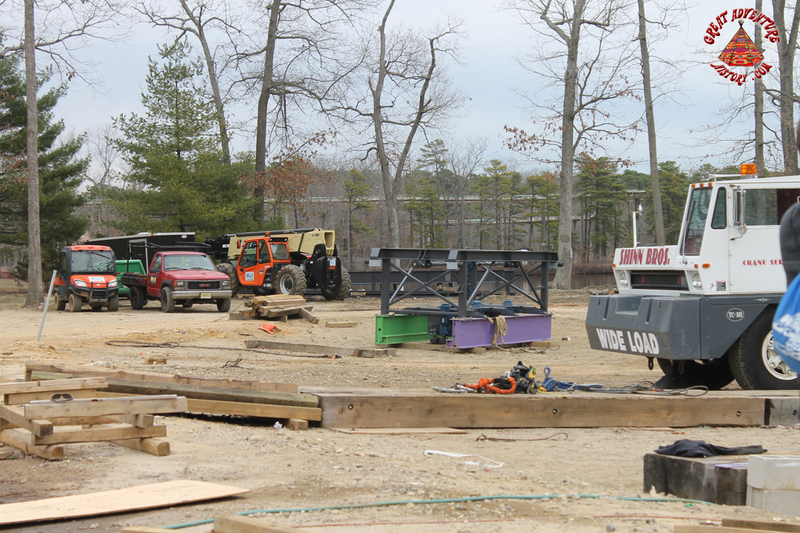 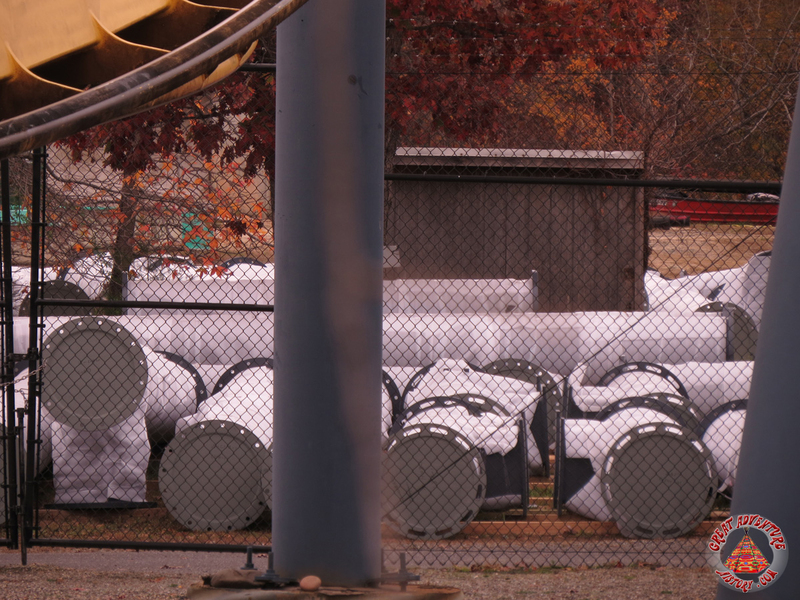 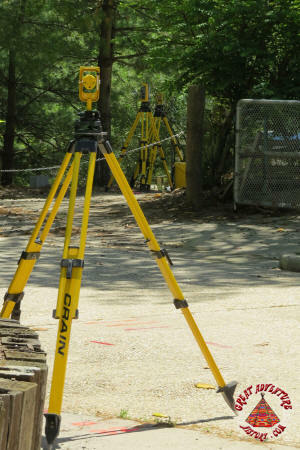 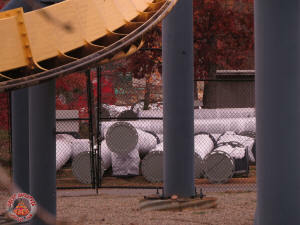 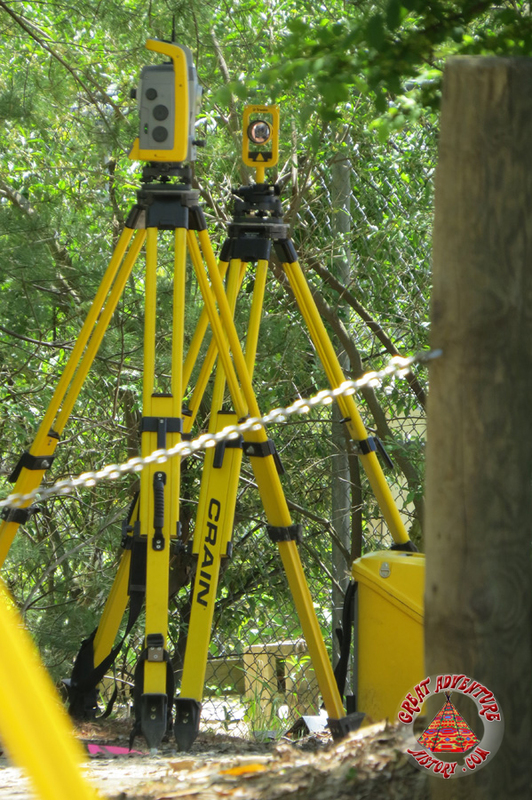 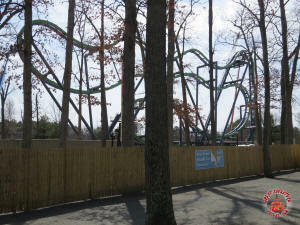 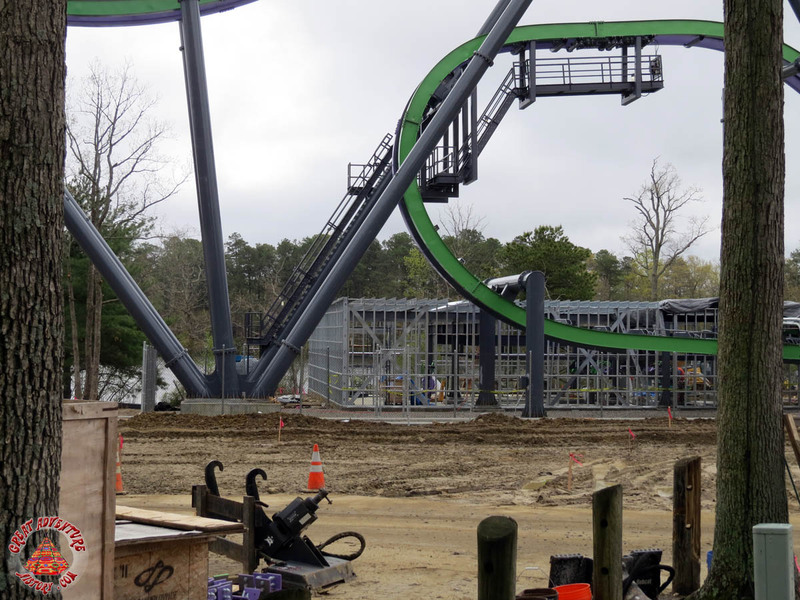 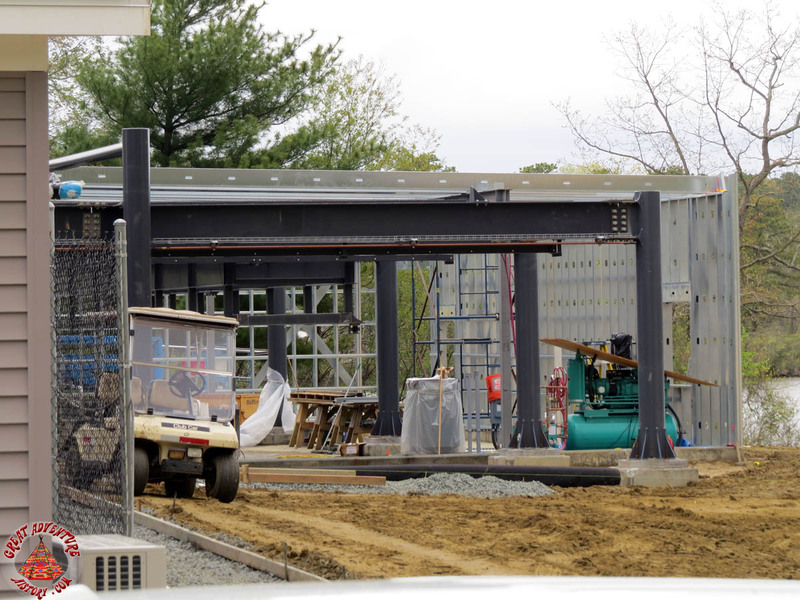 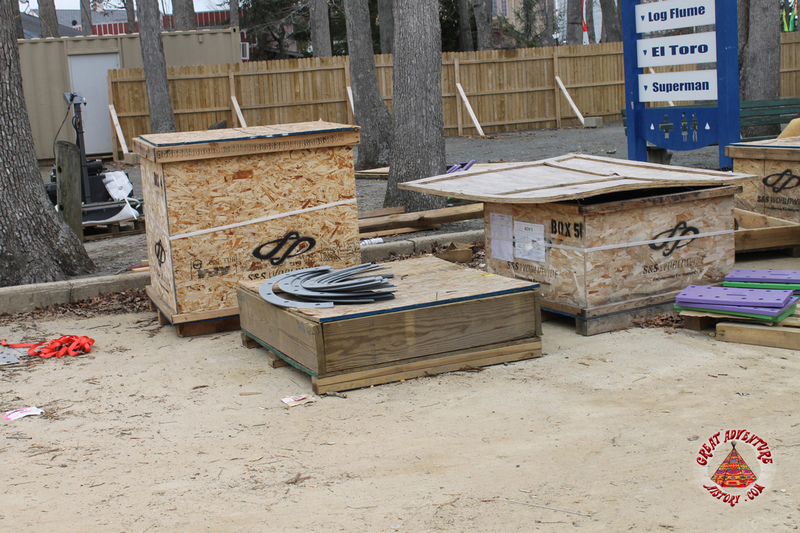 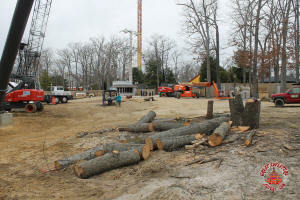 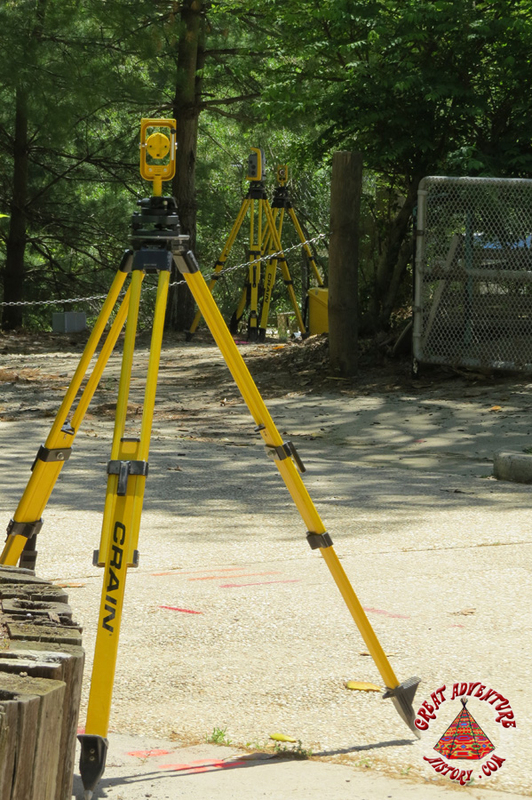 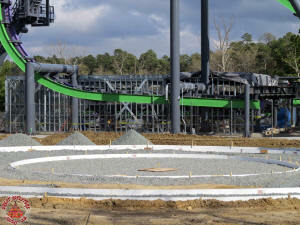 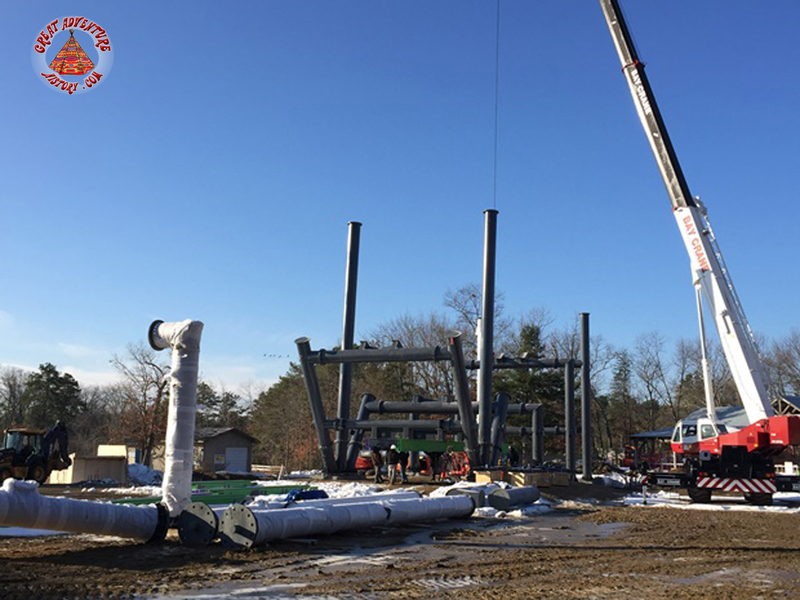 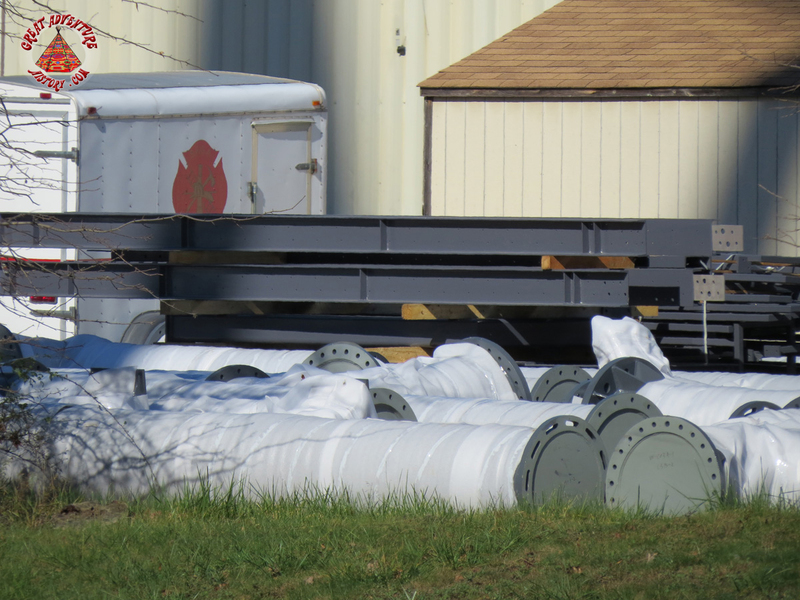 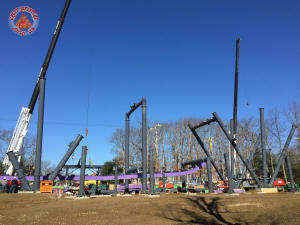 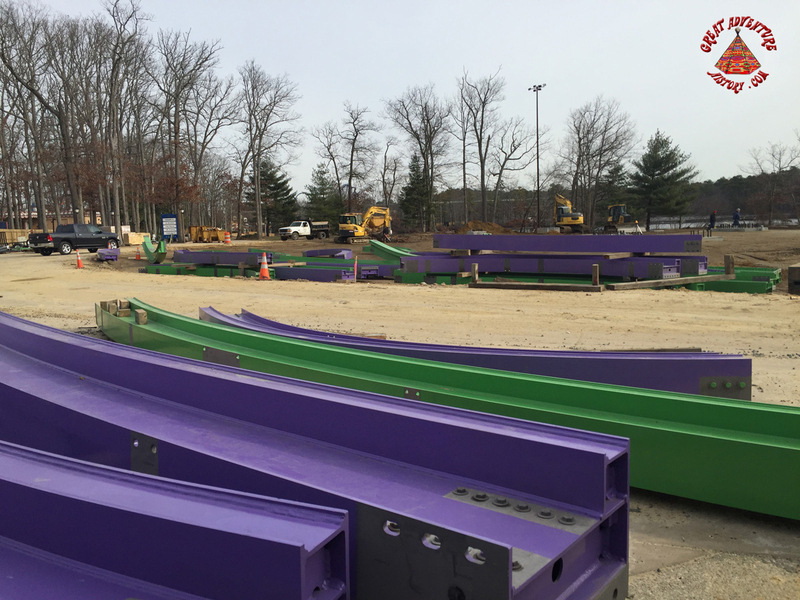 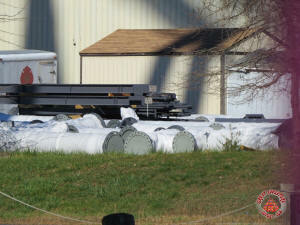 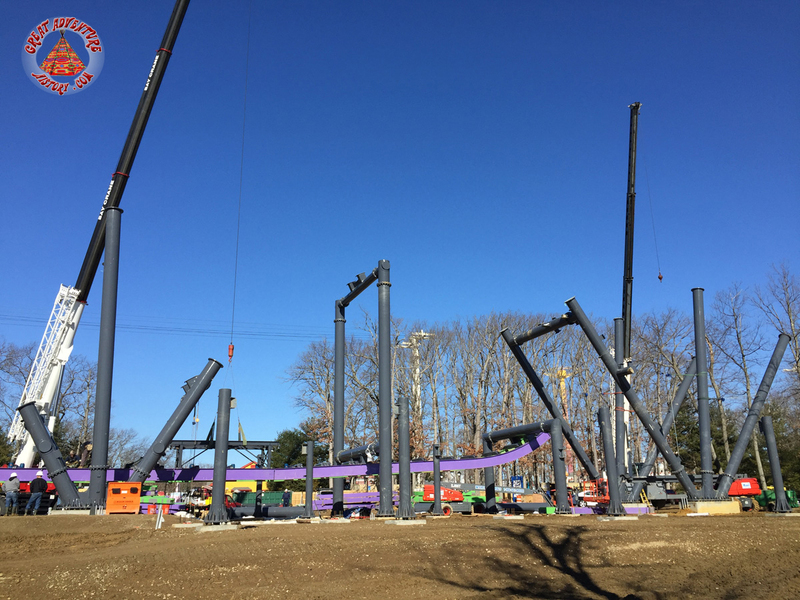 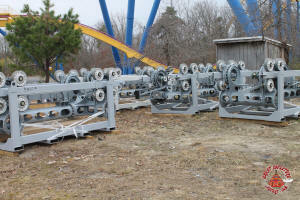 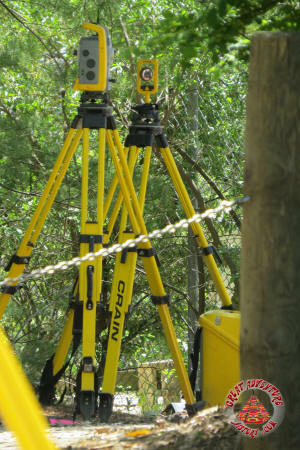 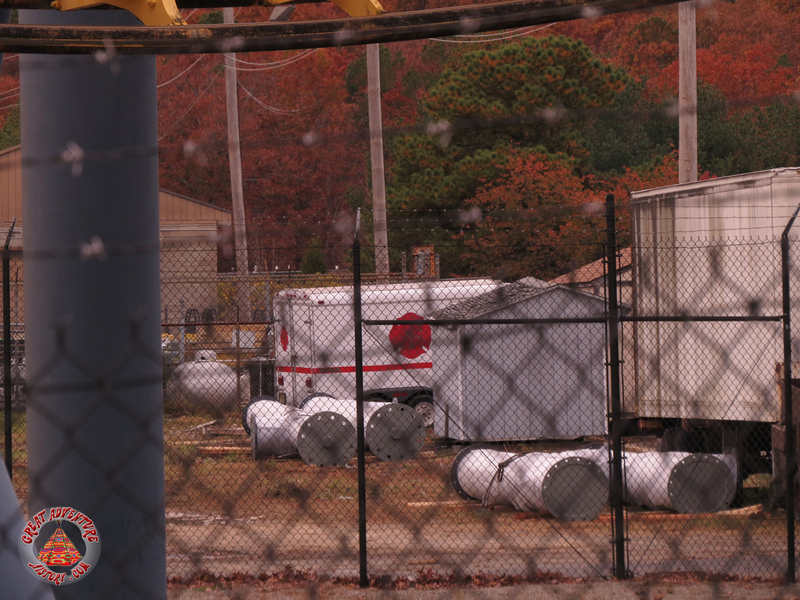 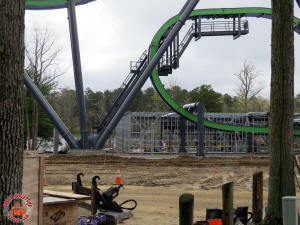 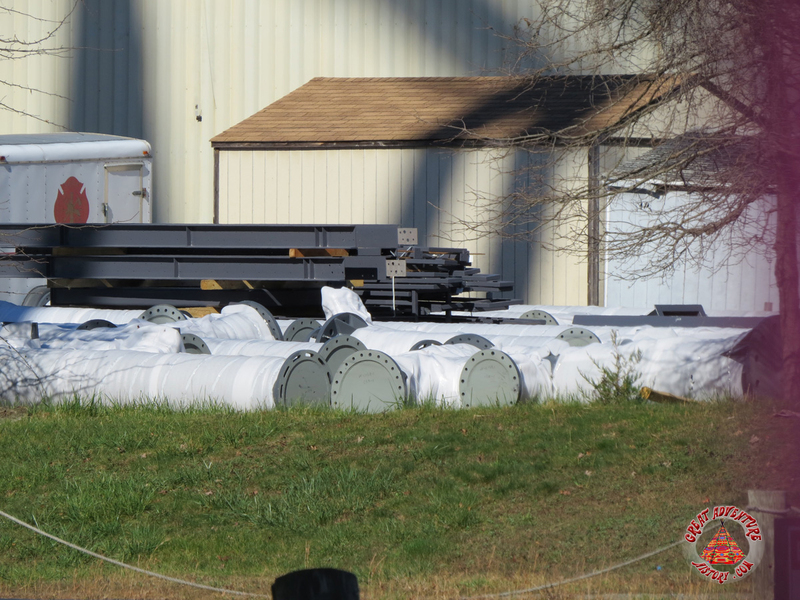 Before the end of the year coaster supports started showing up at the park, waiting in a backstage area for construction to begin. With the start of the new year assembly of the coaster began. 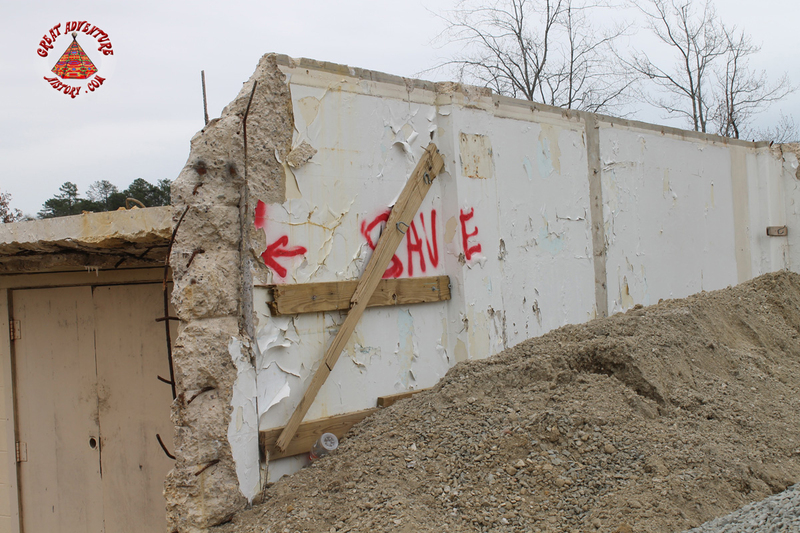 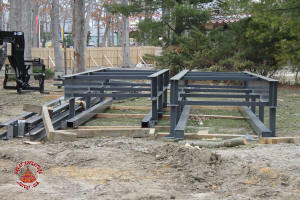 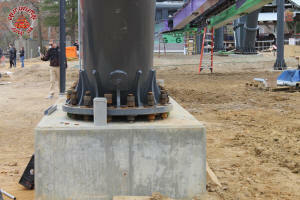 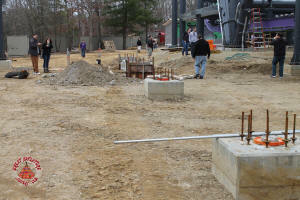 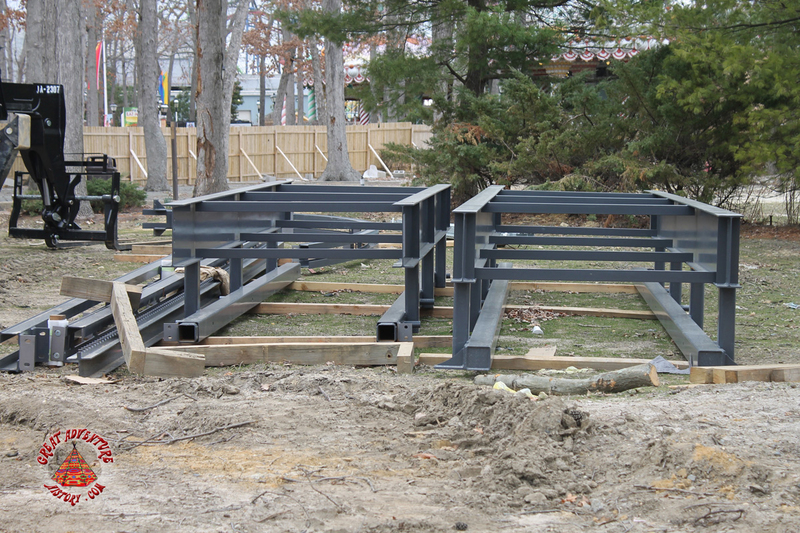 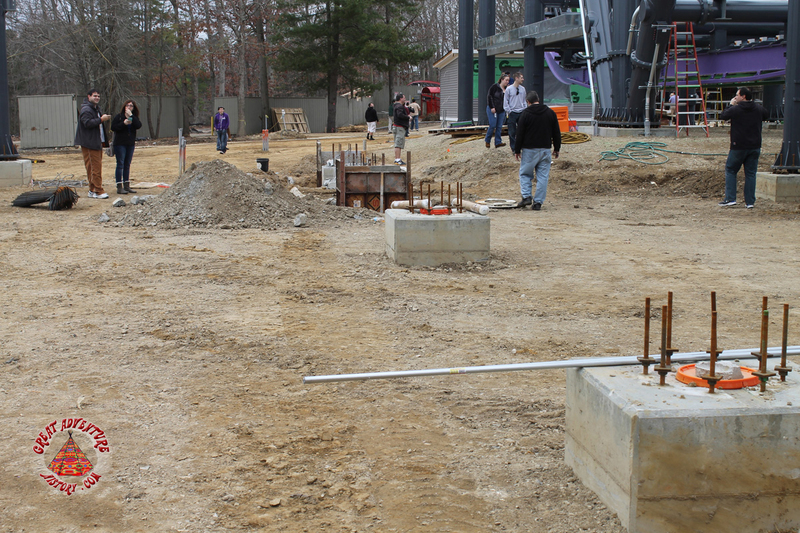 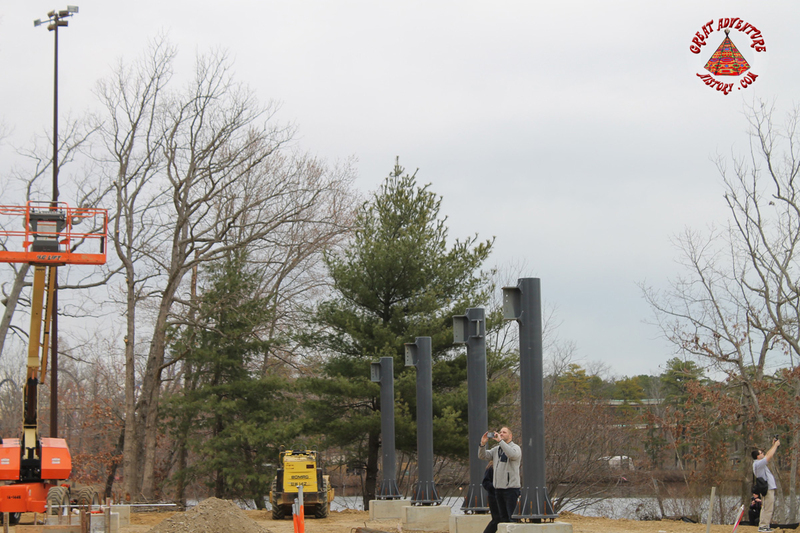 Support columns were soon added to the concrete footings that anchored the ride. 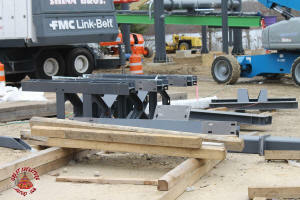 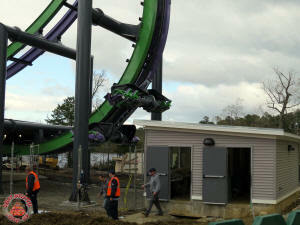 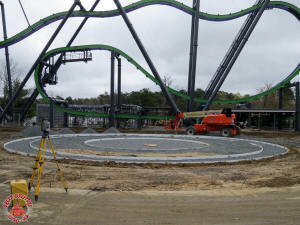 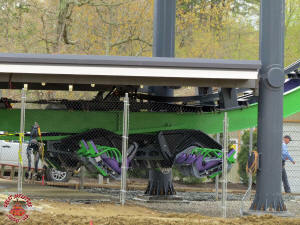 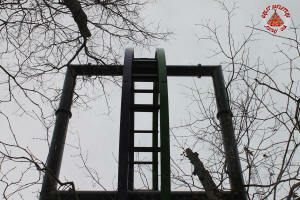 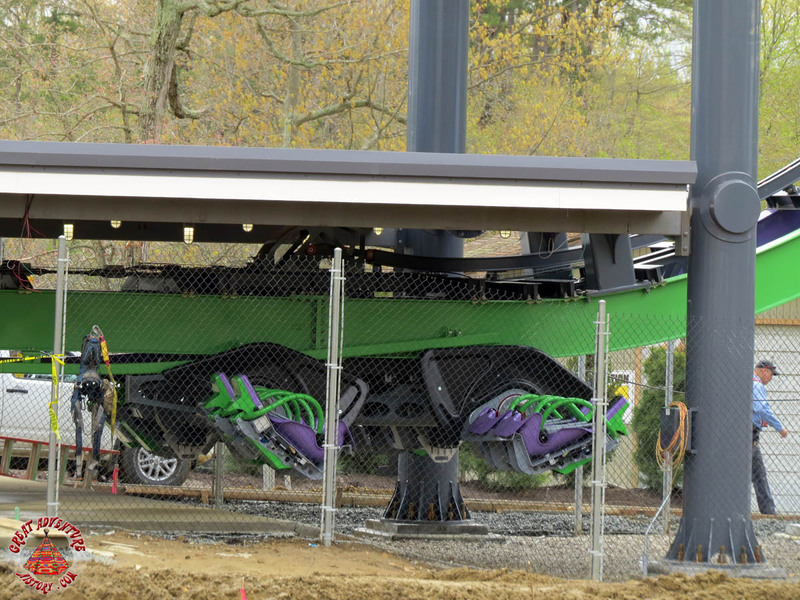 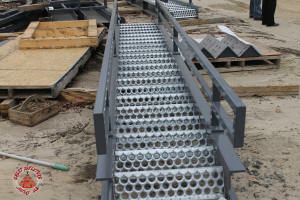 The relatively small footprint of the coaster made for quick work of the ride structure. 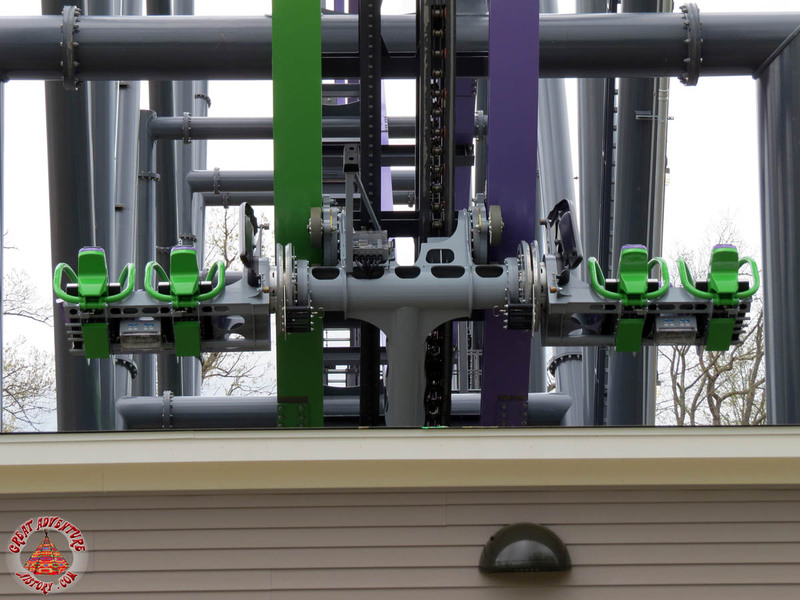 In the scheme of things, aside from the main support structure columns, the short individual rail sections were relatively light weight as far as roller coaster construction goes which made assembly that much easier. 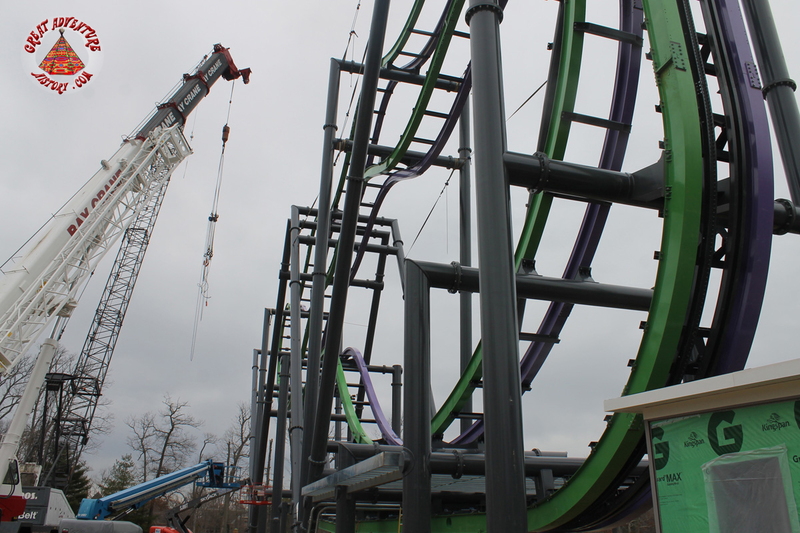 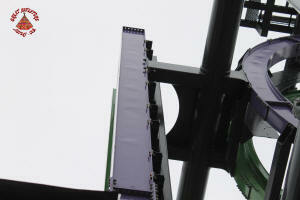 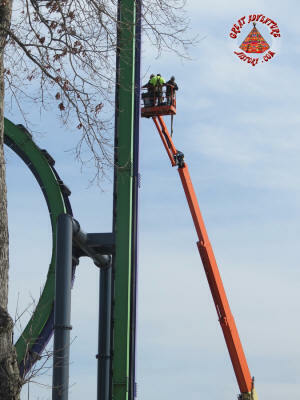 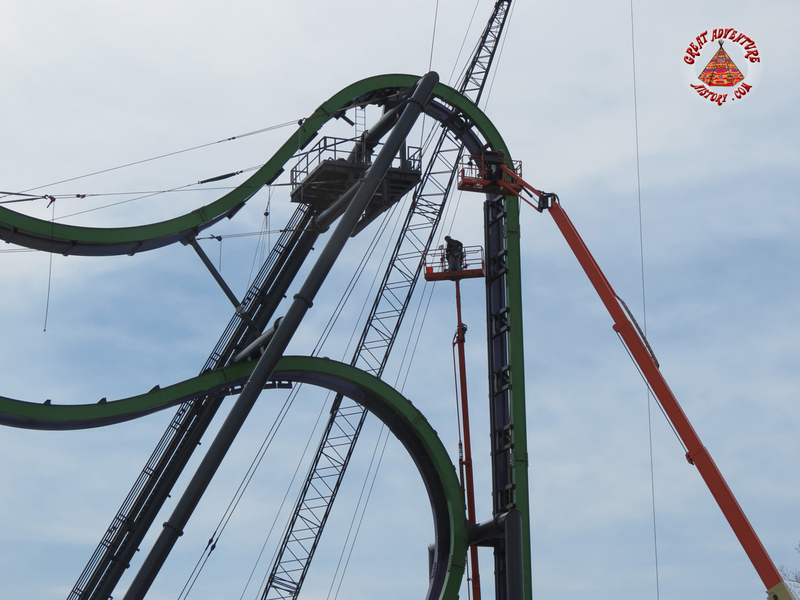 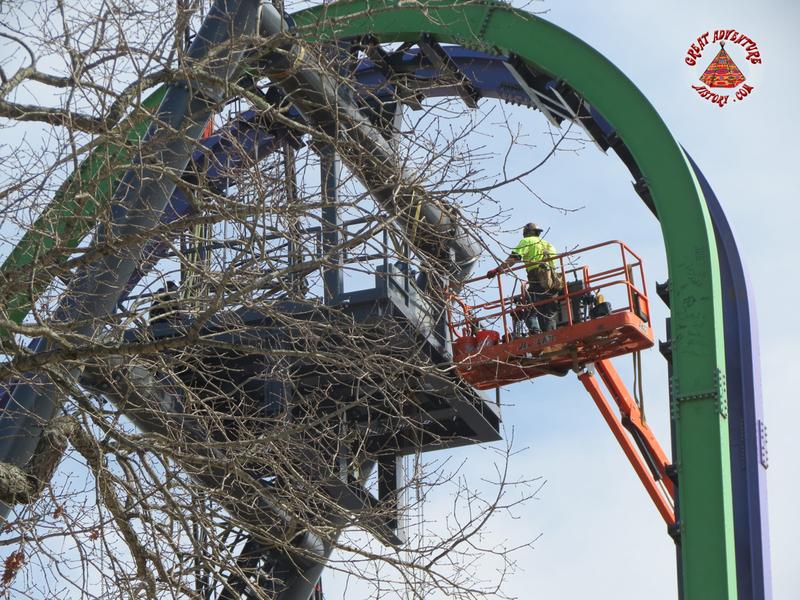 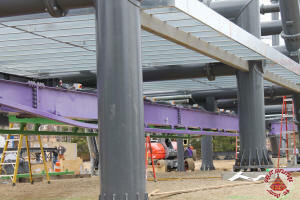 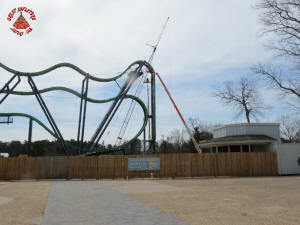 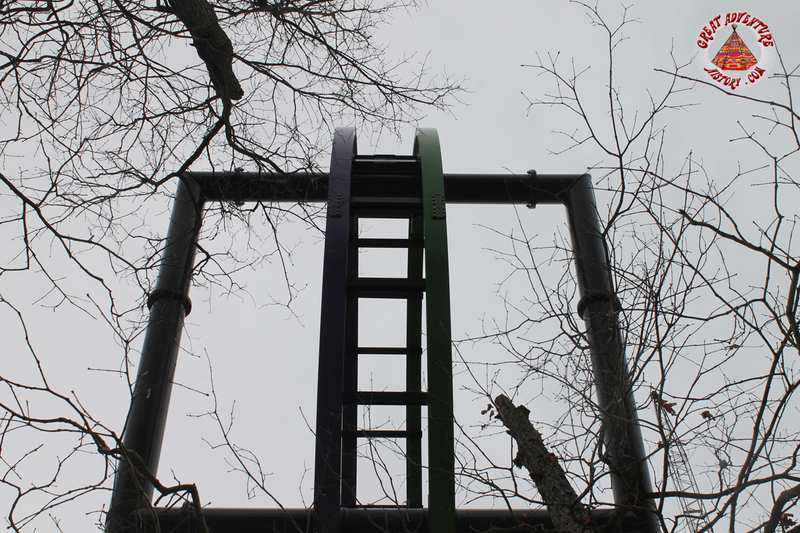 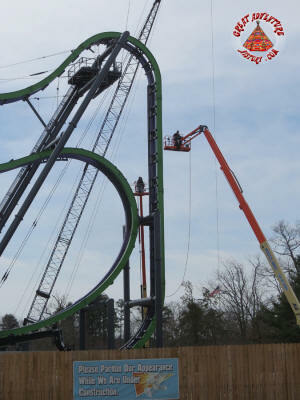 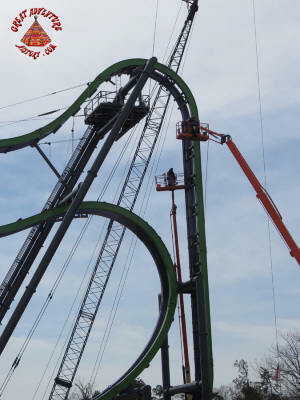 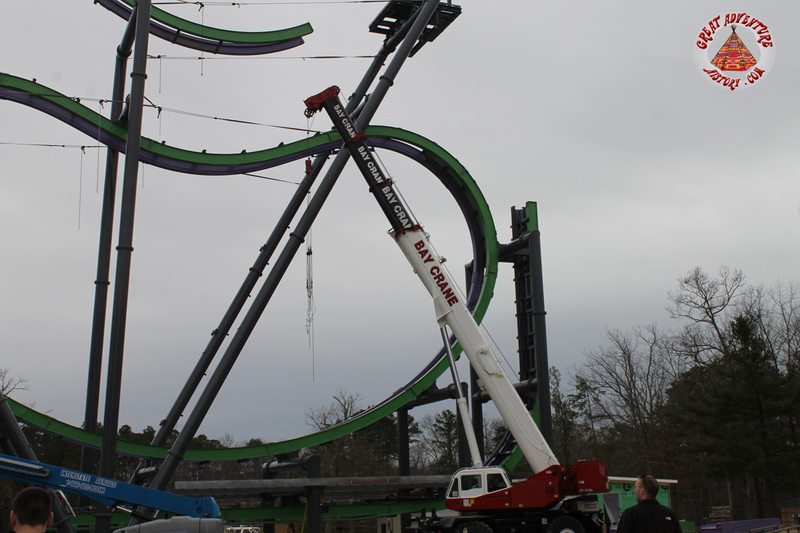 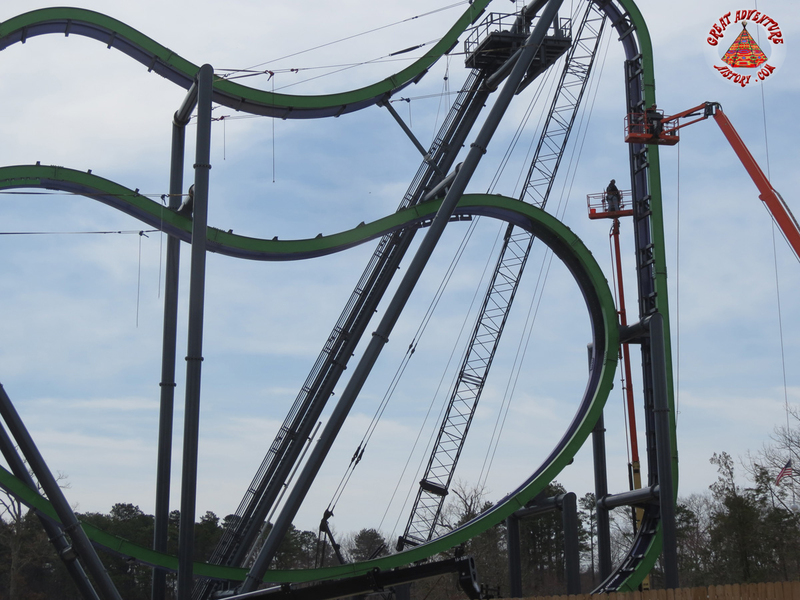 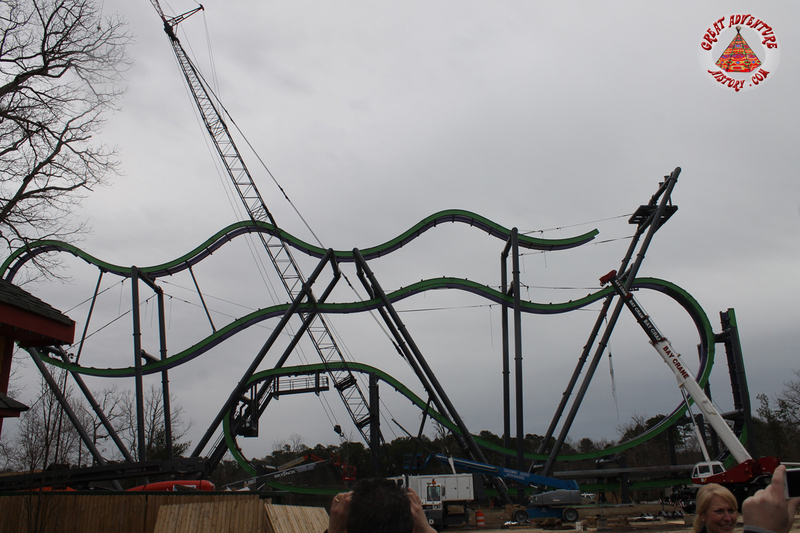 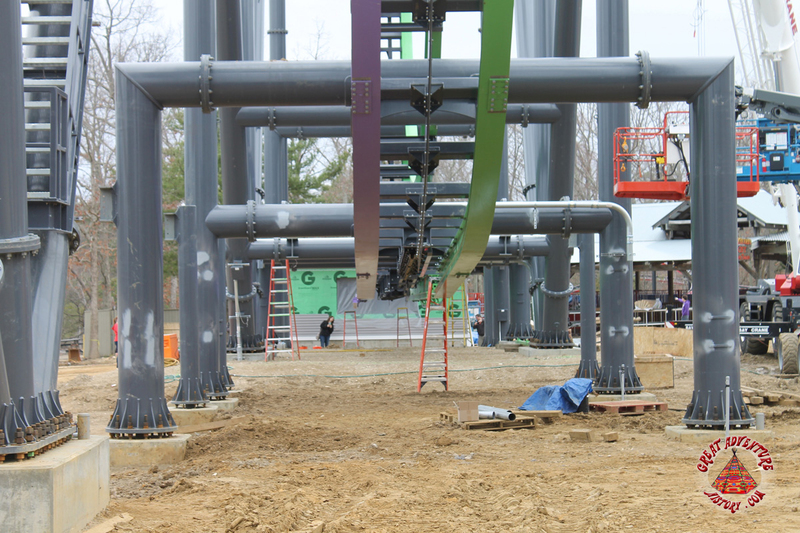 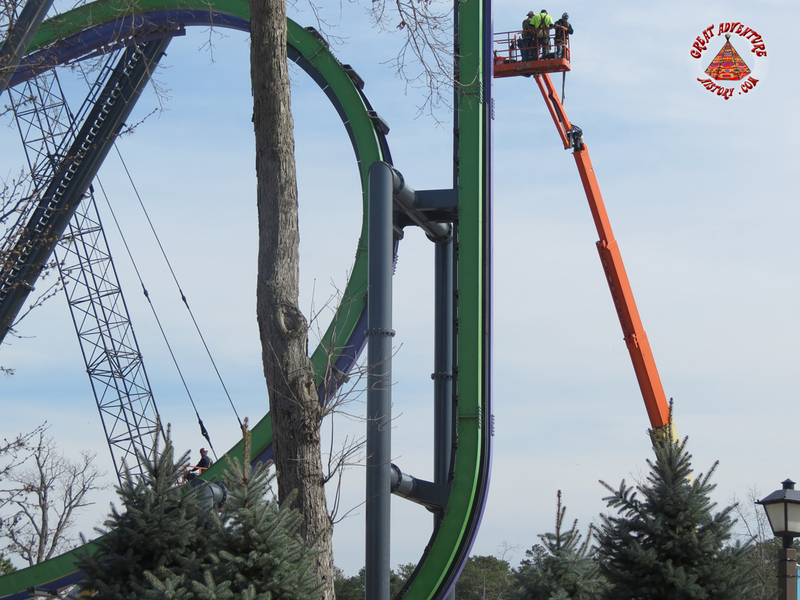 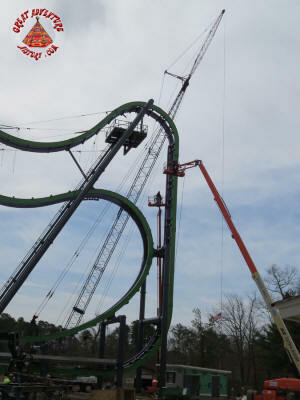 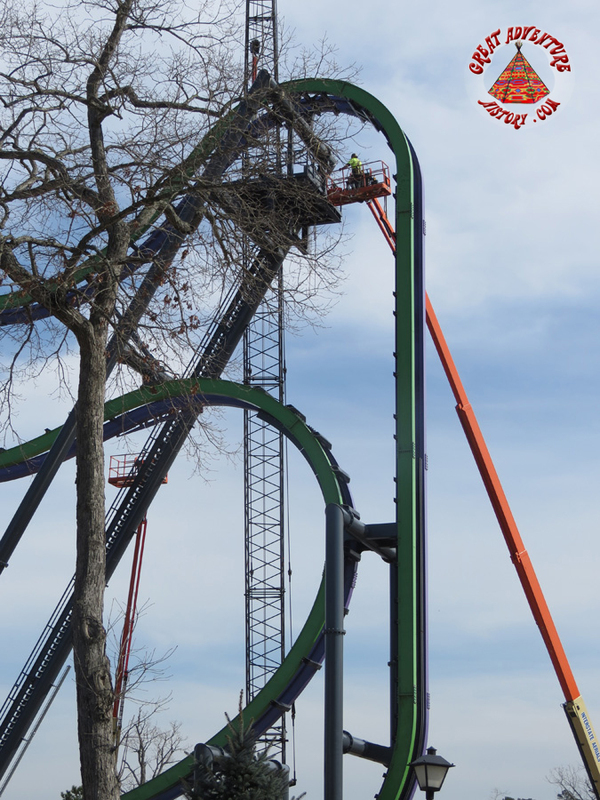 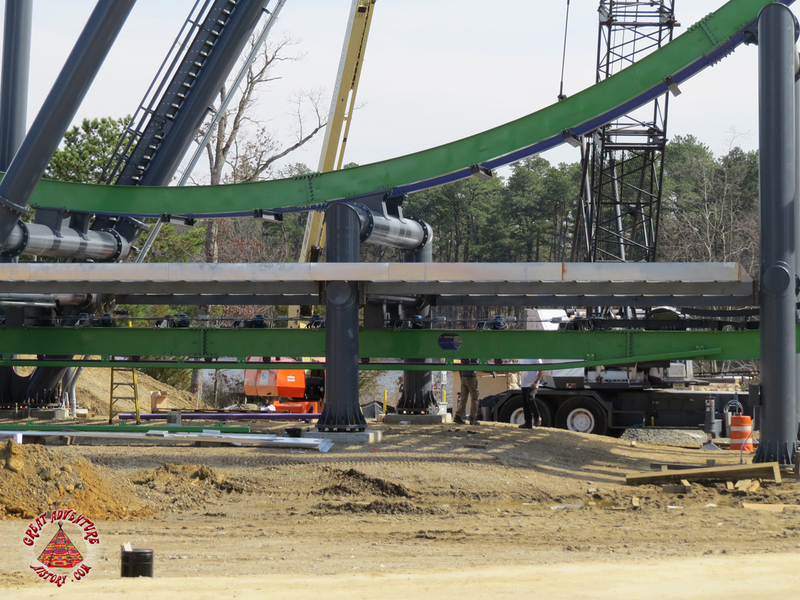 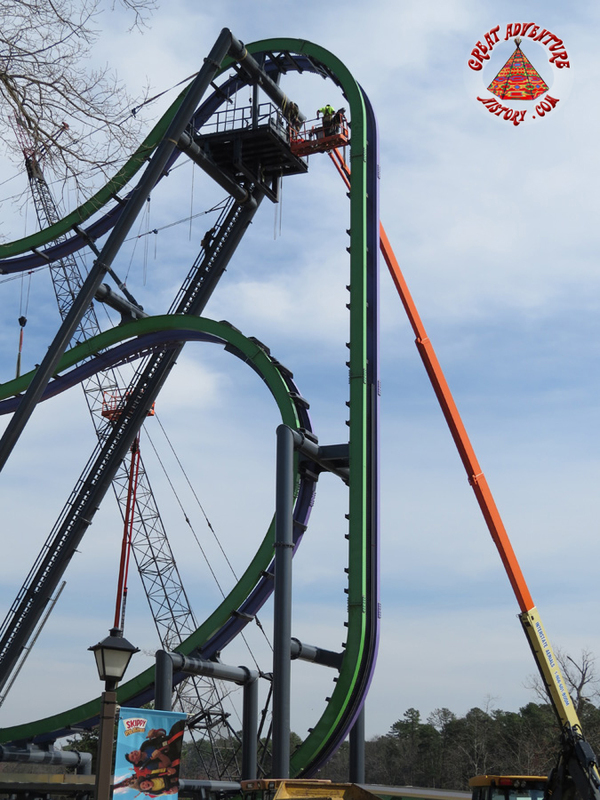 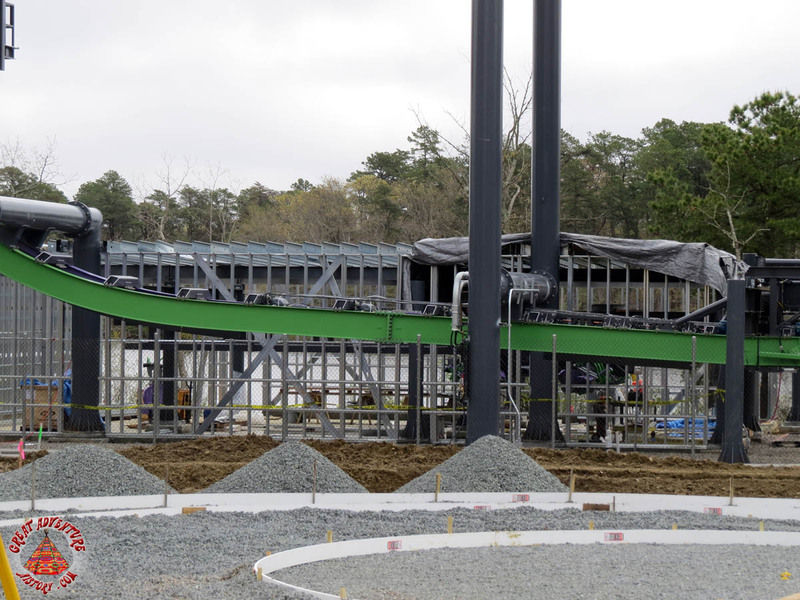 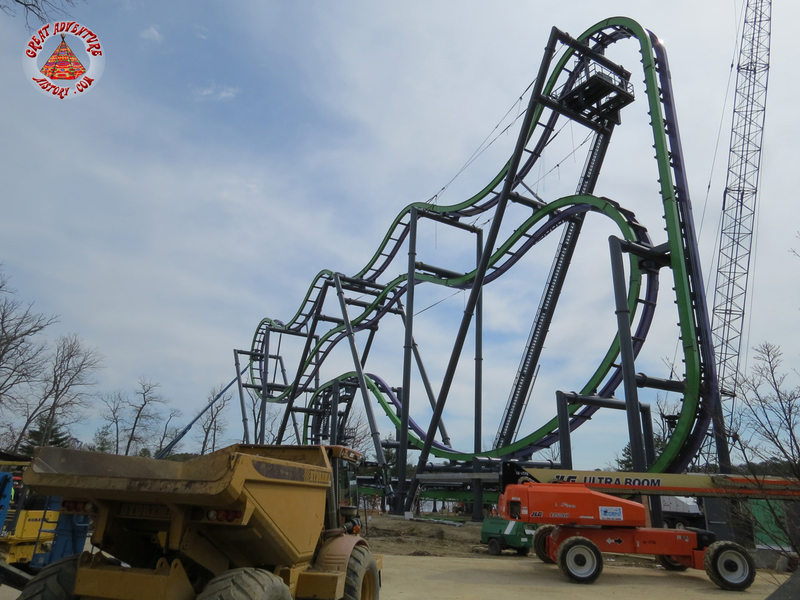 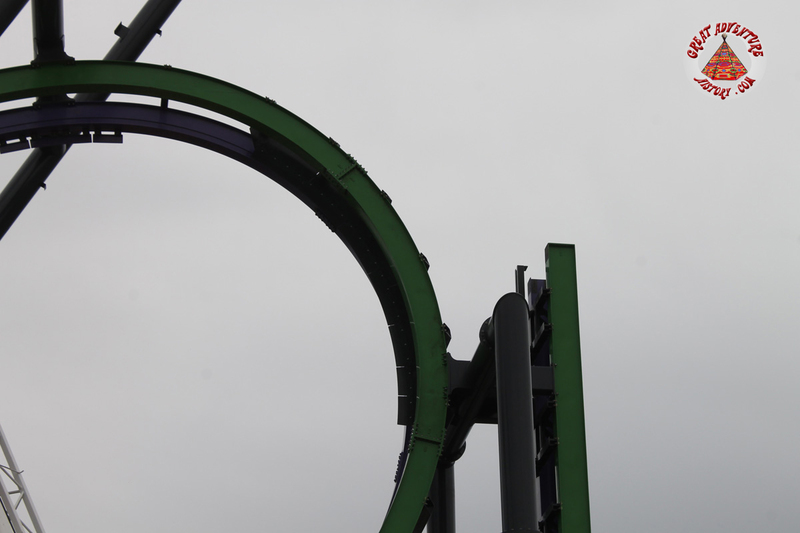 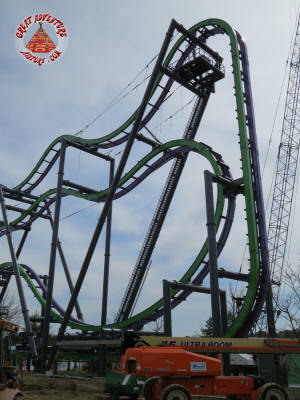 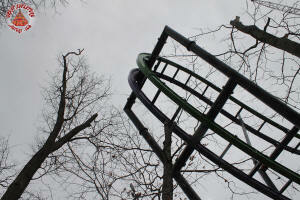 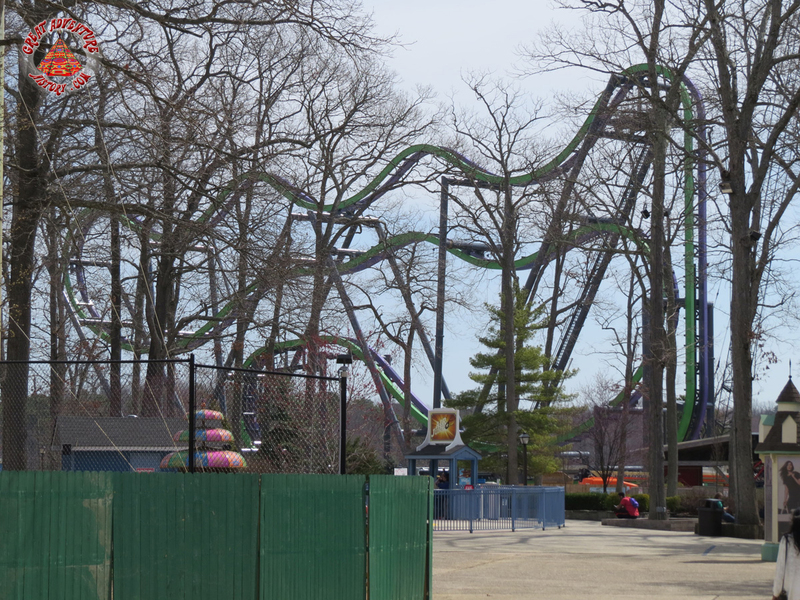 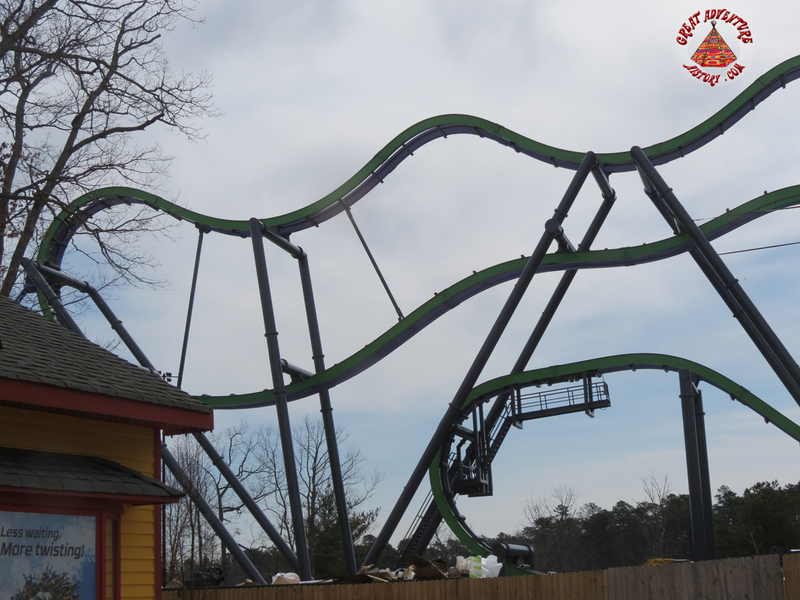 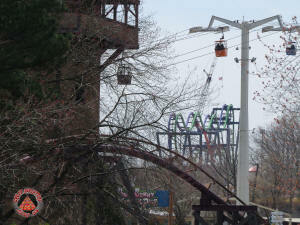 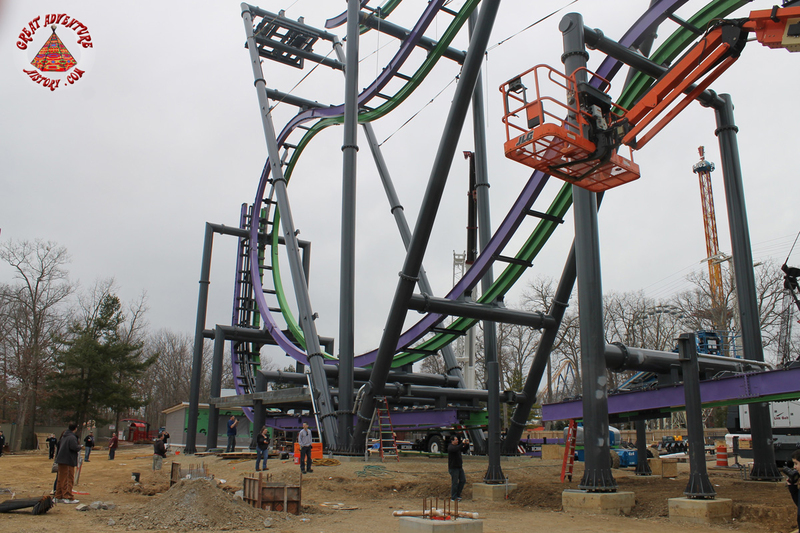 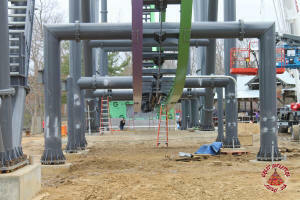 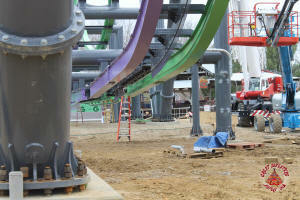 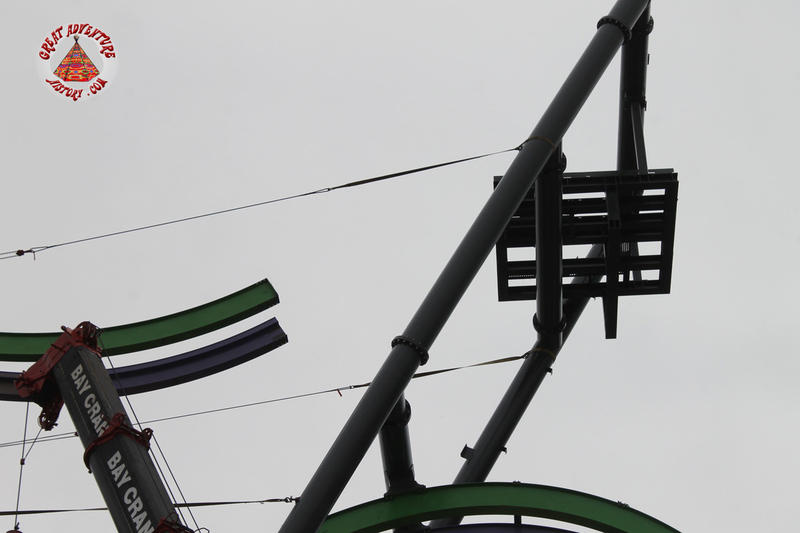 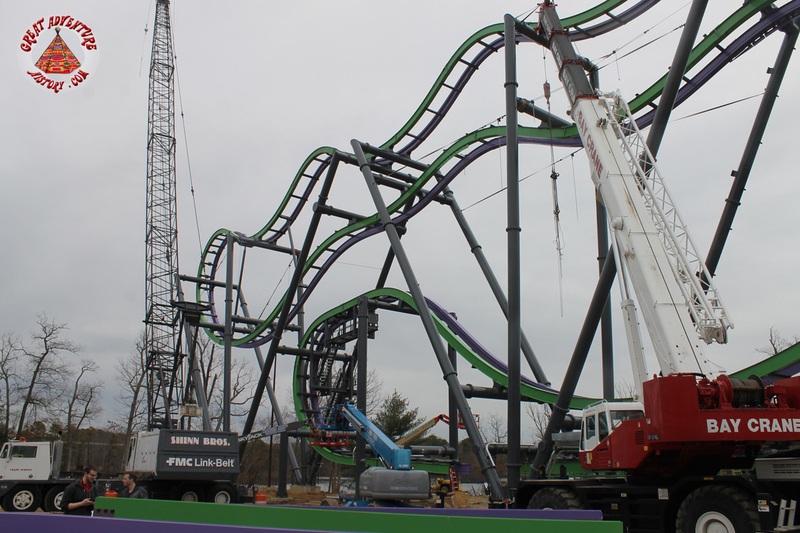 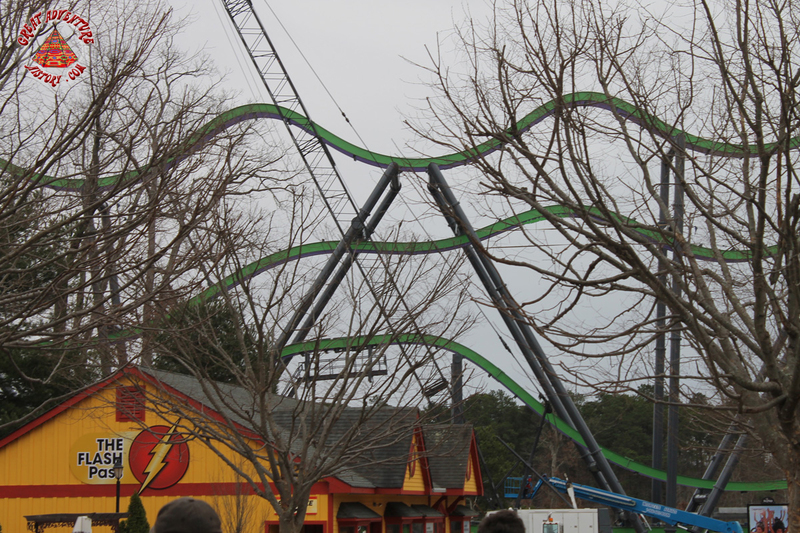 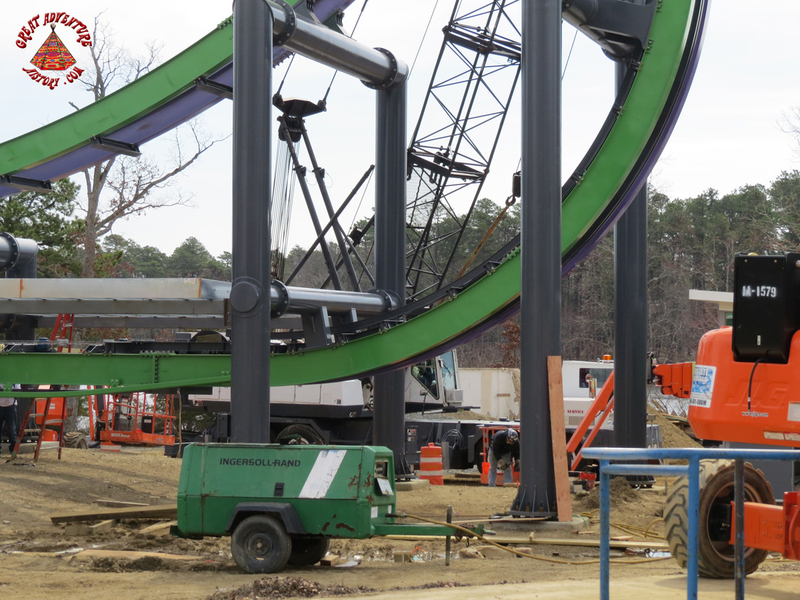 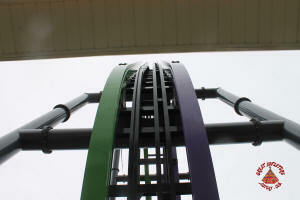 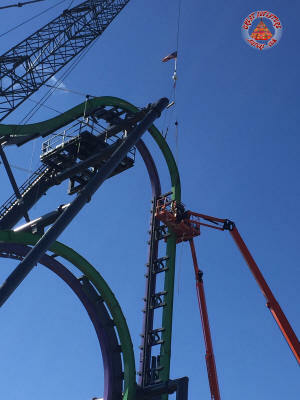 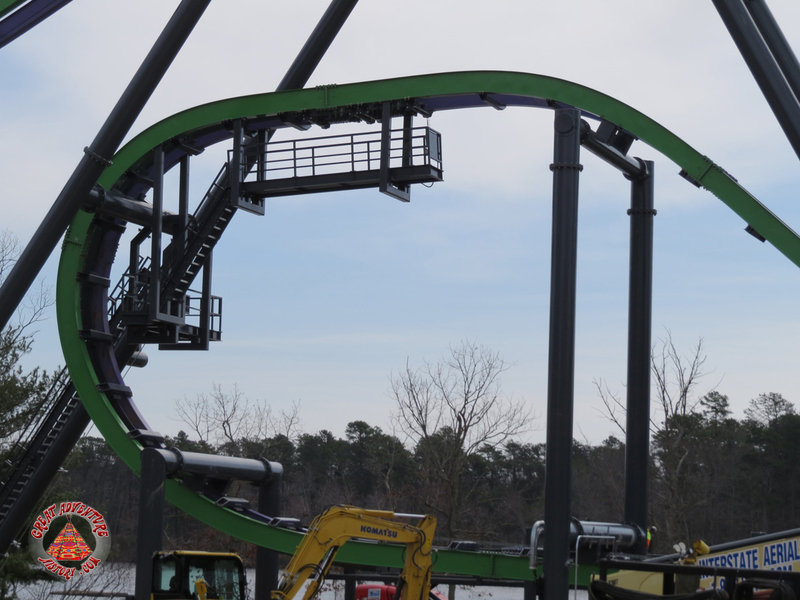 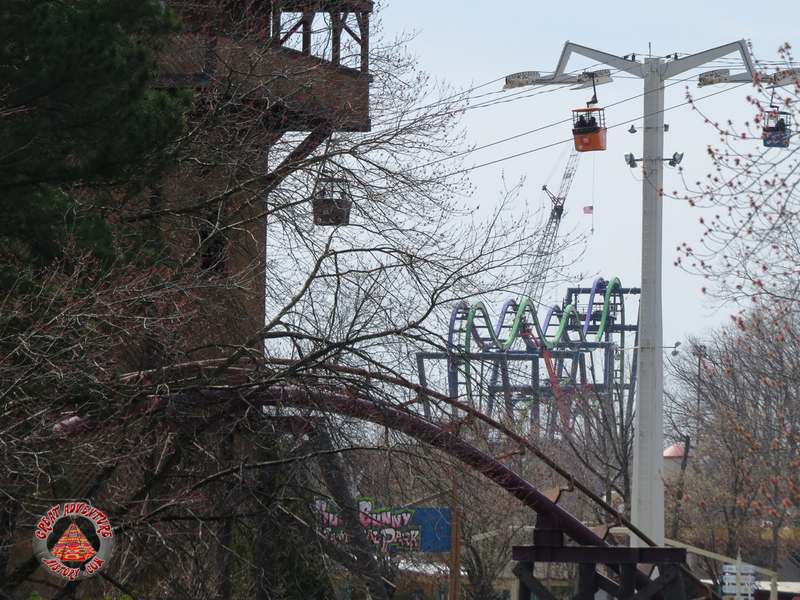 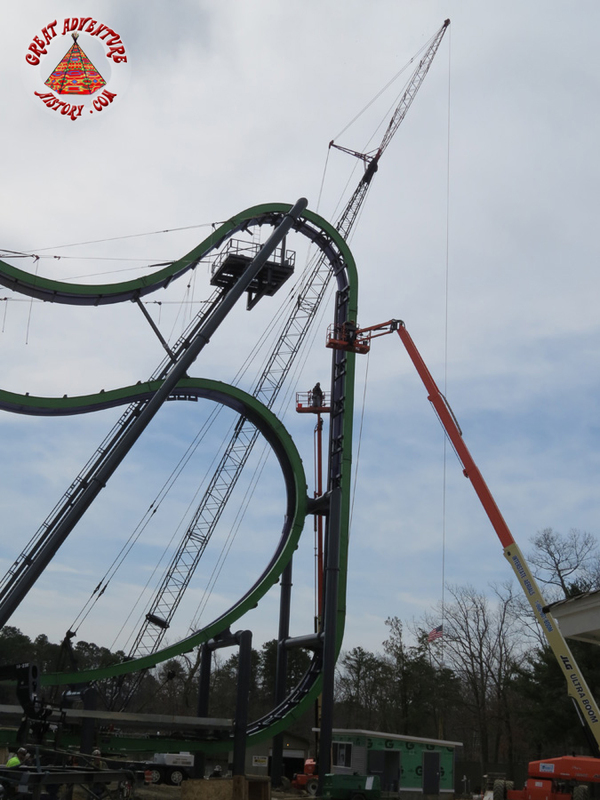 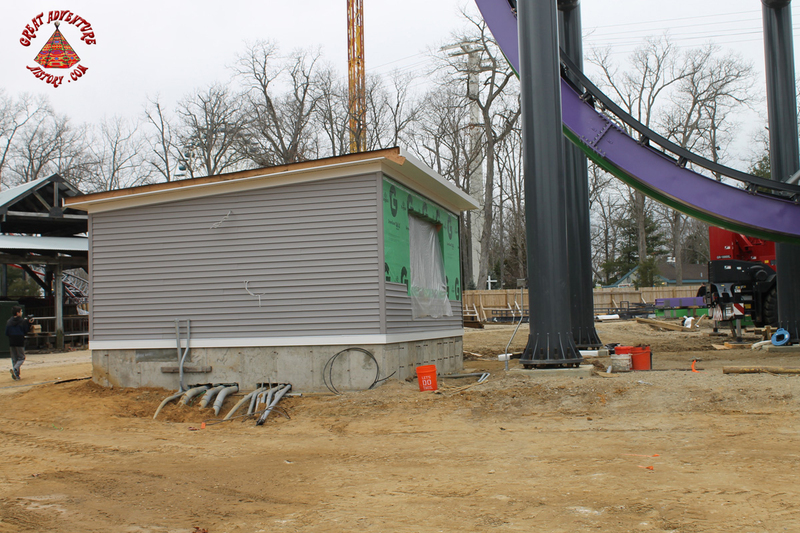 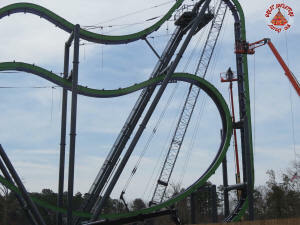 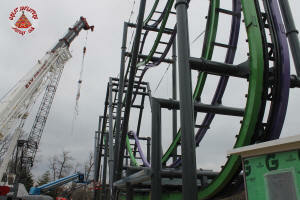 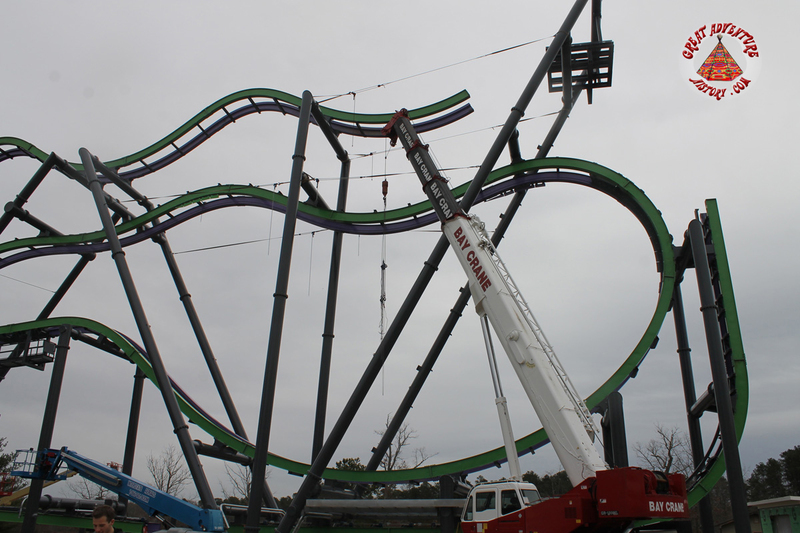 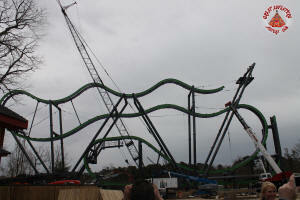 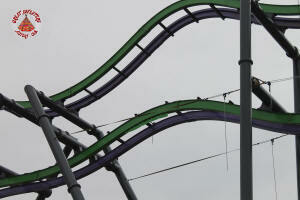 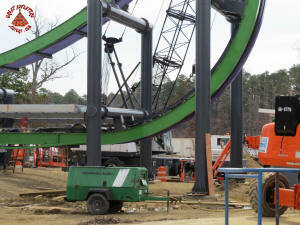 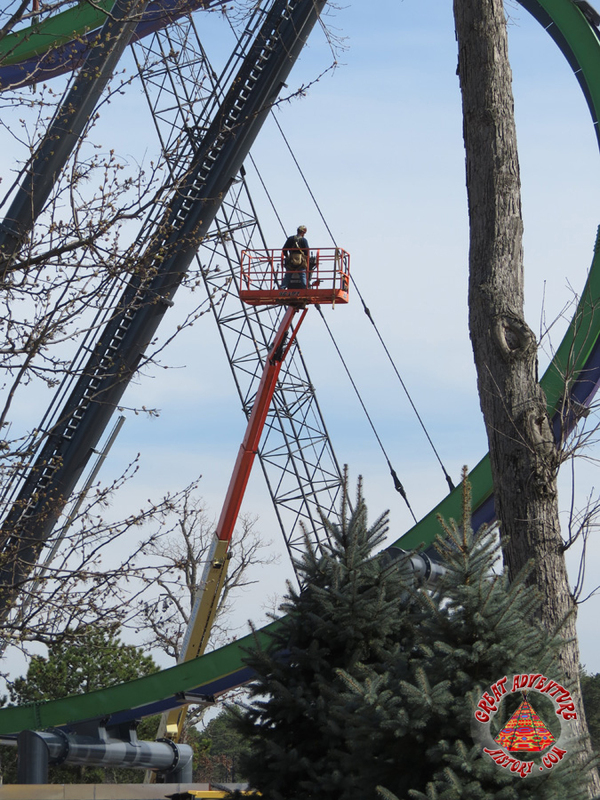 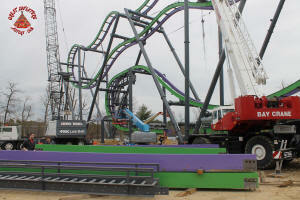 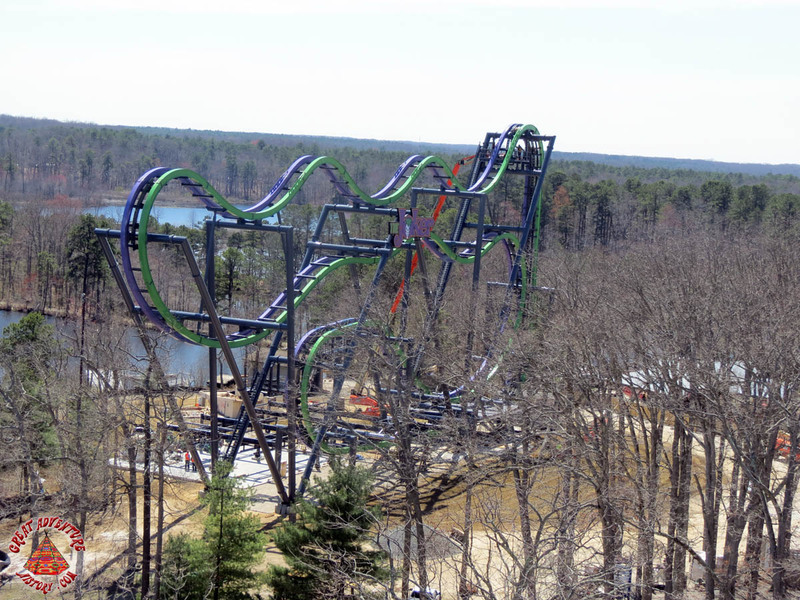 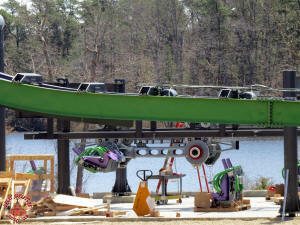 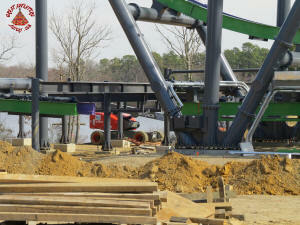 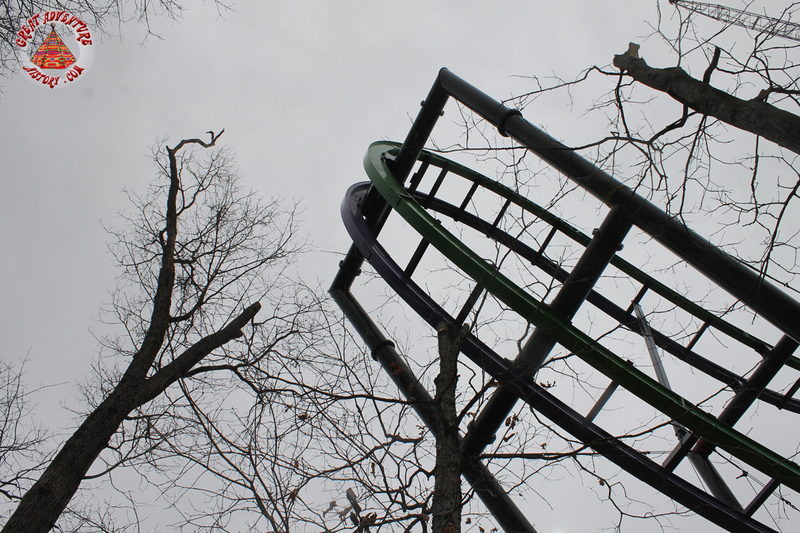 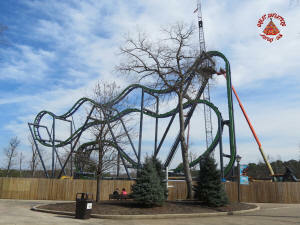 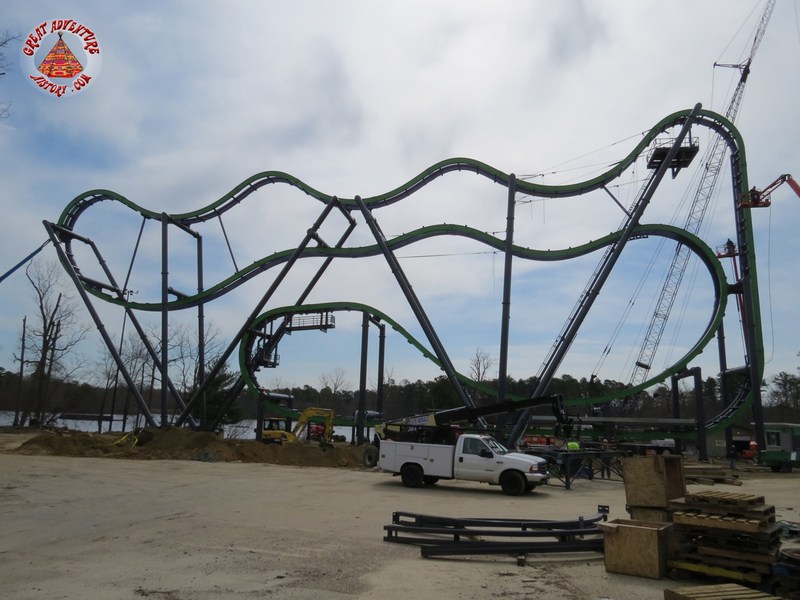 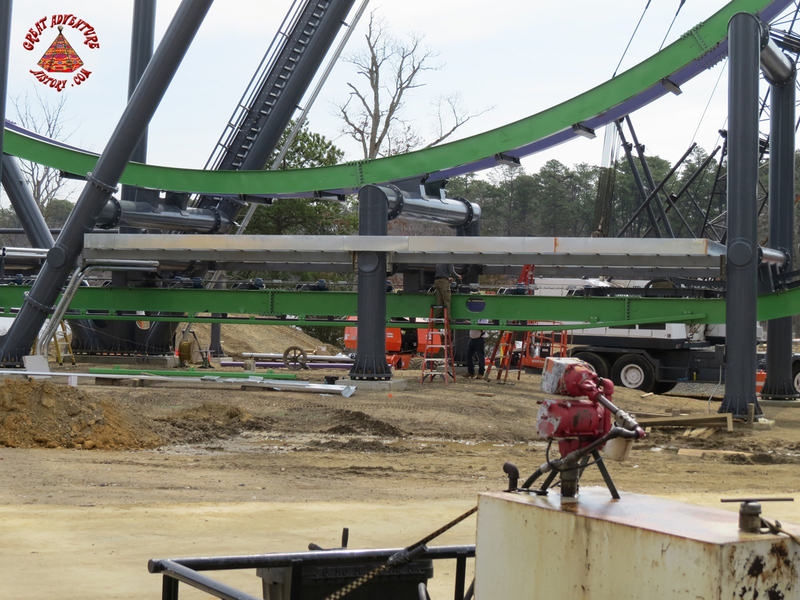 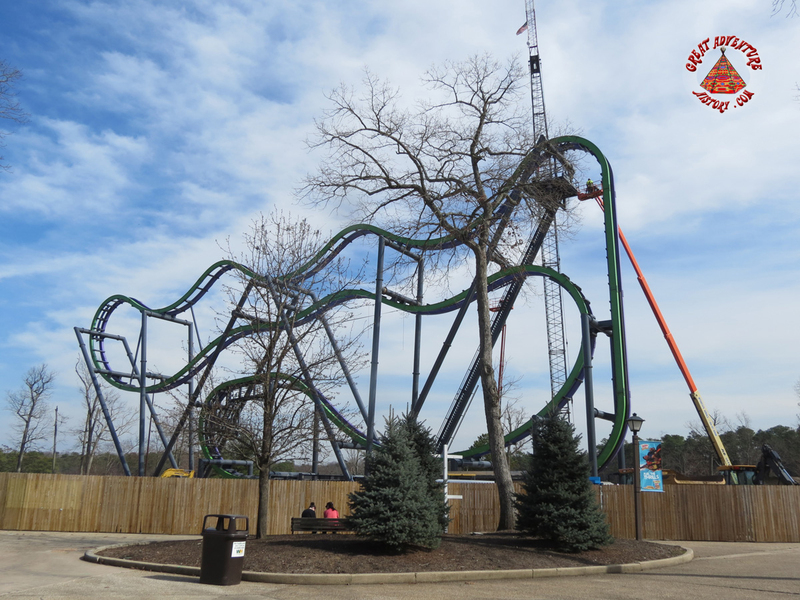 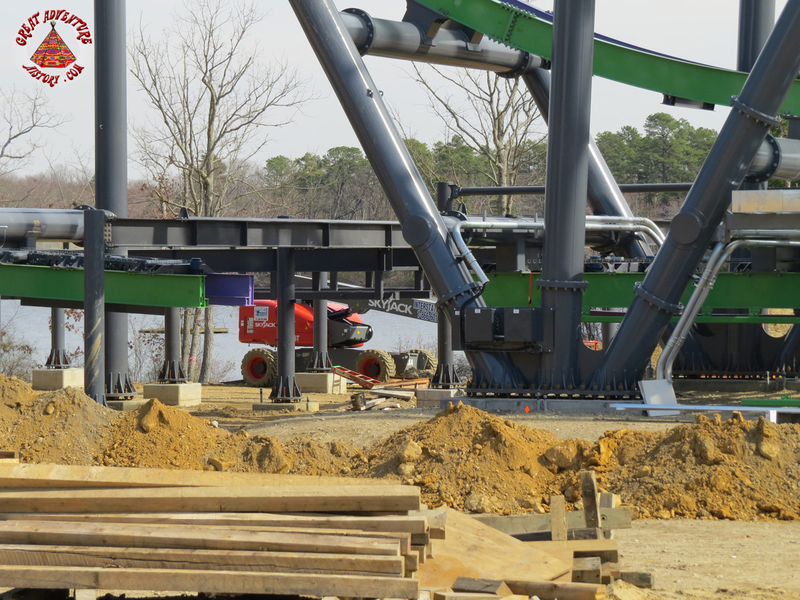 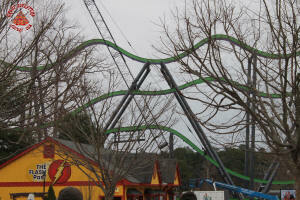 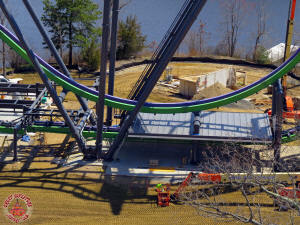 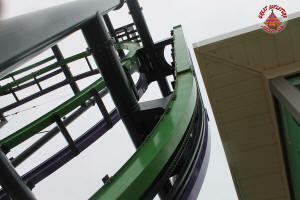 The final piece of the track at the top of the lift hill was put in place on St. Patrick's Day. 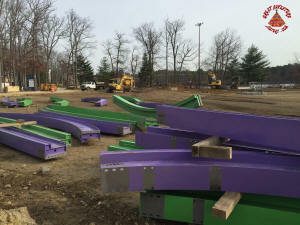 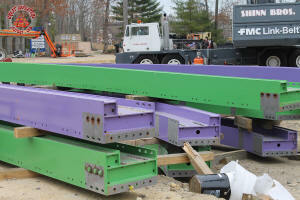 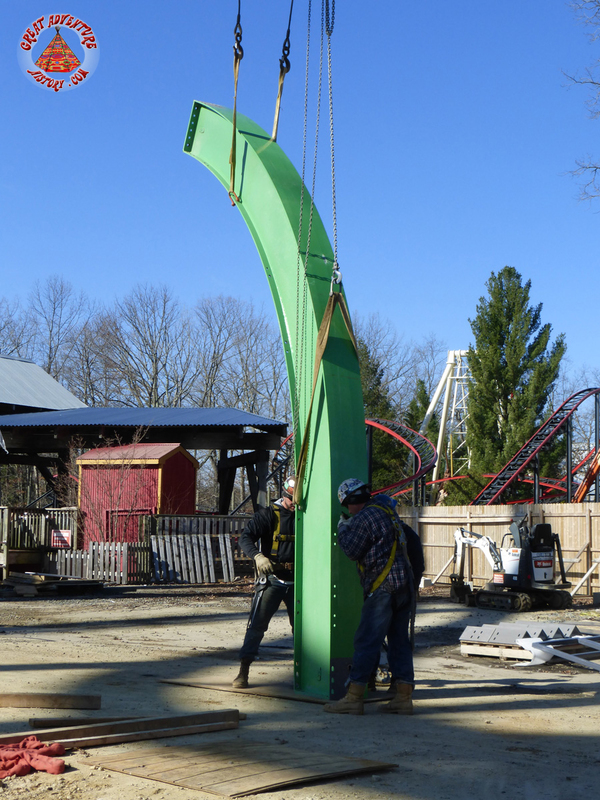 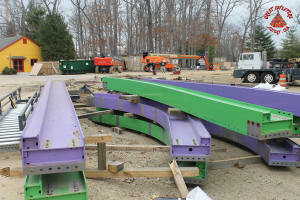 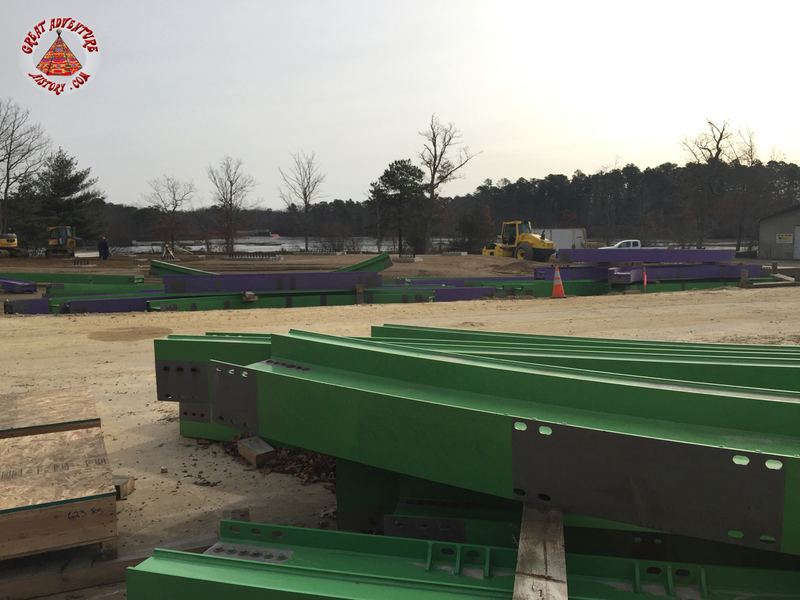 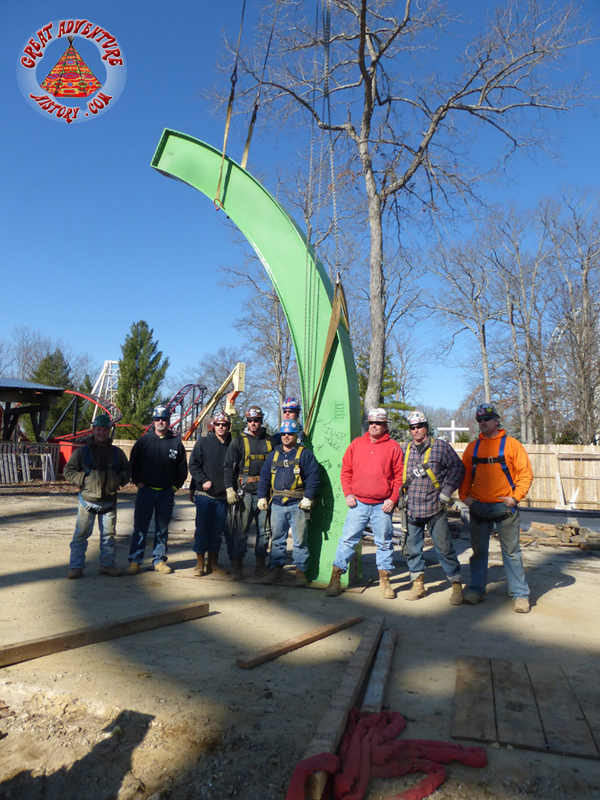 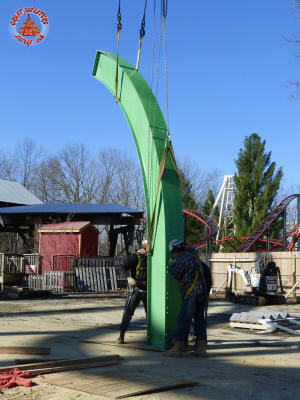 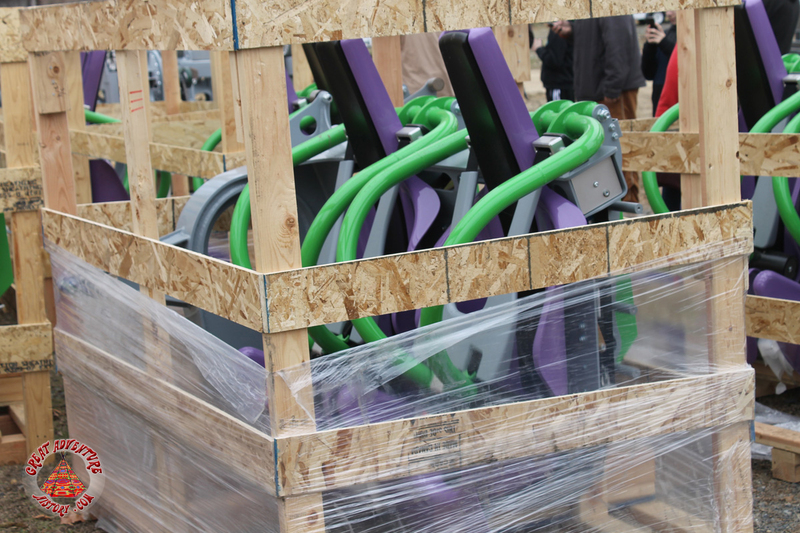 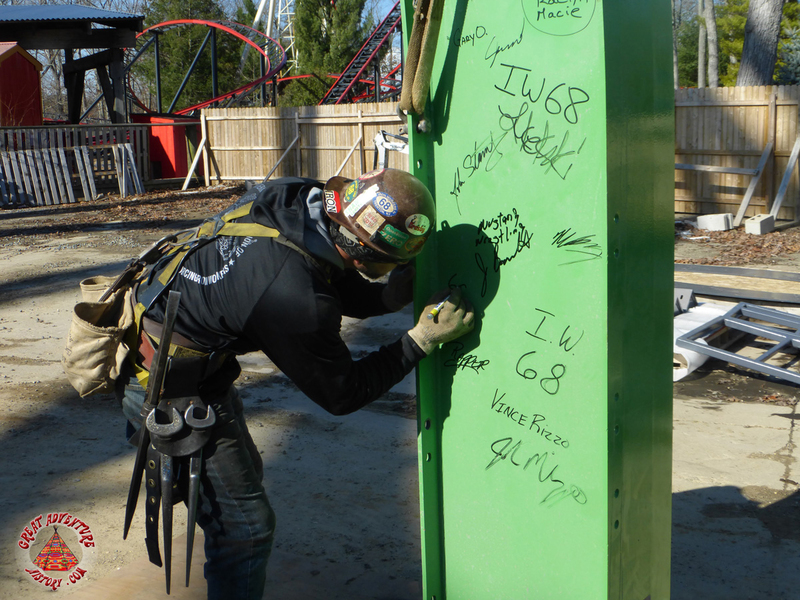 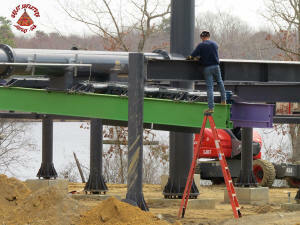 Fittingly it was a green section of track, and prior to installation it was signed by the iron workers who were responsible for building the ride structure over the winter. 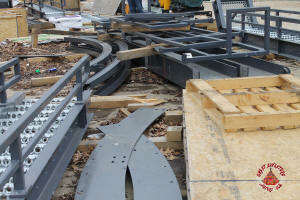 Meanwhile, work had started on putting the cars together which would perform all the acrobatic stunts traversing the rails. 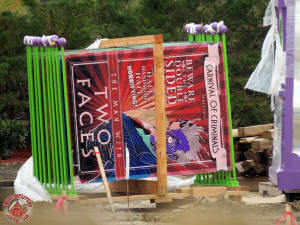 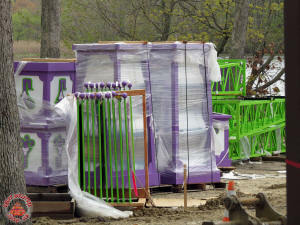 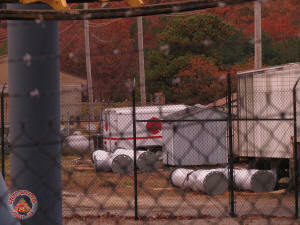 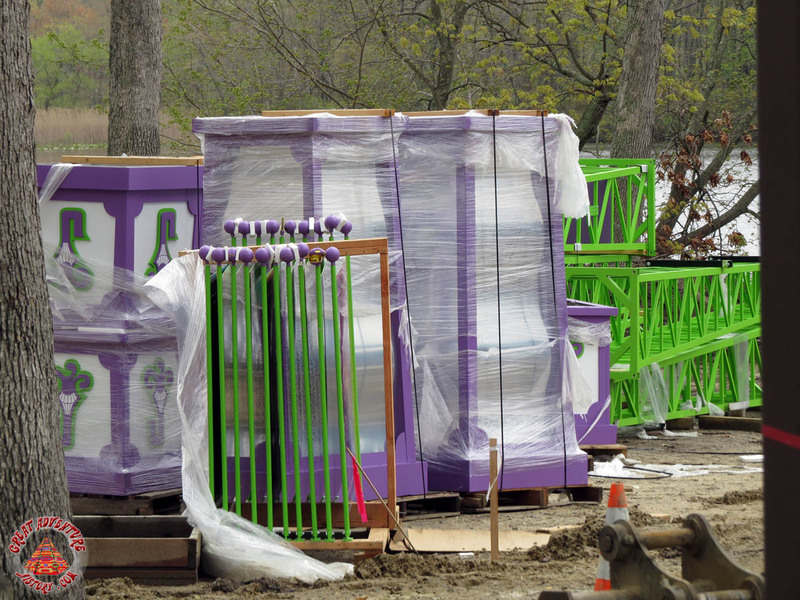 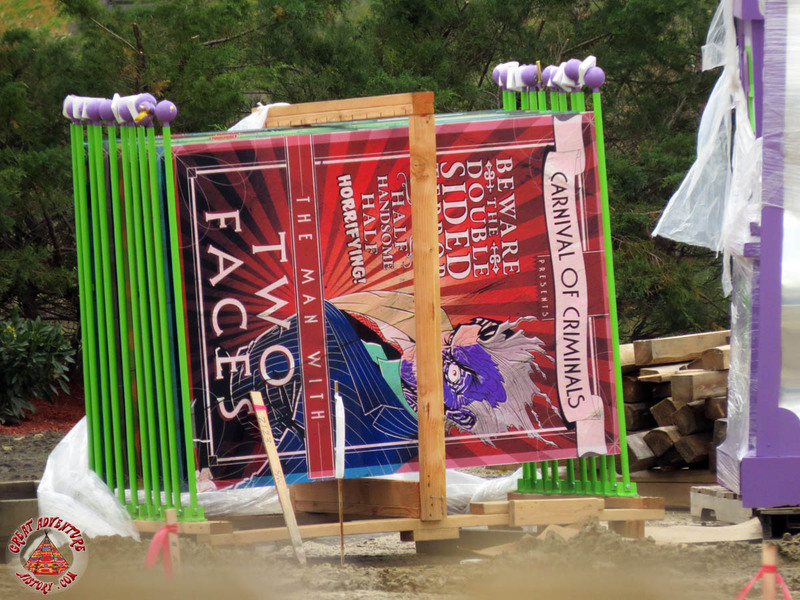 The Joker's ride vehicles arrived in several parts. 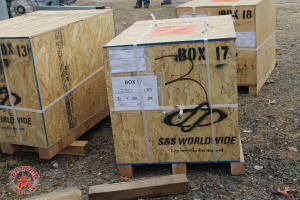 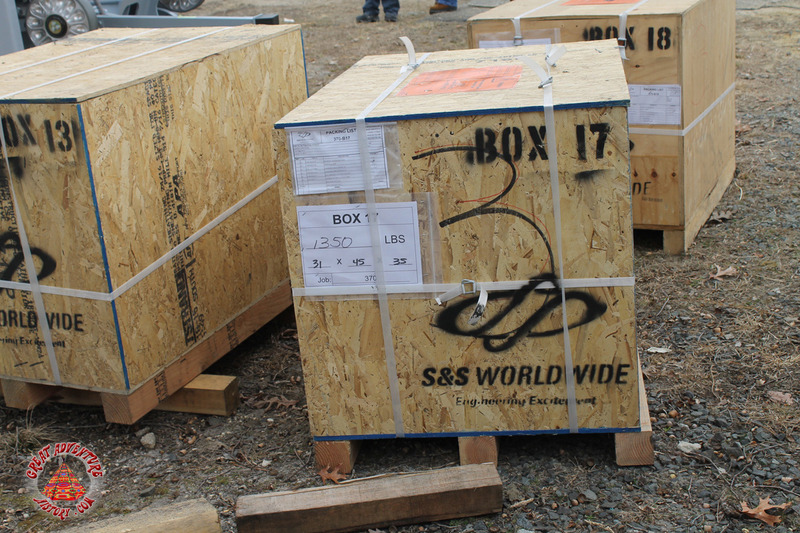 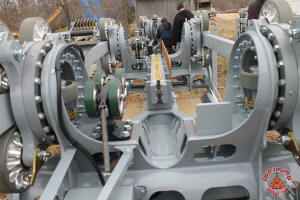 The seats came boxed up in crates and the wheel and axle assemblies on metal frames. 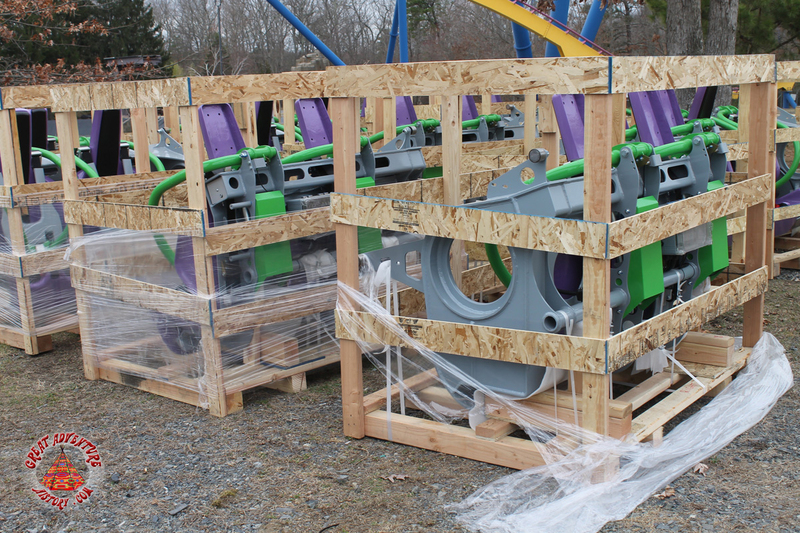 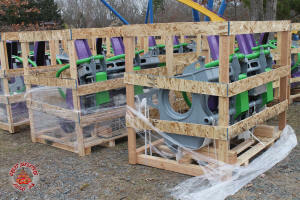 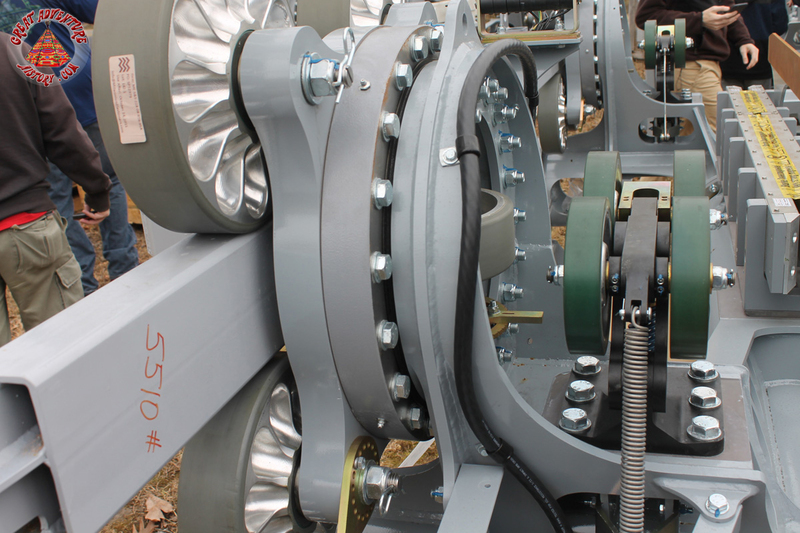 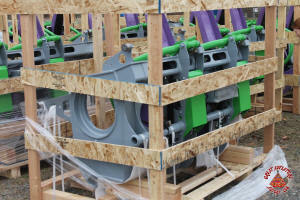 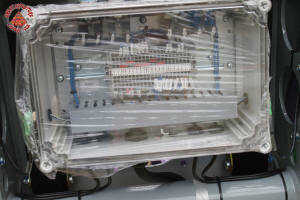 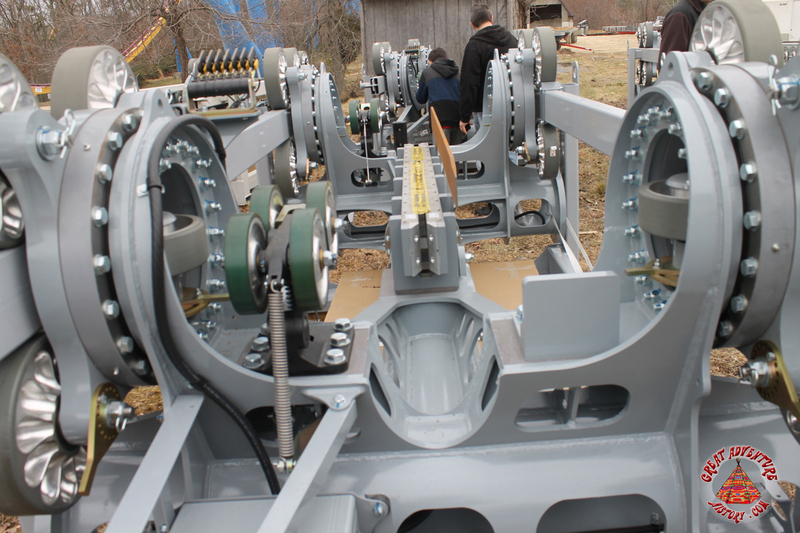 The cars were assembled on site as part of the ride installation. 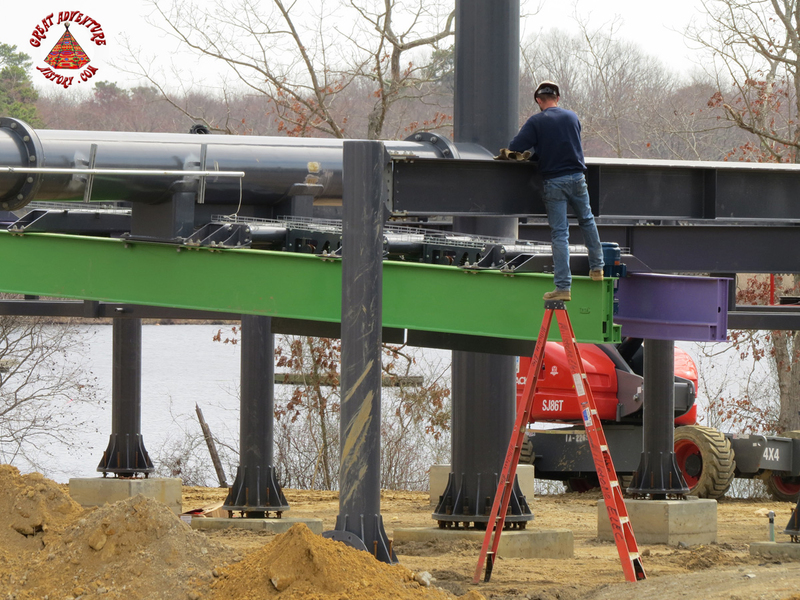 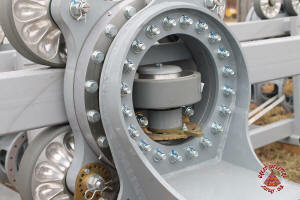 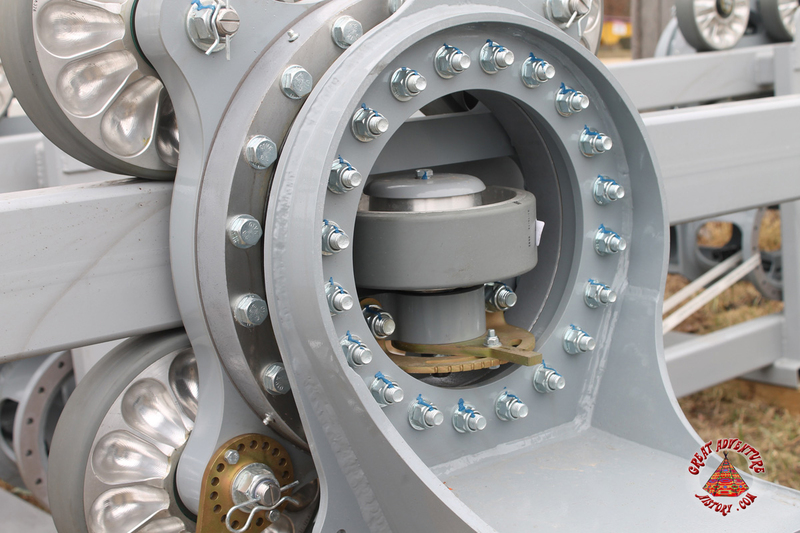 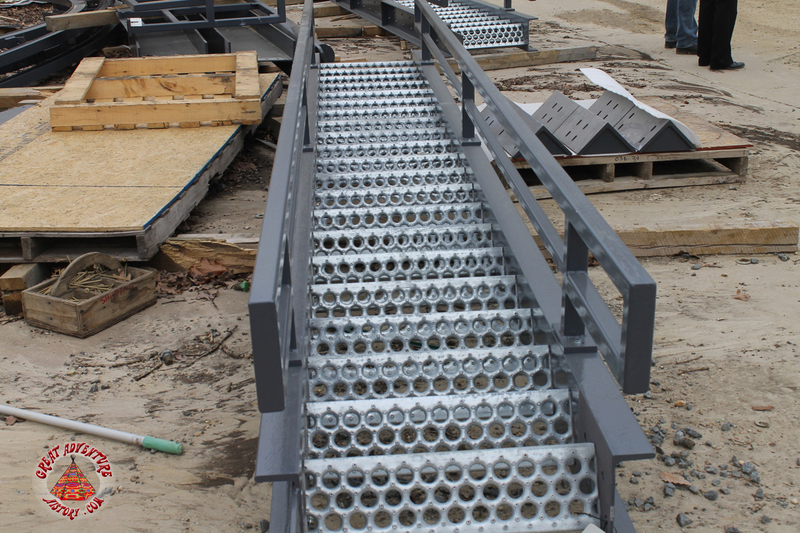 Along the rails in some key locations several specially designed plates or fins were installed. These serve as triggers which cause the rotation of the cars inverting guests through their journey- the more fins, the more flips. These would be adjusted during the first several months in an effort to strike the best balance between an enjoyable exciting ride and a too thrilling nauseating experience. 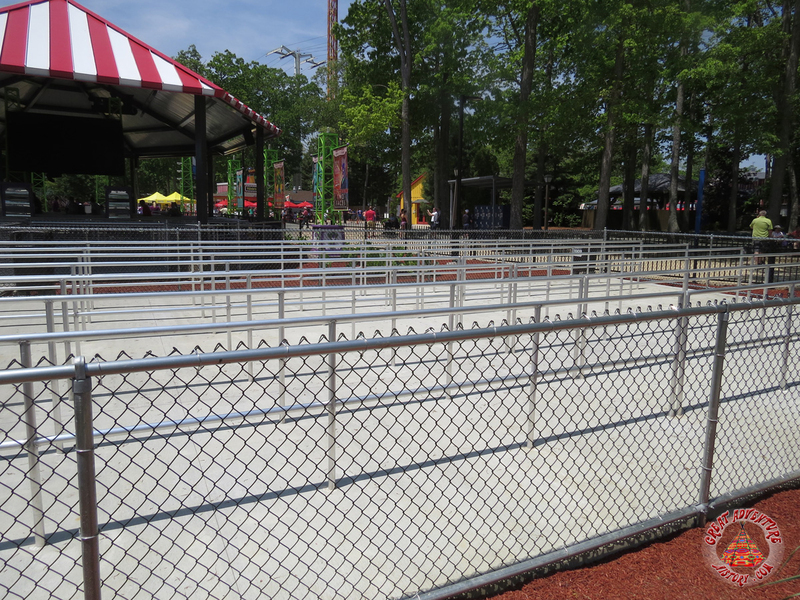 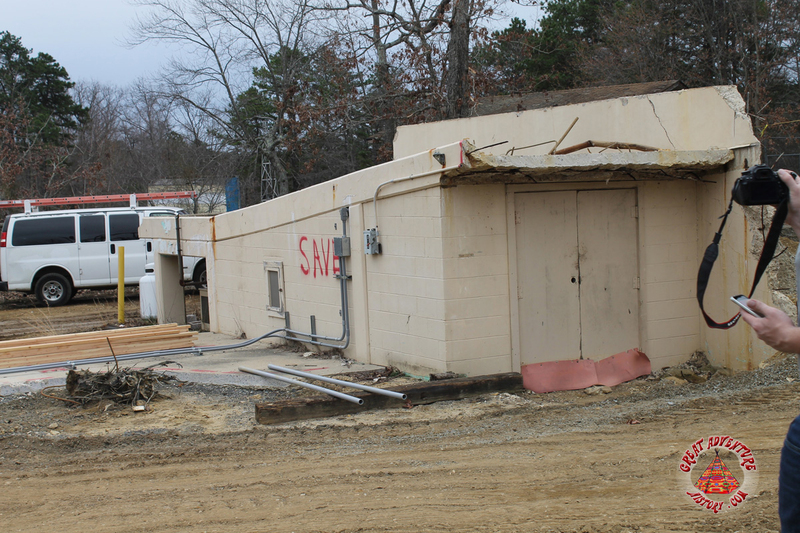 On opening day of the 2016 season, the view guests got as they entered the park had changed immensely. 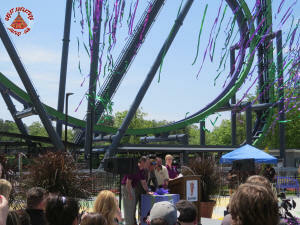 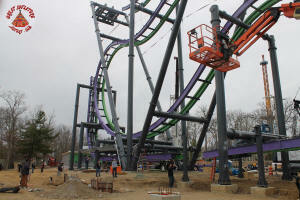 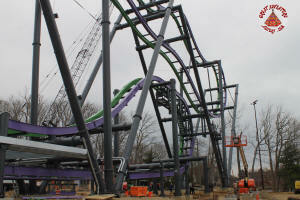 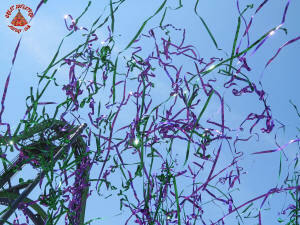 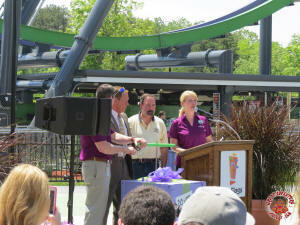 The new green and purple roller coaster was a huge difference from the massive old Aqua Stadium. 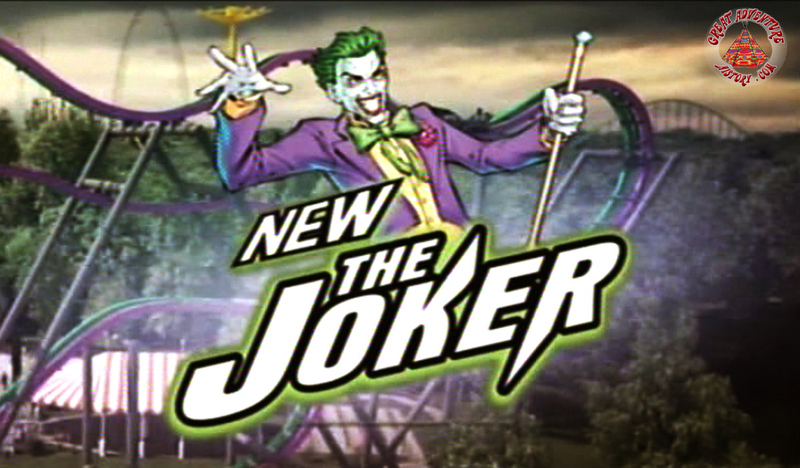 Actually, the whole Lakefront area looked quite different with the removal of the Aqua Stadium and the Great Lake Grandstand, and the addition of The Joker. 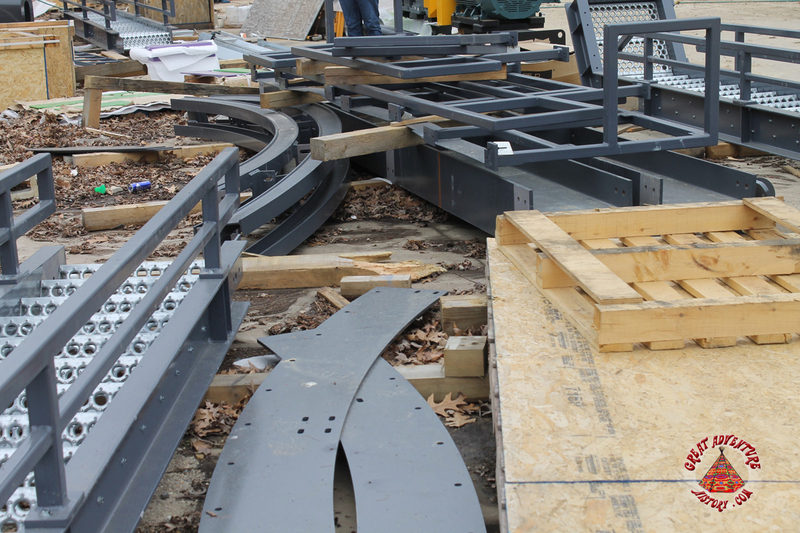 Work continued into May with the parts for the entrance area and queue line arriving like the pieces of a toy model waiting to be assembled. 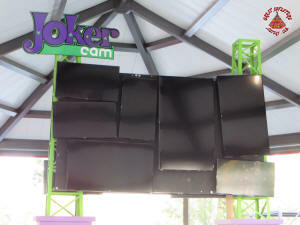 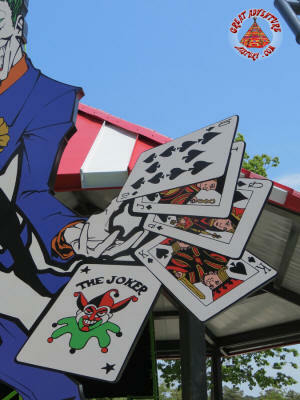 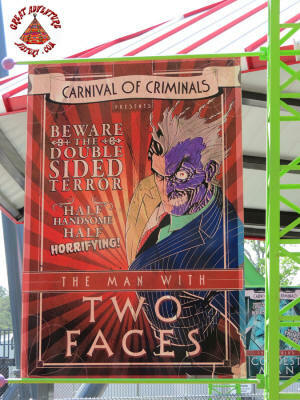 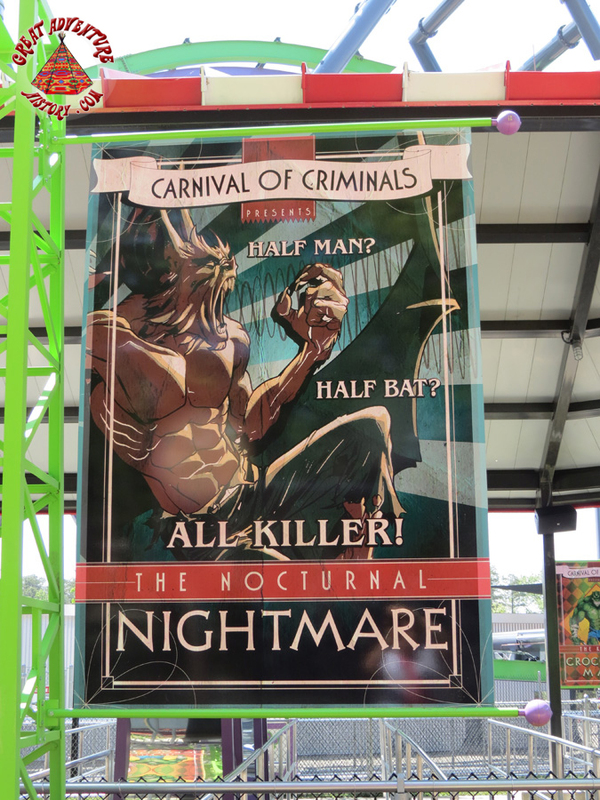 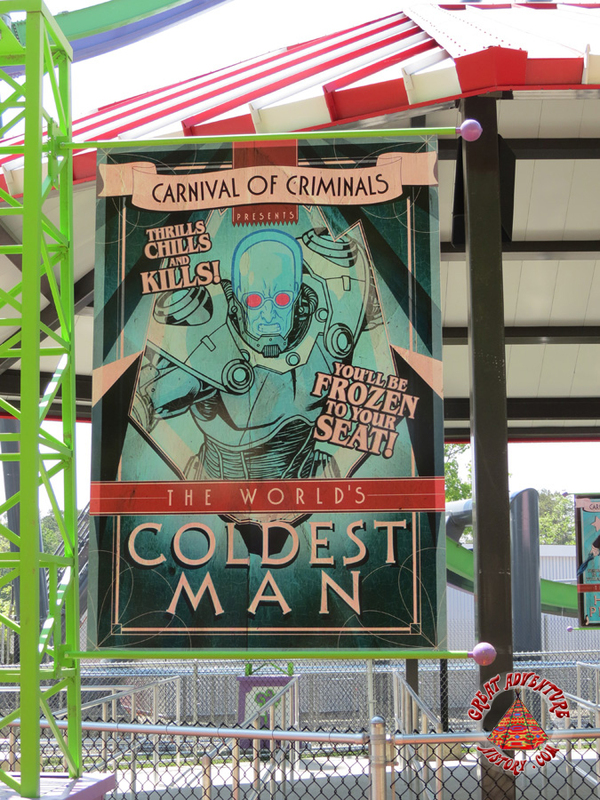 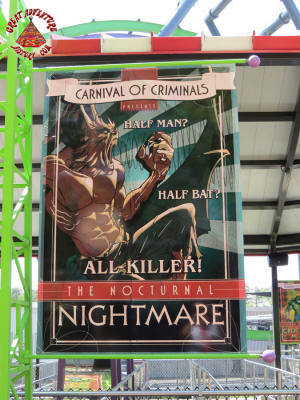 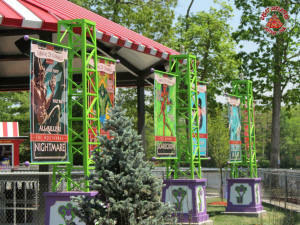 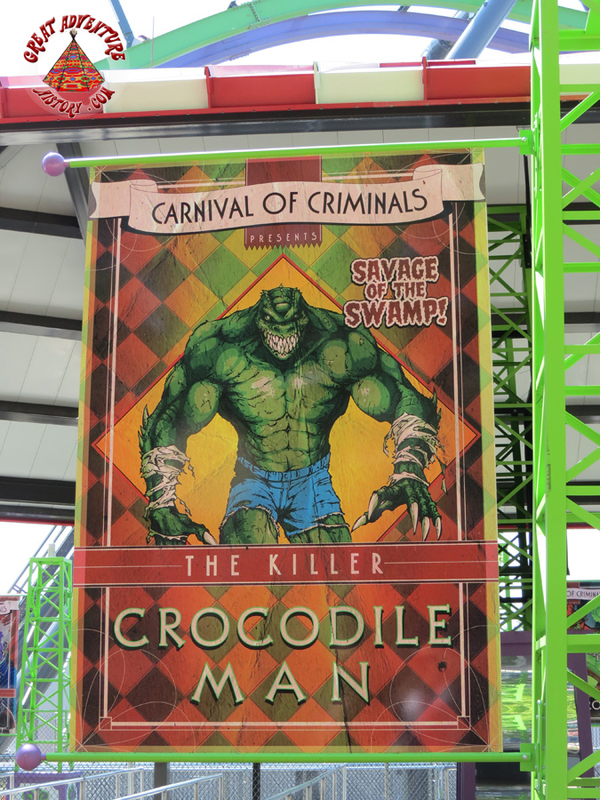 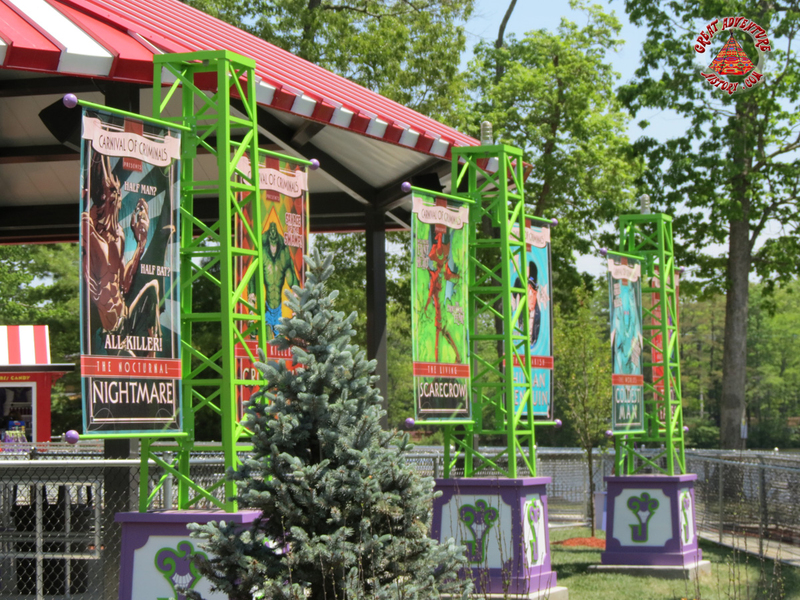 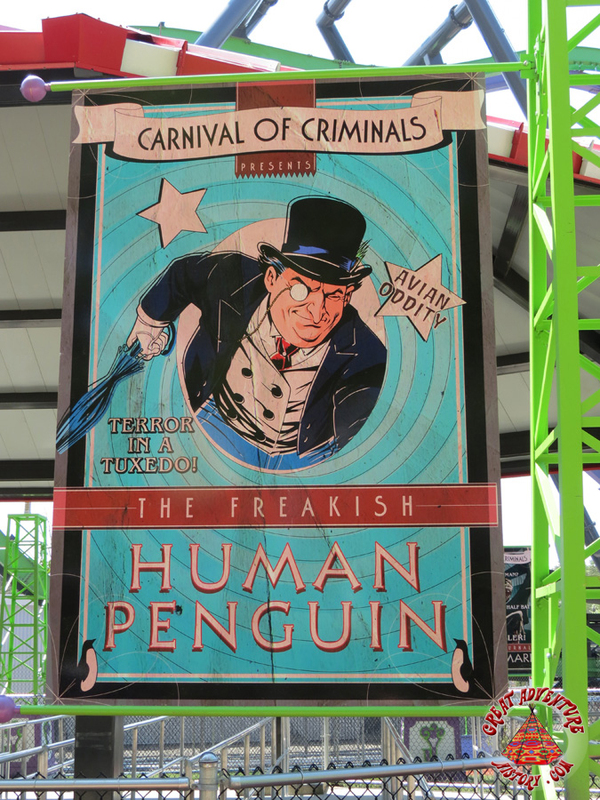 Circus-like advertising posters were accompanied by bright green lattice support columns that would sit atop oversized blocks that featured the Joker's personal logo. 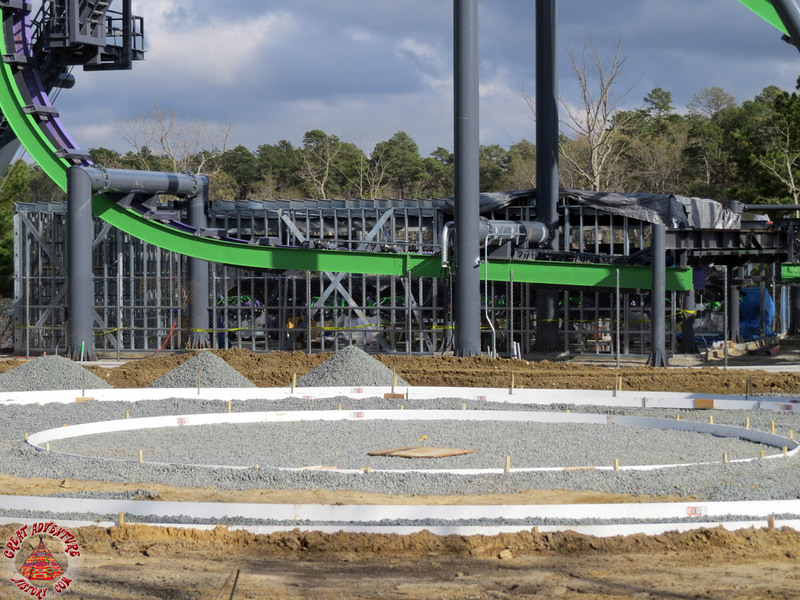 A circular courtyard was positioned in front of the ride which would allow guests to get up close views of the ride in operation, and the ride's vehicle and storage building were in the process of being enclosed. 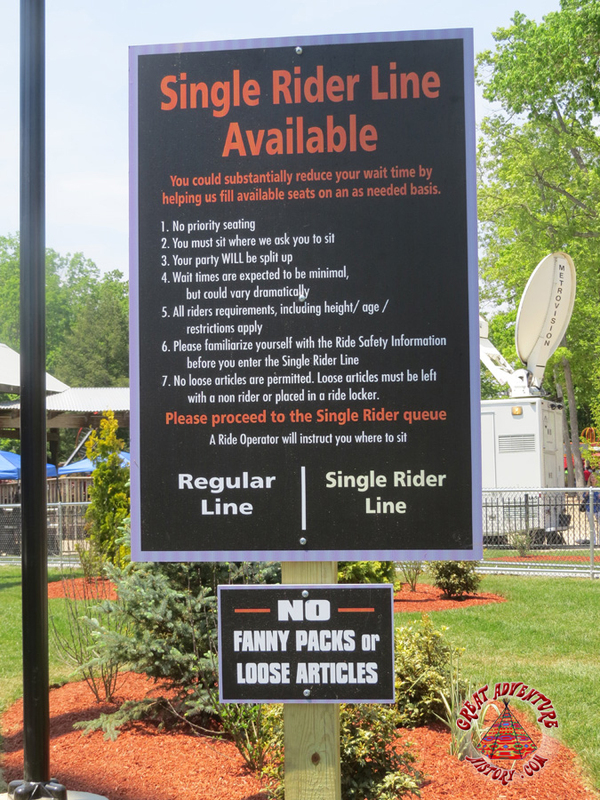 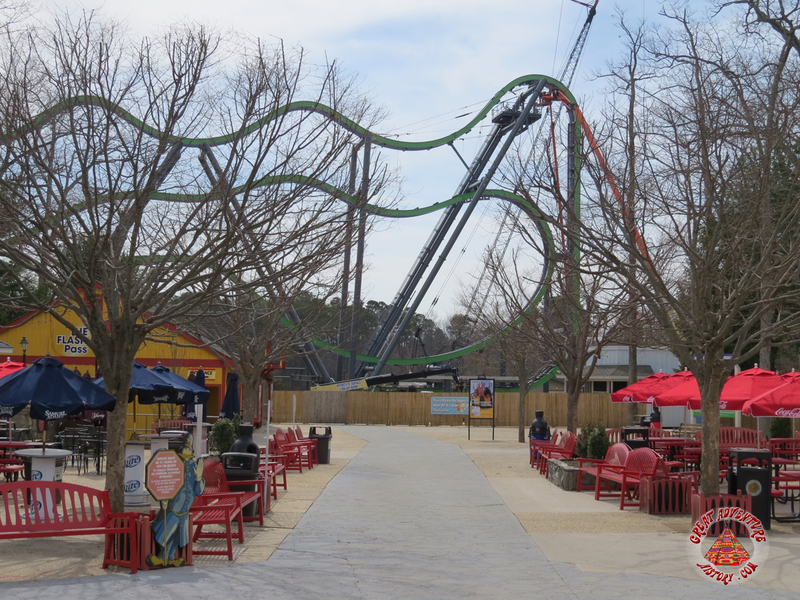 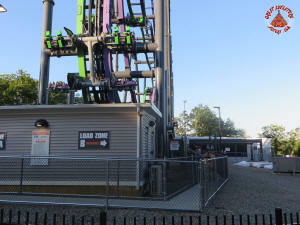 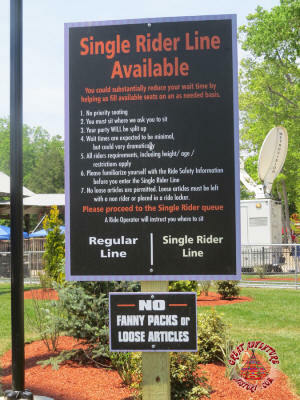 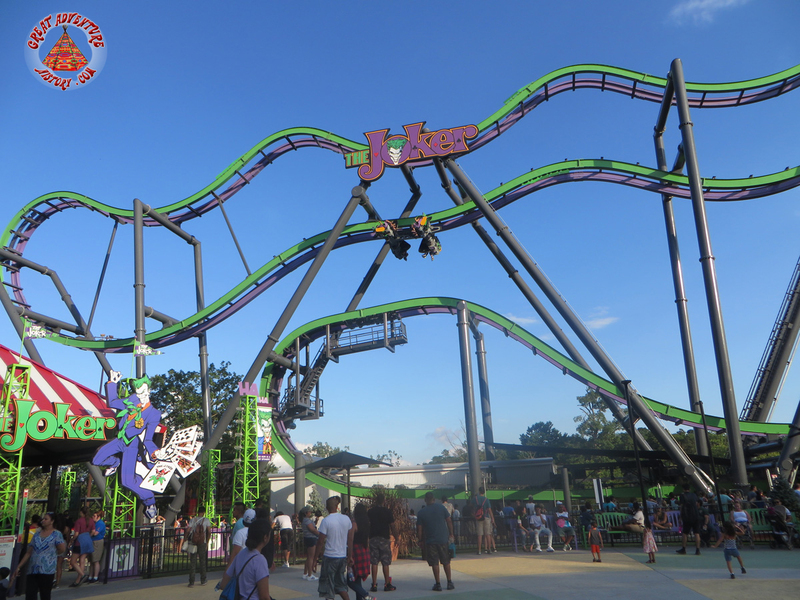 As The Joker ride started its testing and adjustment phase, Black Beard's Lost Treasure Train next to the ride was rebranded as Harley Quinn Crazy Train. 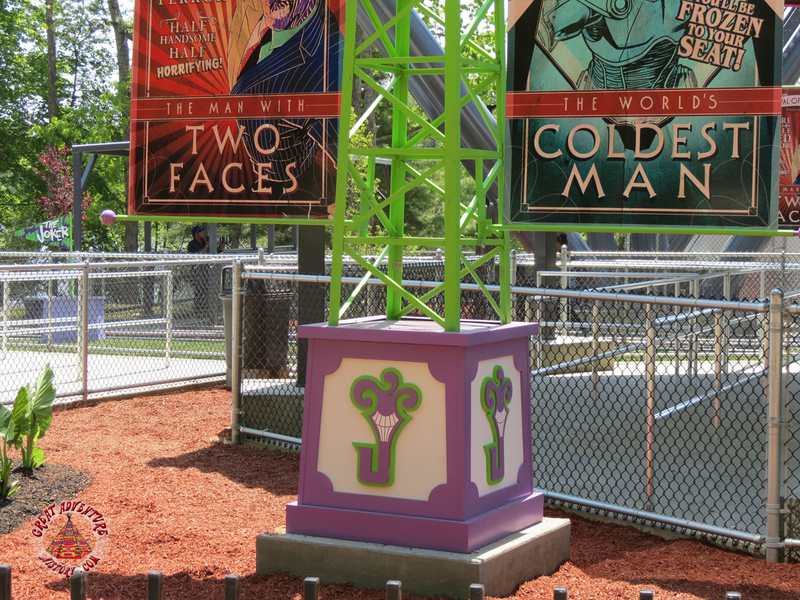 The two rides along with a rethemed snack stand updated to Villain's Cafe would create yet another DC Comics themed area at the park. 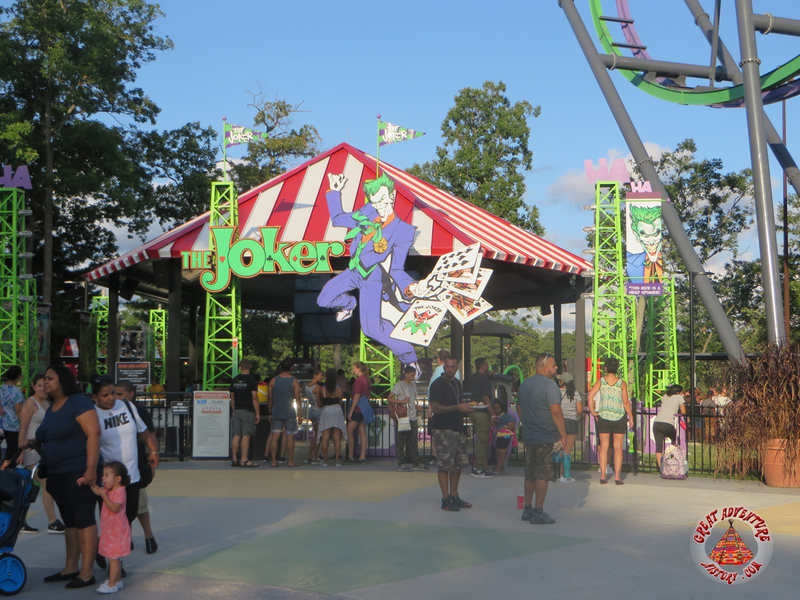 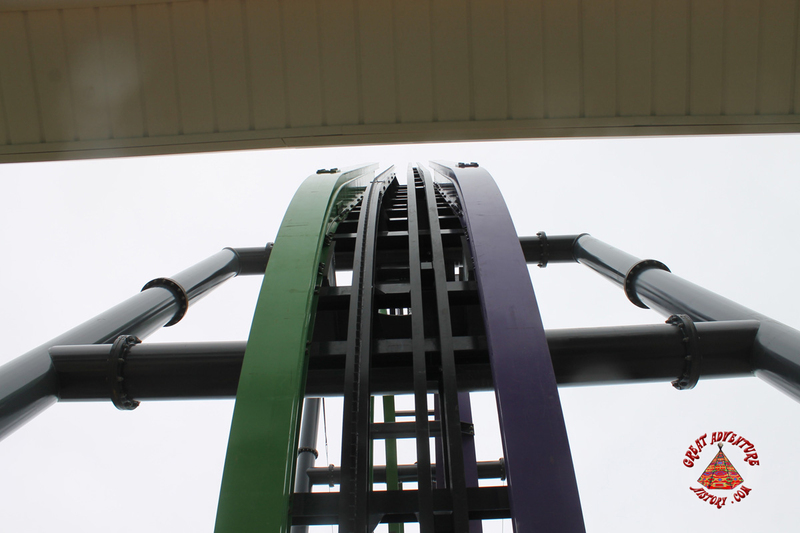 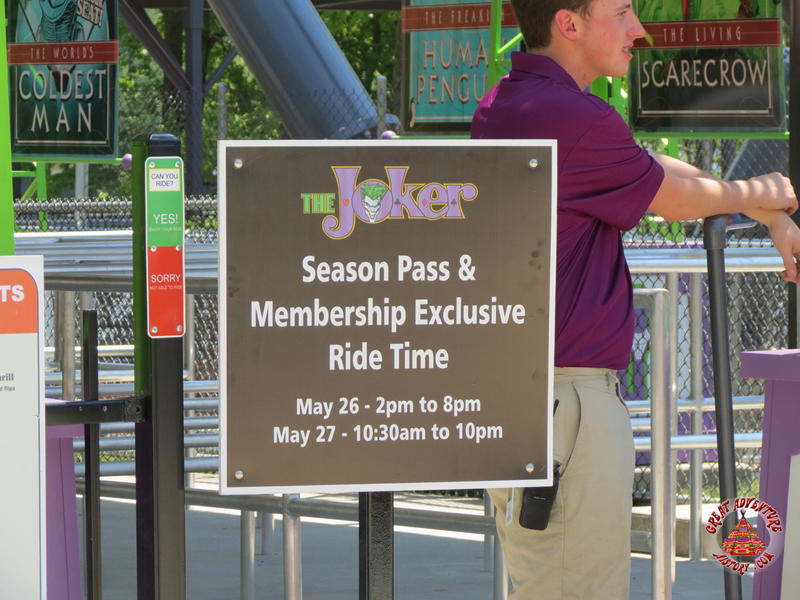 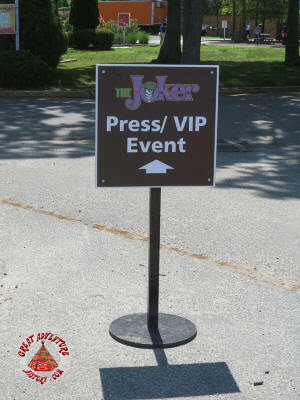 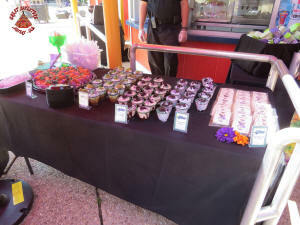 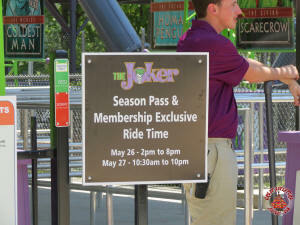 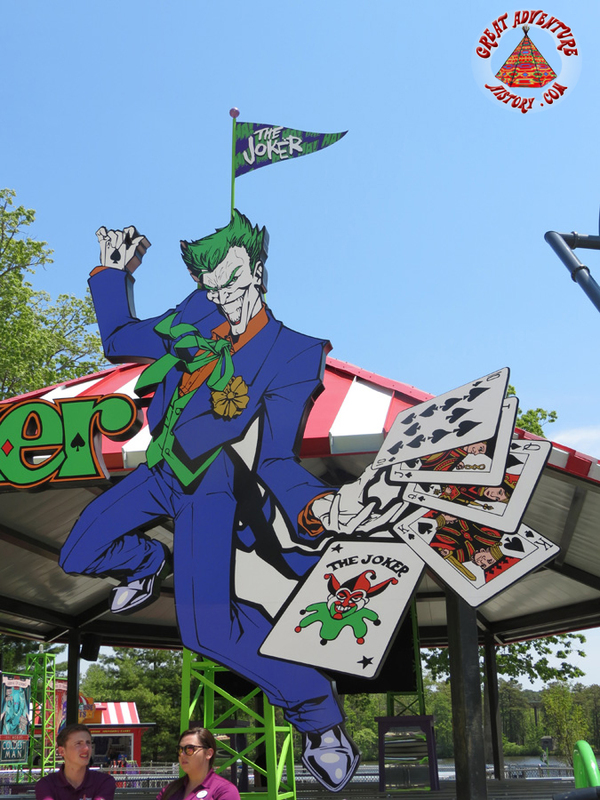 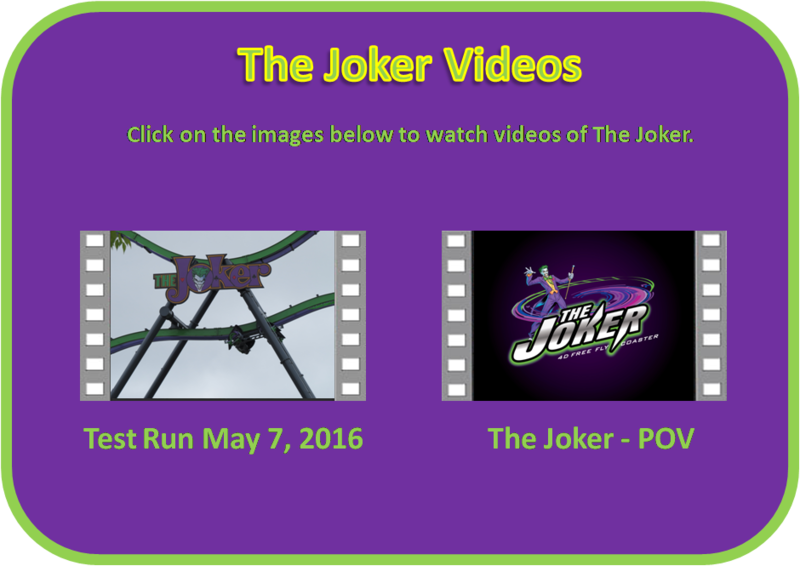 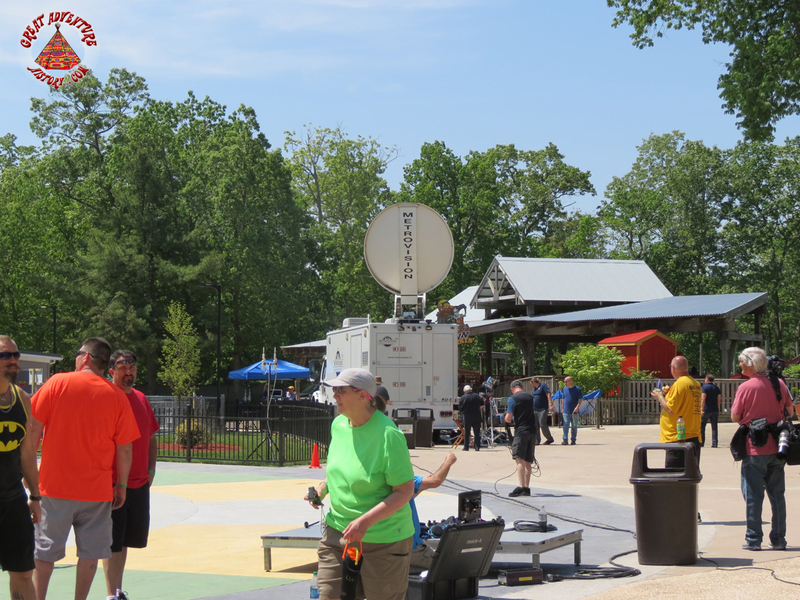 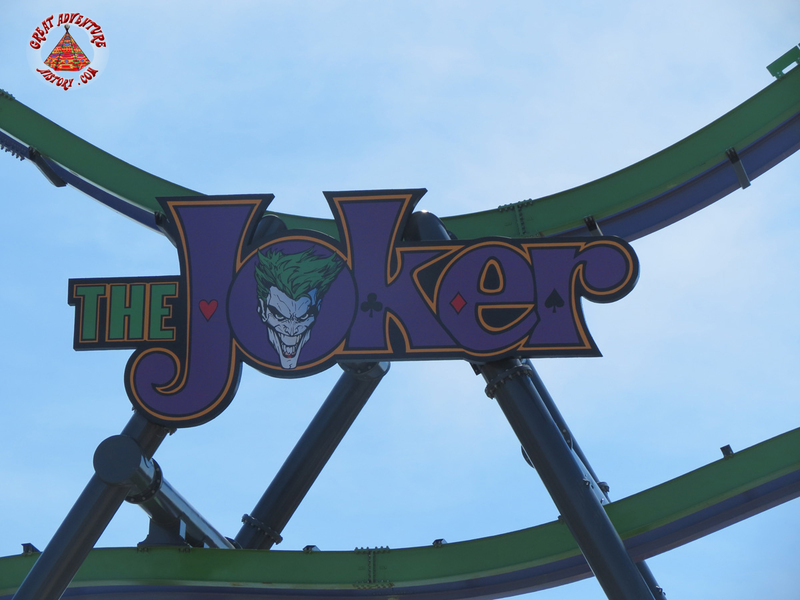 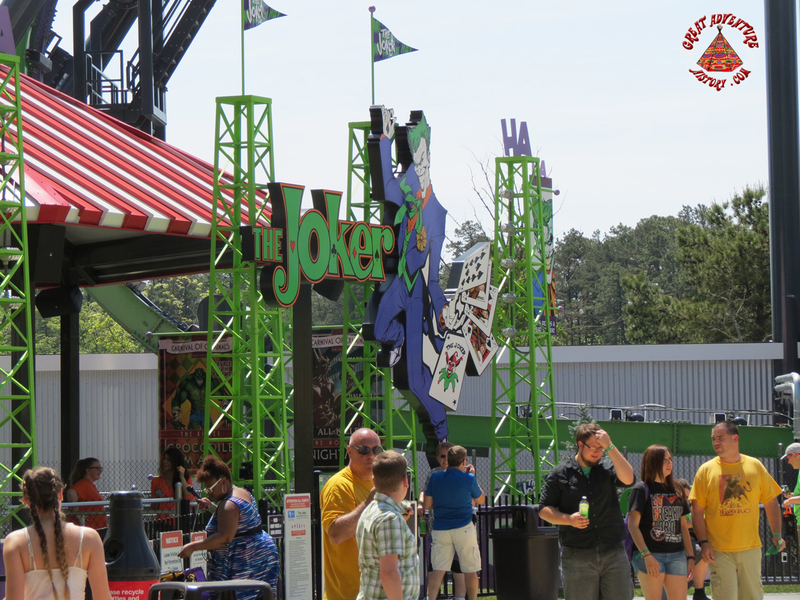 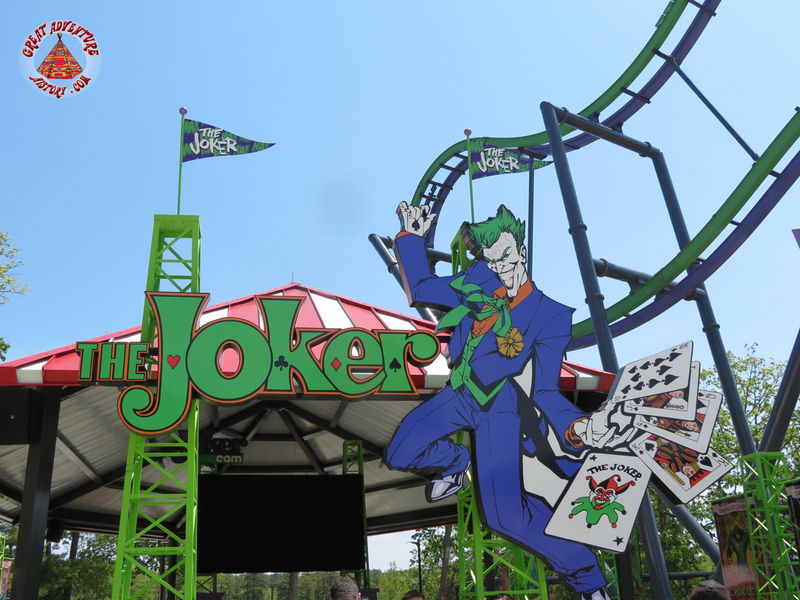 The Joker celebrated its grand opening with a media event held on Thursday, May 26th, 2016. 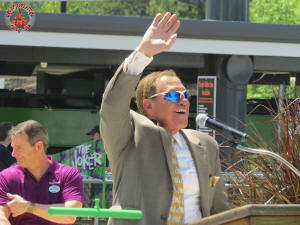 The opening ceremony was hosted by the park along with comedian and joker himself Joe Piscopo who also was a spokesperson for Boys and Girls Clubs in New Jersey. 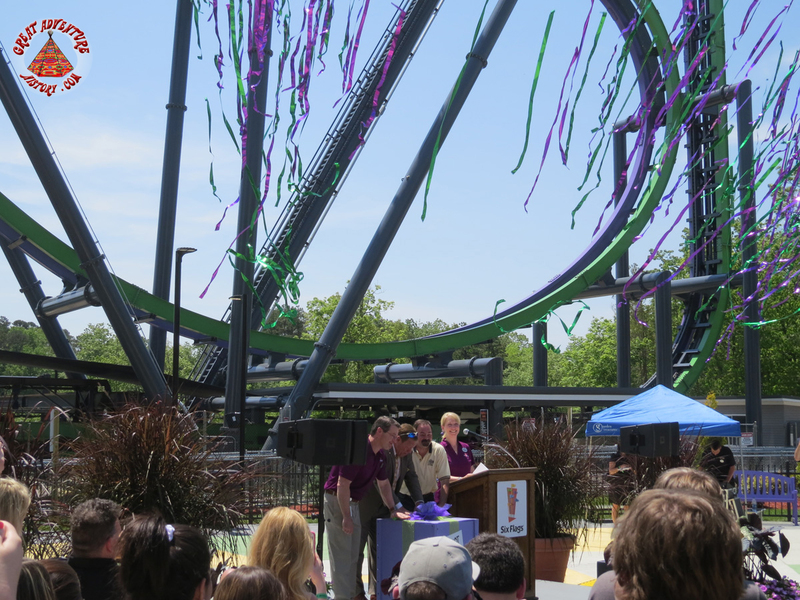 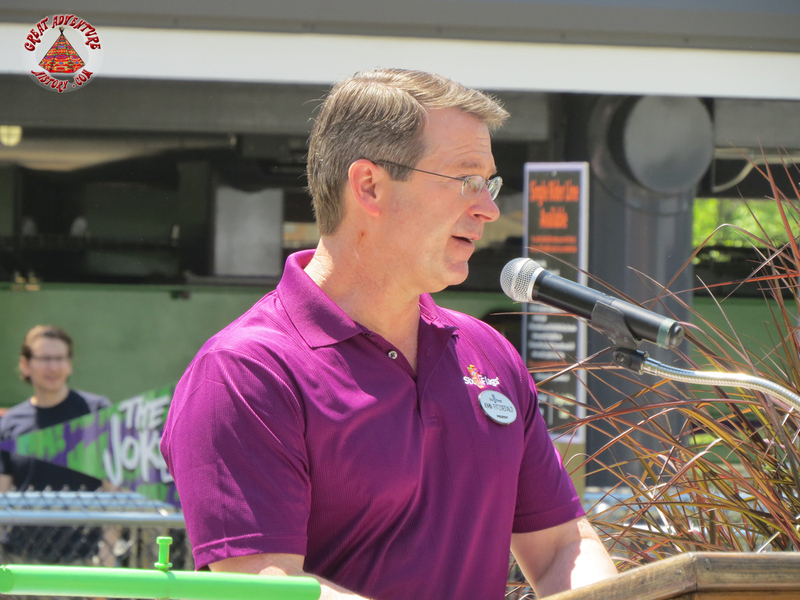 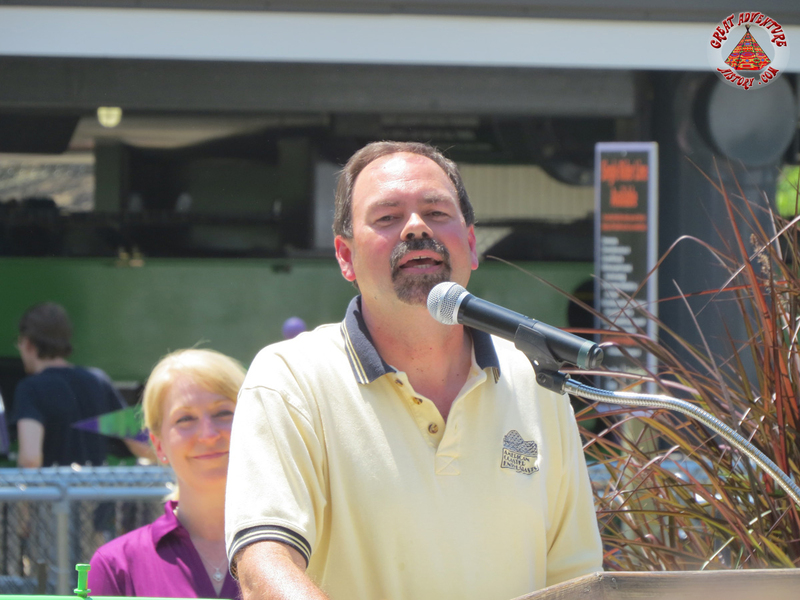 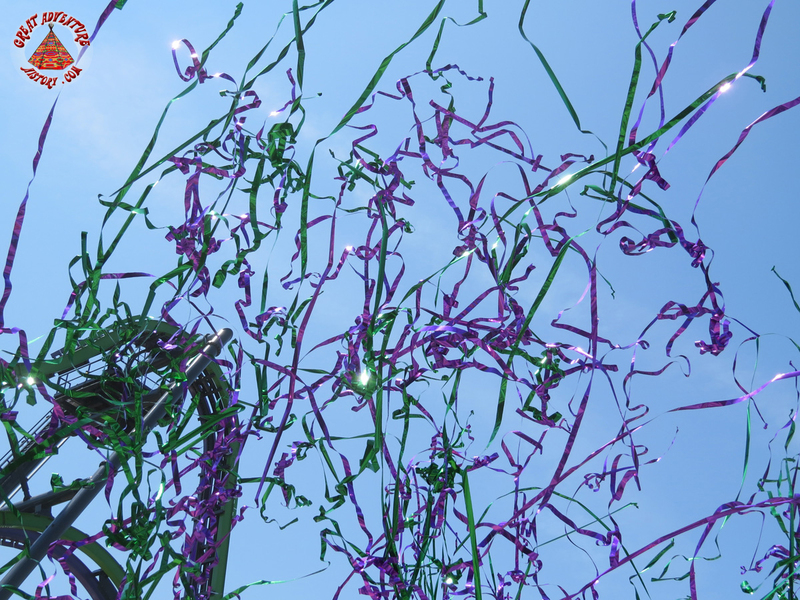 Roller coaster guru Tim Baldwin was also part of the team that pushed the plunger on the Joker's detonator triggering an explosion of confetti and streamers which marked the addition of The Joker coaster to Great Adventure's arsenal of scream machines. 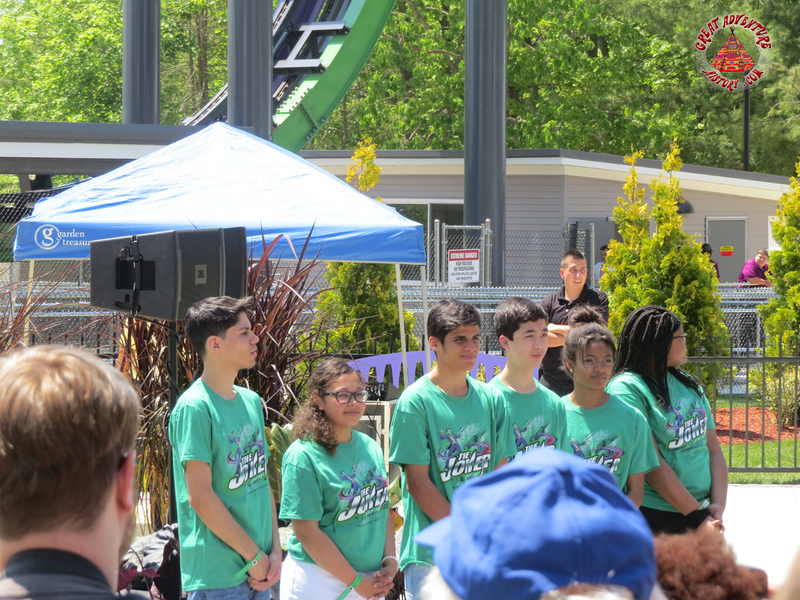 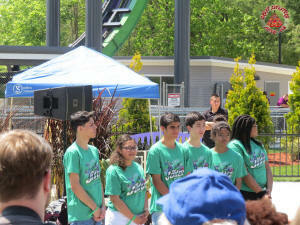 The coaster's opening kicked off Memorial Day weekend, traditionally the start of the summer season and the busiest time of year for theme parks everywhere with the approaching end of the school year. Though the theme elements of the Joker may have been simple, they were quite effective. 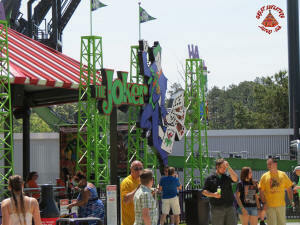 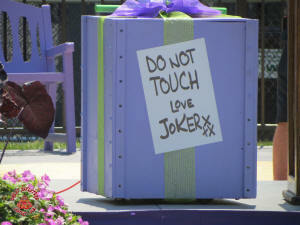 The colors and the props evoked the mayhem of the Joker character. 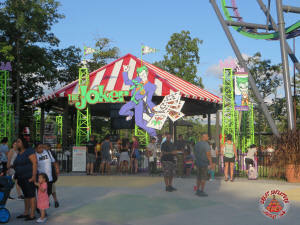 The queue building, resembling a circus tent with other Batman villains on posters as sideshow attractions, as well as a bank of video monitors set the stage for the ride. 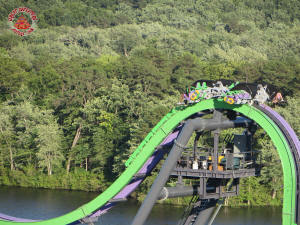 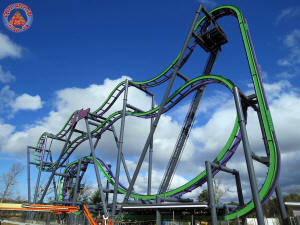 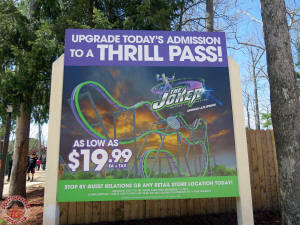 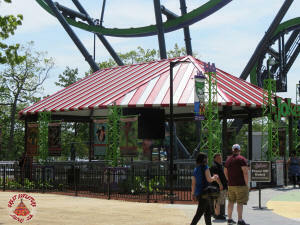 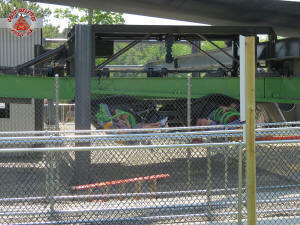 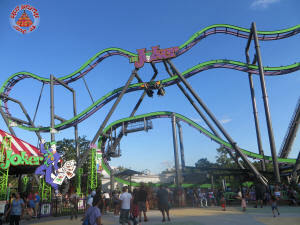 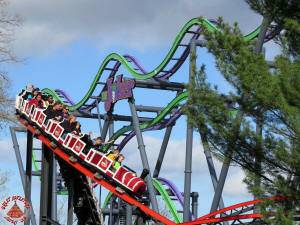 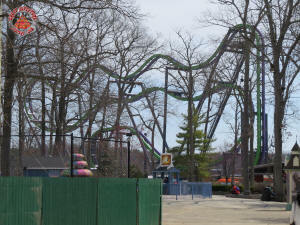 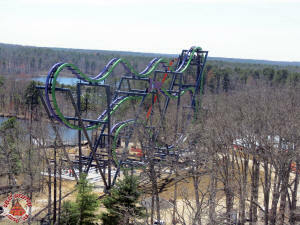 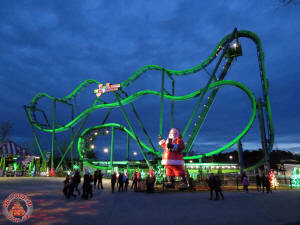 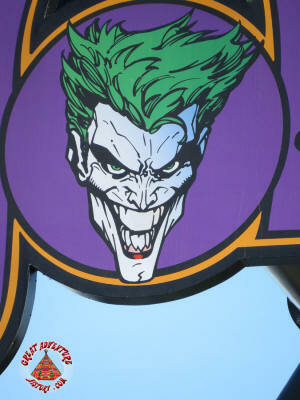 During its first few months of operation, The Joker did not feature any lighting of the ride structure at night. 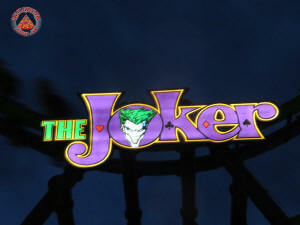 For the most part the ride operated in the dark. In November 2016, the coaster was added to the list of rides operating during the Holiday in the Park event. 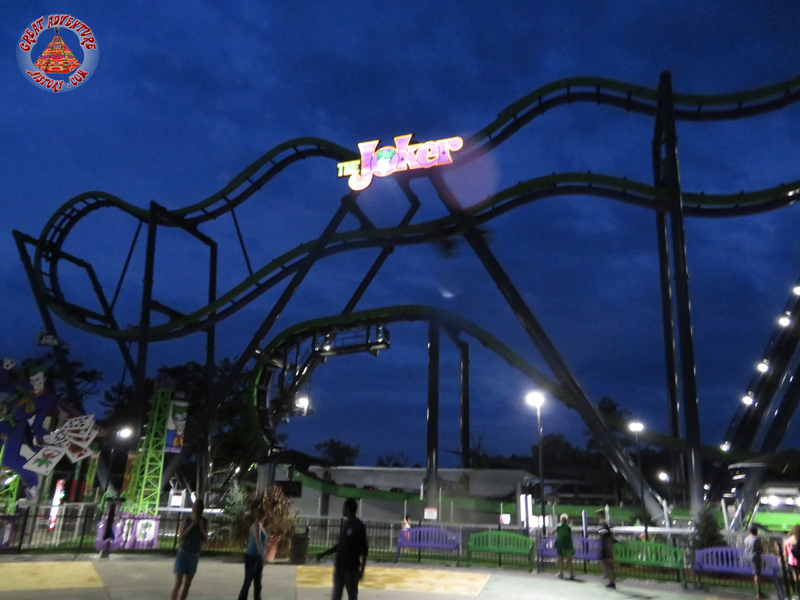 For the occasion, the ride was floodlit in green which really made the ride stand out in the darkness. 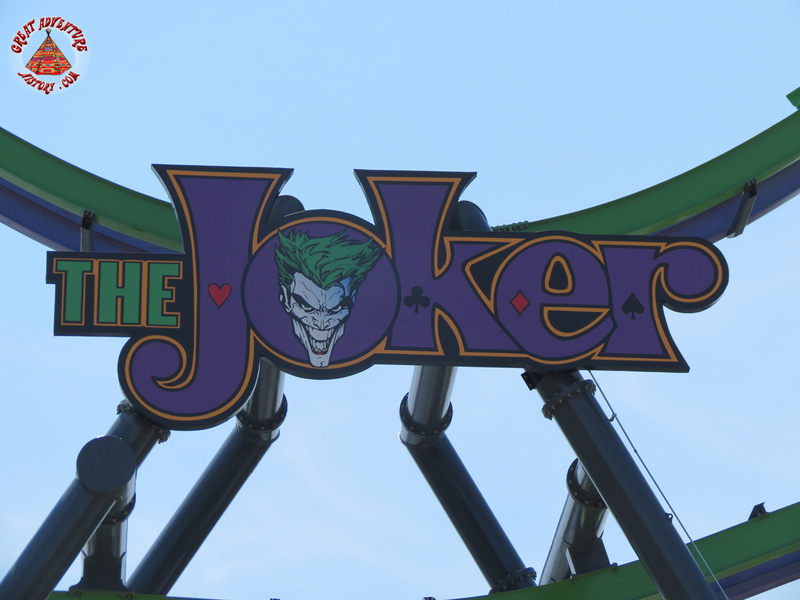 When the ride reopened for the 2017 season and ever since, the lighting has remained at The Joker. By day or night The Joker is quite impressive to watch as the cars tumble from the top of the ride to the bottom, spinning as they go. 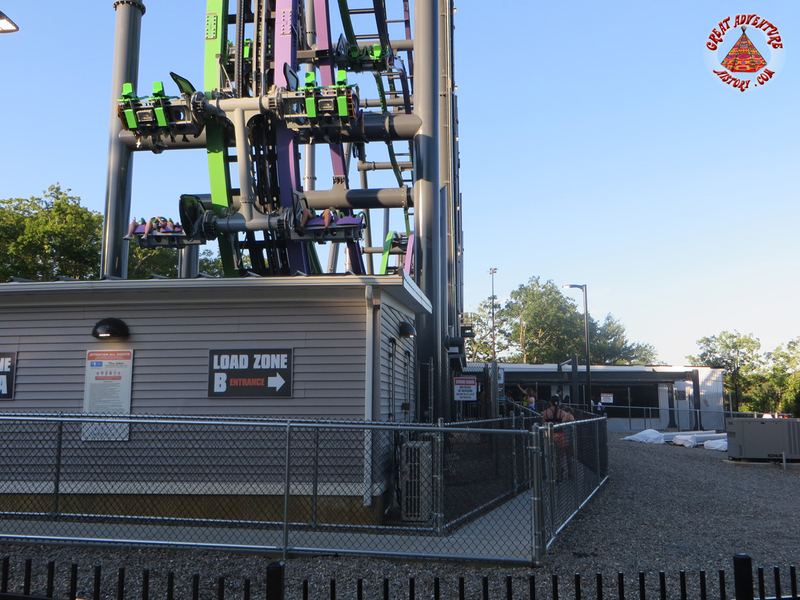 The out of control feeling is something that had never been offered on a roller coaster before the arrival of the ride at Six Flags Great Adventure. 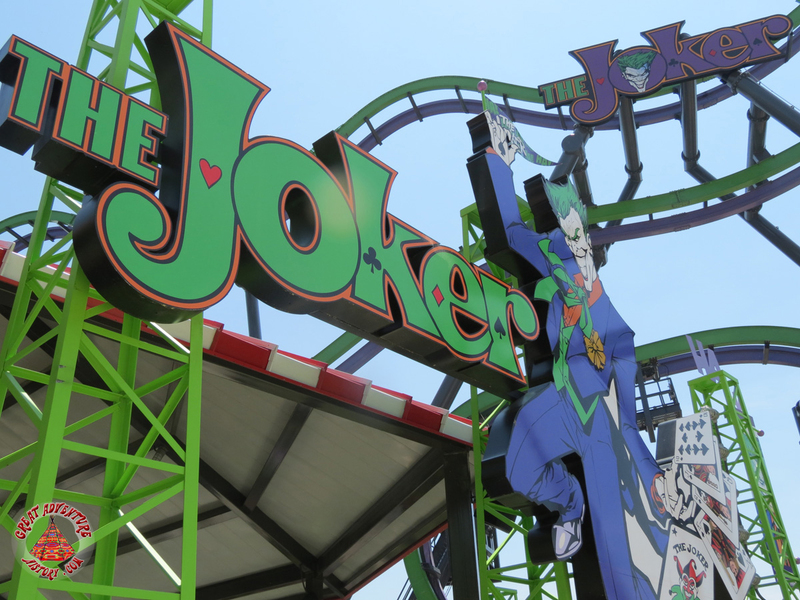 With its crazy antics and unpredictable maneuvers, hopefully The Joker will be wreaking his total mayhem on riders for many years to come.